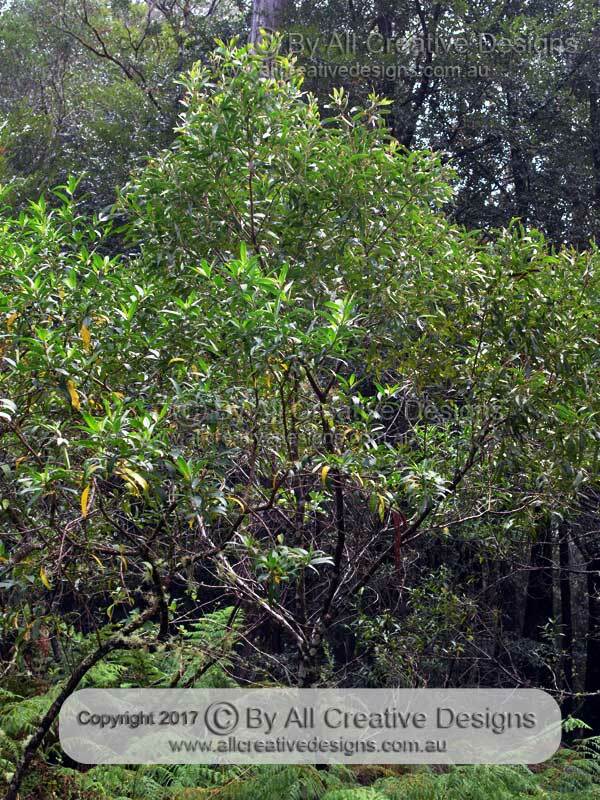 Identification of more than 380 native Australian trees using bark pictures and descriptions for every species listed on our web pages. 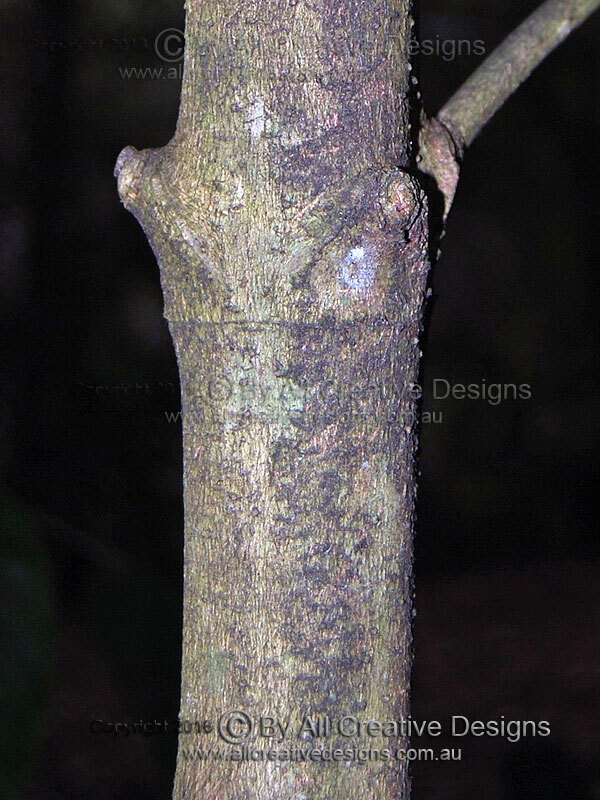 Bark features such as texture, colour and scent play an important role in the identification of native trees. 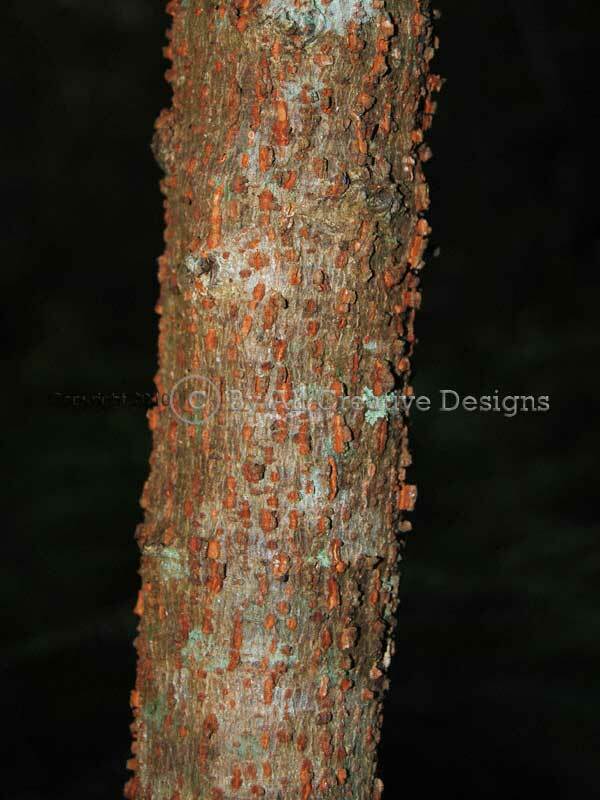 See the Bark Identification Page for more details. 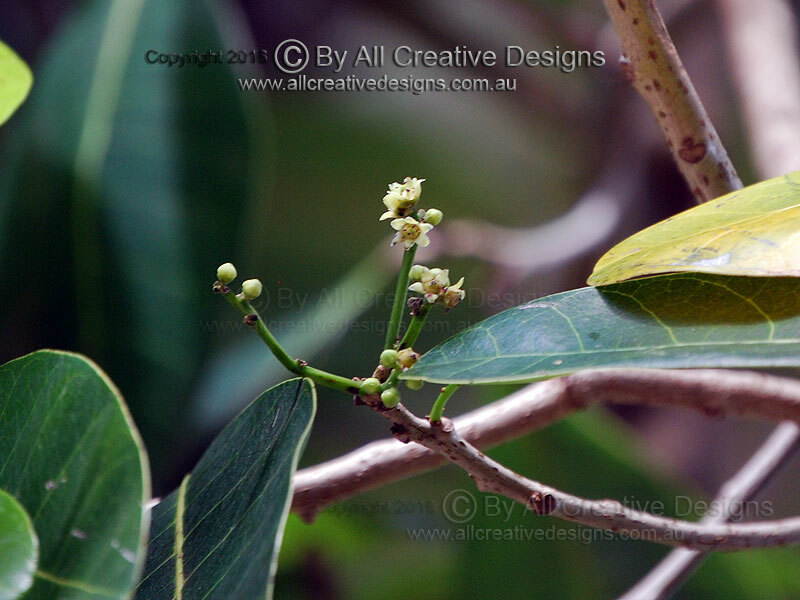 Leaves, habit, flower and/or fruit characteristics are also explained in detail. The natural distribution range and special features useful in classification are given for every specimen. This free resource is constantly extended, revised and updated. 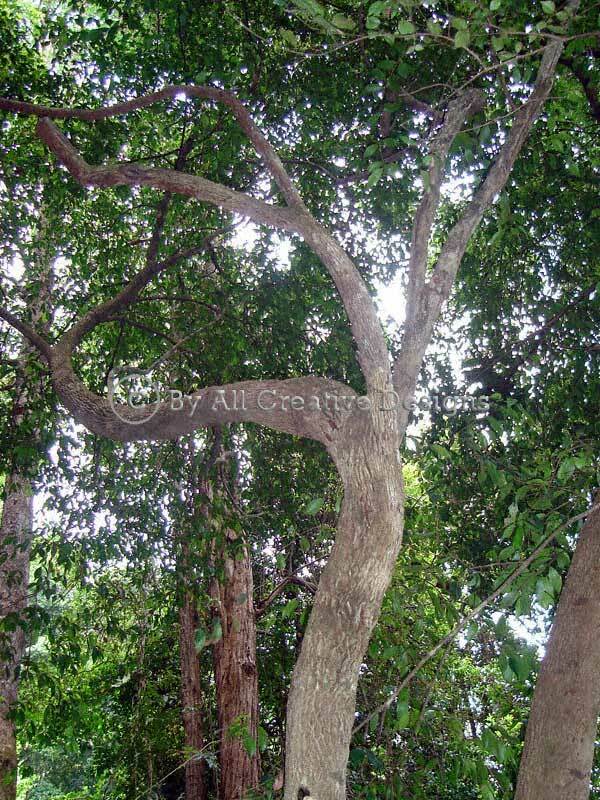 Species in the following genera are listed in groups on our web pages: Australian Fig trees (Ficus spp. 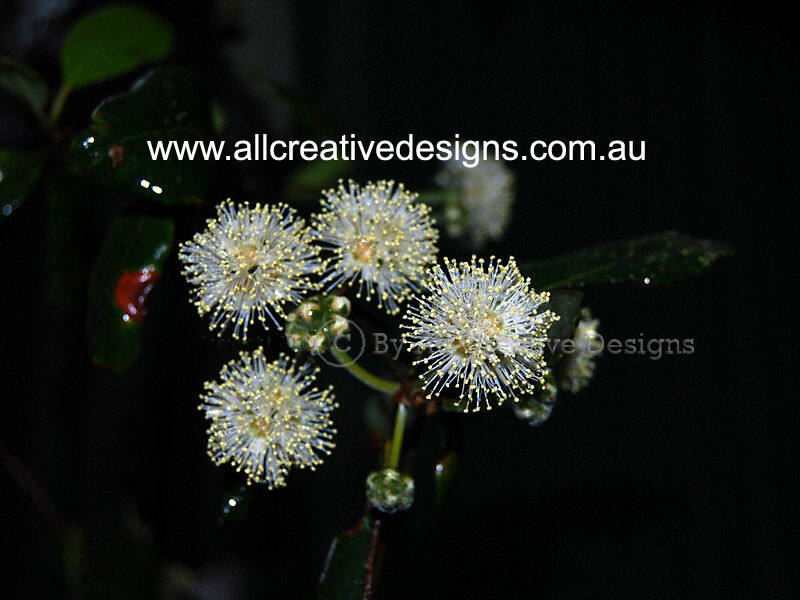 ), Australian Eucalypts (Eucalyptus spp. 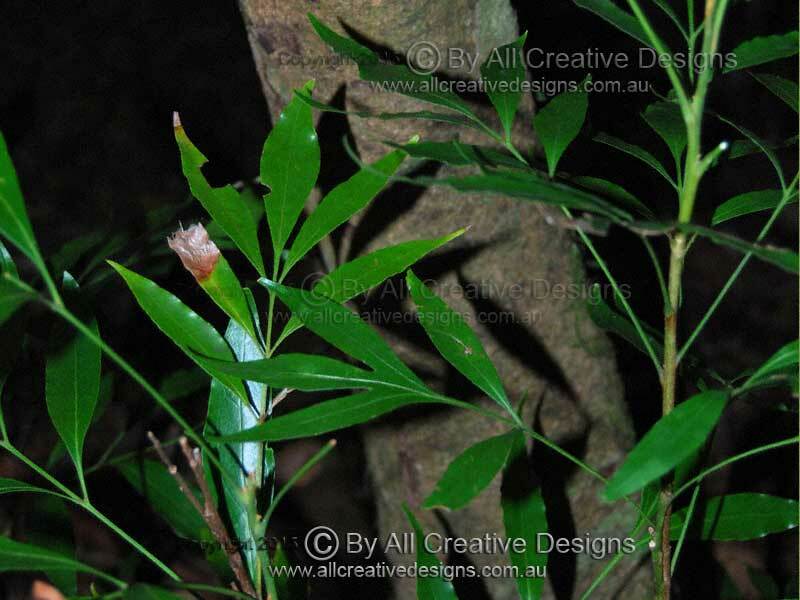 ), Grevilleas (Grevillea spp.) 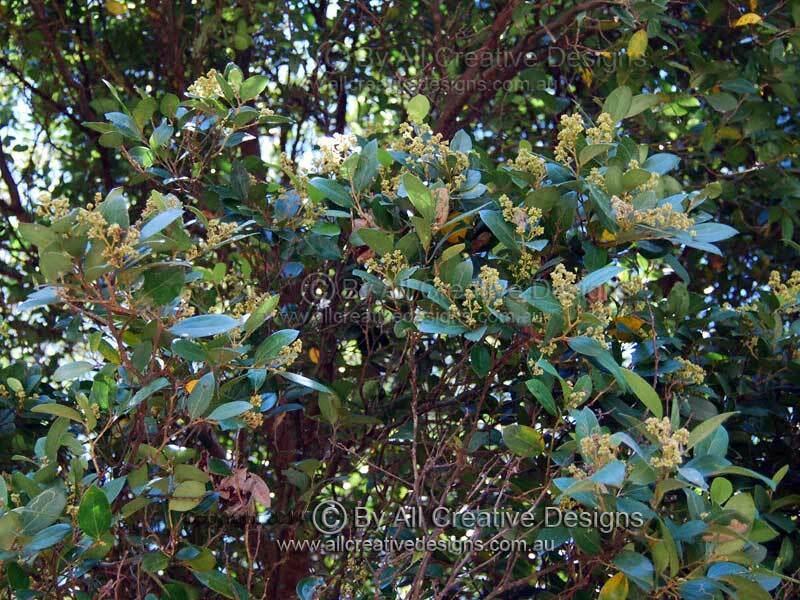 and Lilly Pilly, Satinashes (Syzygium species). 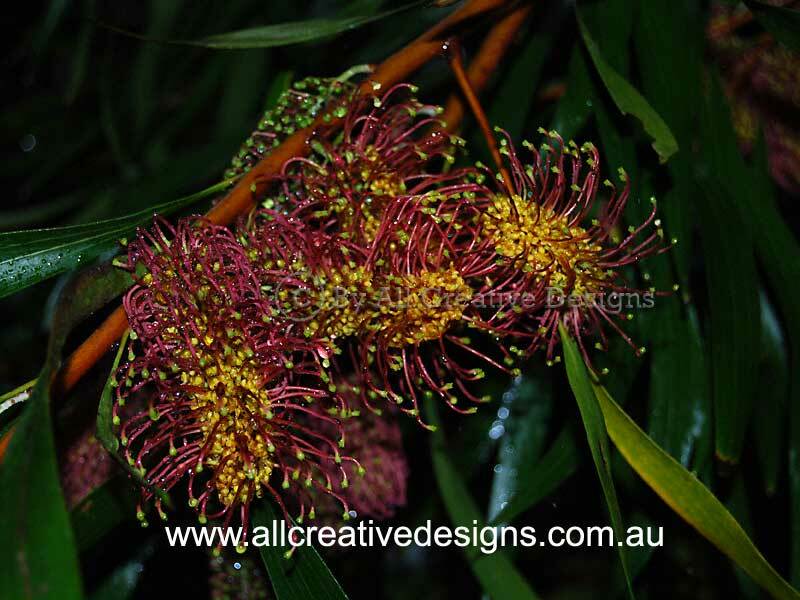 Otherwise all native Australian tree species are listed in alphabetical order by common name. 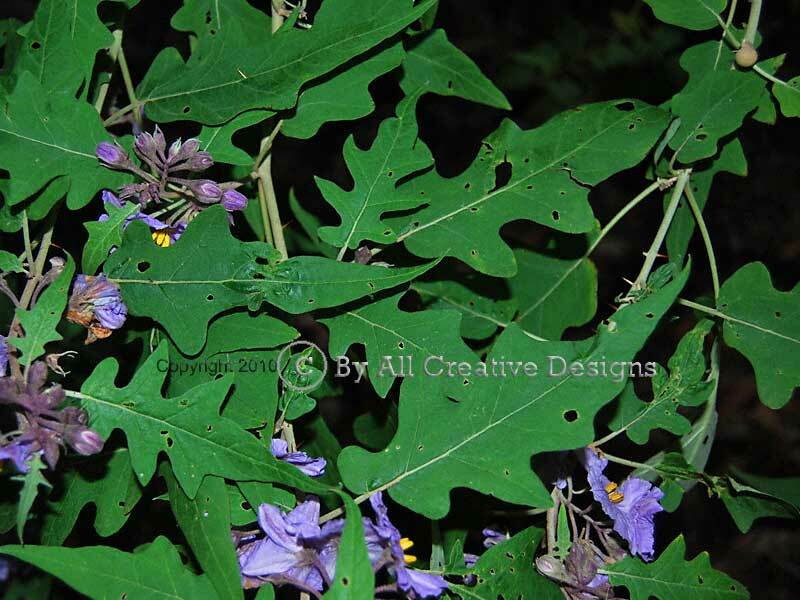 View Common Name Species List or Botanical Species List to locate tree and shrub species. 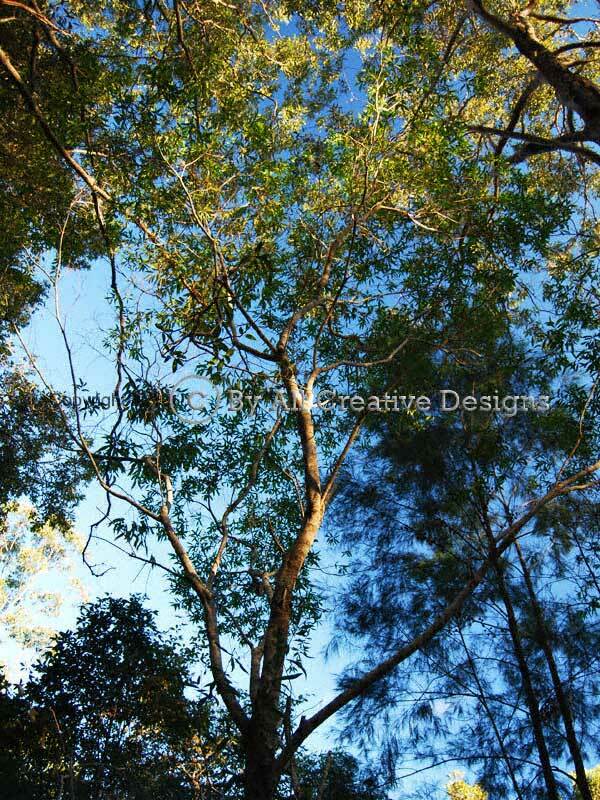 Depending on conditions, the Tall Geebung can be a small tree up to 10m high or an upright shrub and often features a sparsely foliated canopy. 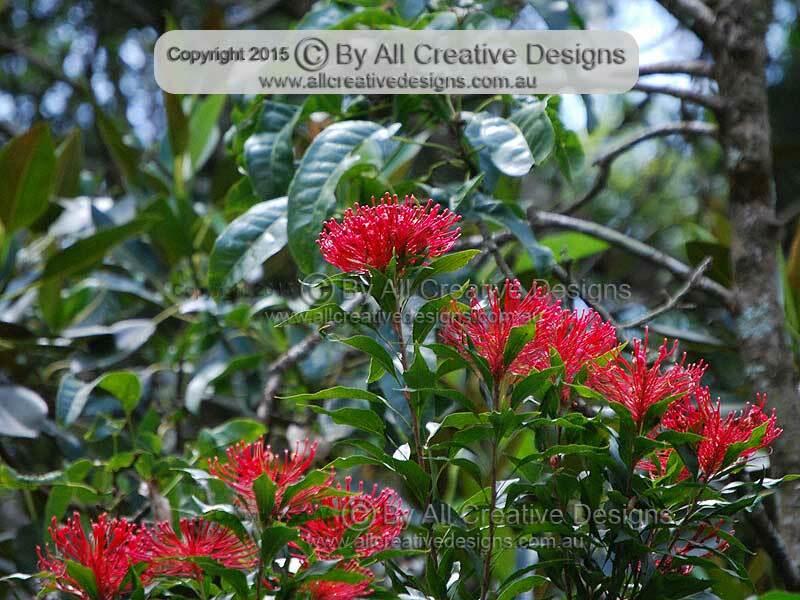 Its habitat ranges from wet tall Eucalypt forests to the margins of rainforests (Images 1). 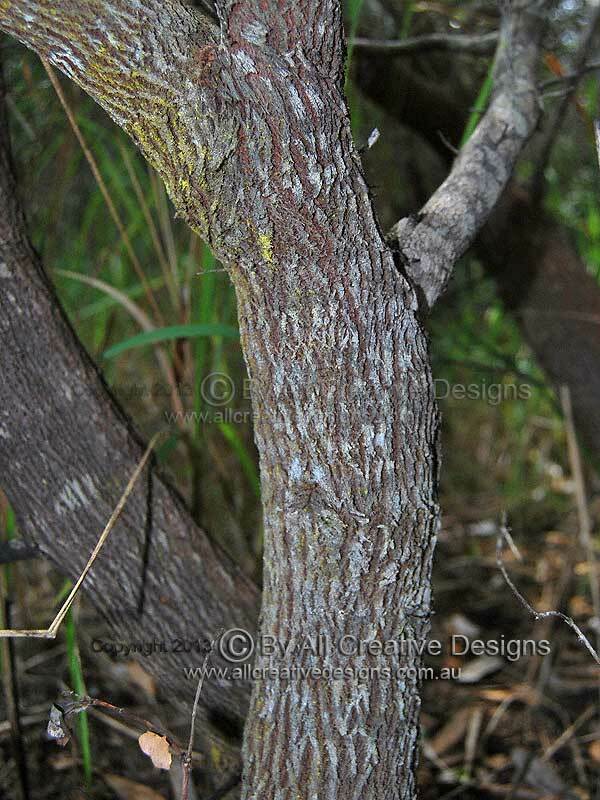 Bark on mature specimens is scaly and fissured, compared to the smoother texture on immature trees. The colour varies from grey to brown and prominent blisters (lenticels) cover the surface on younger stems and branches (2). 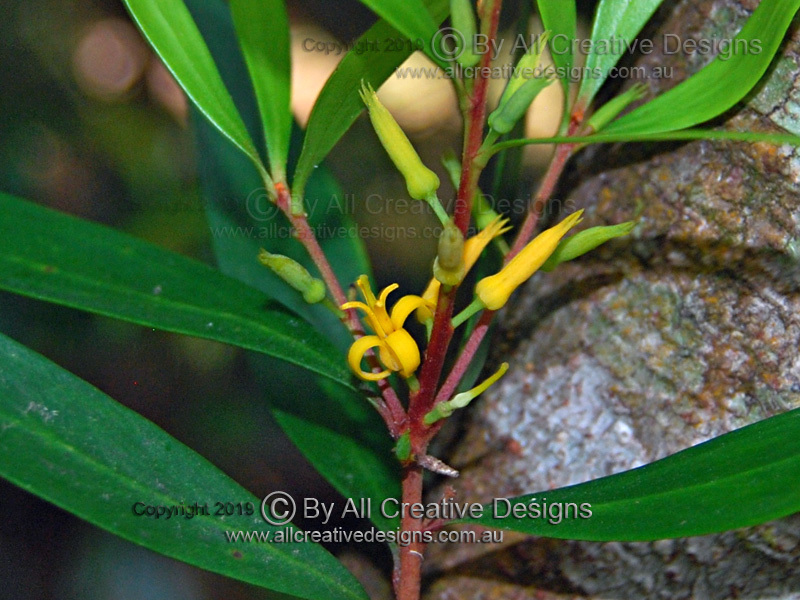 The small yellow flowers are borne on a raceme up to 15cm long. 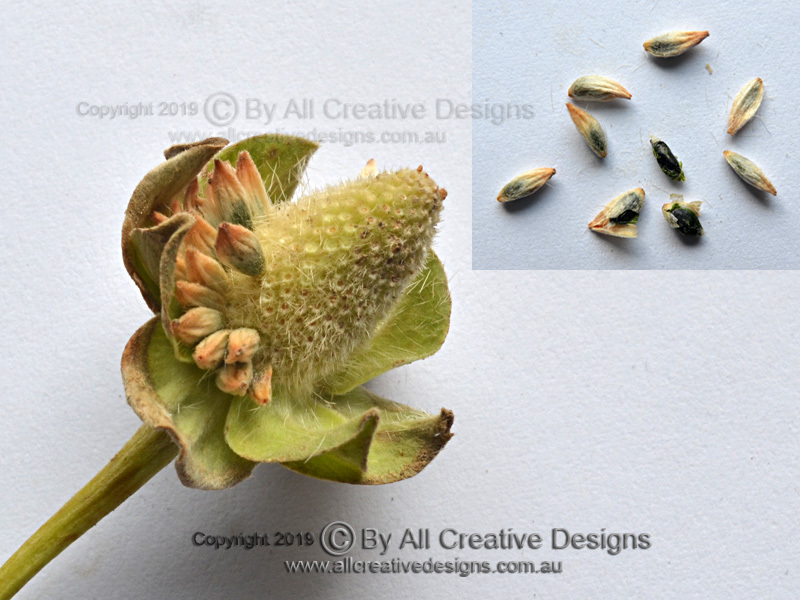 The 4 sepals of the elongated flower buds separate to expose 4 smaller petals and a prominent style in the centre is visible (3). 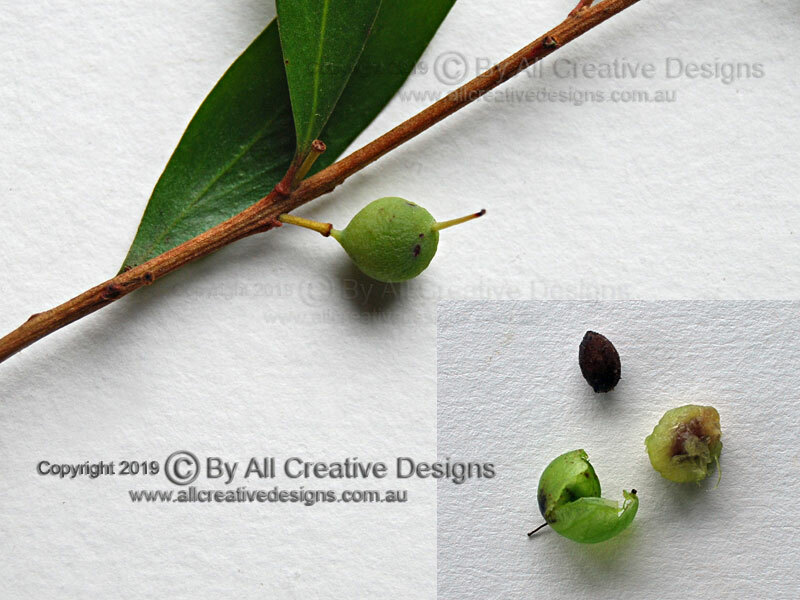 The olive shaped (ovoid) fruit, a fleshy drupe, is up to 15mm long and green yellowish in colour when fully ripe. It features a persistent flower style at the apex. 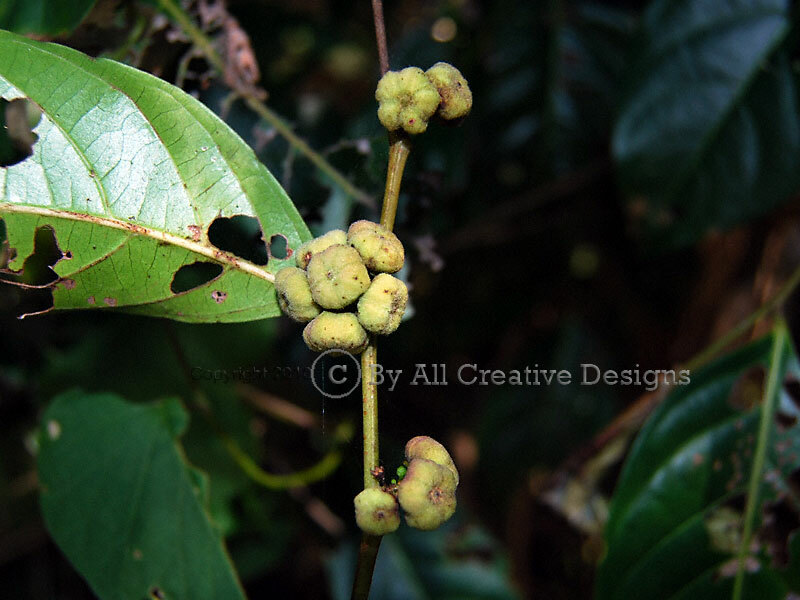 The drupe contains a single pale brown and hard-shelled seed. The fruit flesh will congeal and get very sticky upon exposure to the air (4). 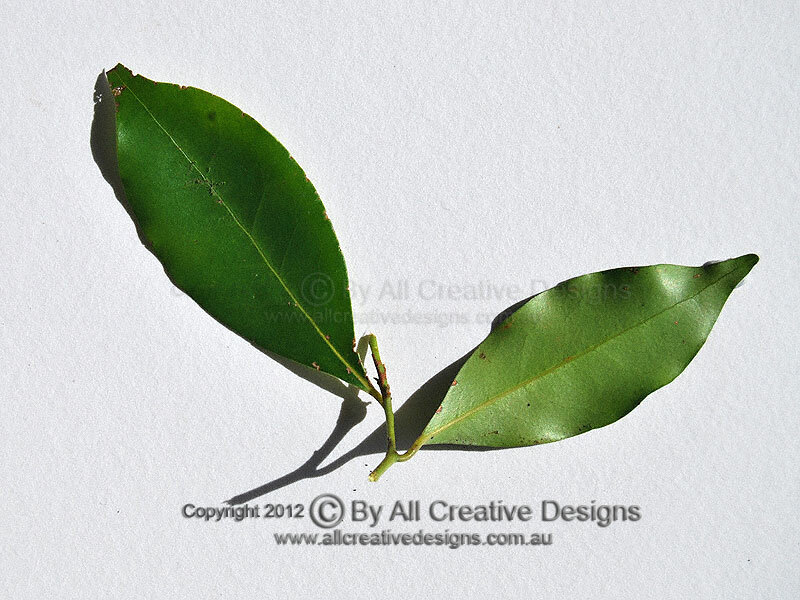 Simple alternate leaves are; up to 10cm long, mostly elliptic in shape with entire margins, hairless, medium glossy on top, lighter dull green beneath, fairly thin but firm. Venation is very faint especially on lower leaf surface, but mid vein and steep angled laterals are visible on the upper surface (5). Distribution: From NSW central coast to southern Qld. 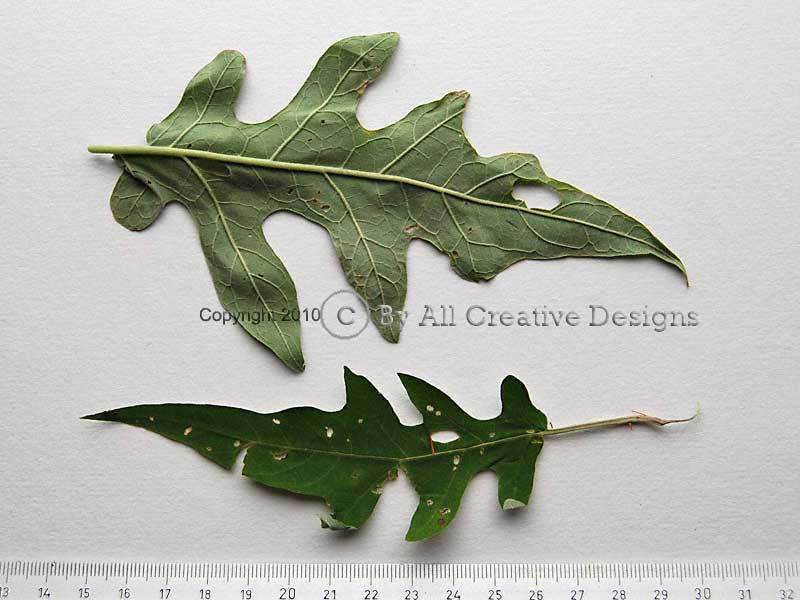 See Leaf Characteristics Page for explanations of terms used. 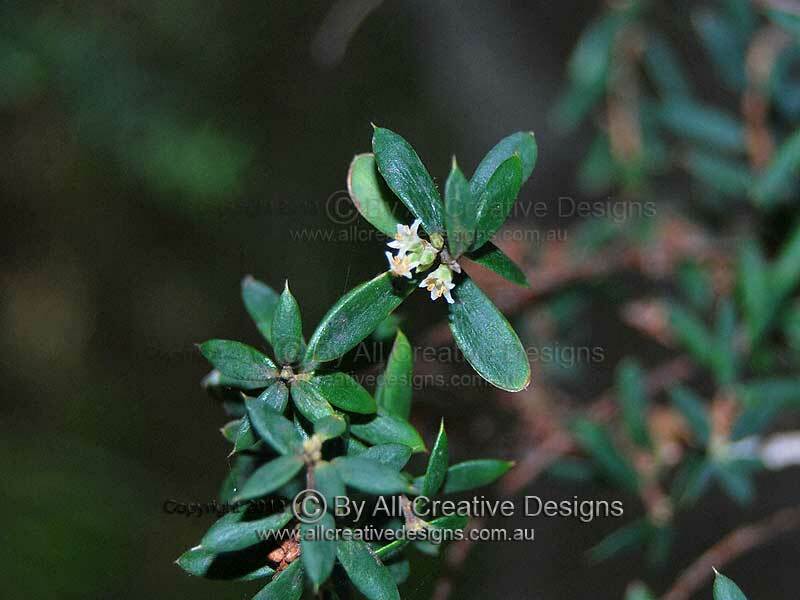 This native shrub is a subspecies of the more widespread Pimelea ligustrina and prefers a moist habitat within cooler types of rainforests at higher altitudes. It can reach a height of up to 3m and is mostly single stemmed. 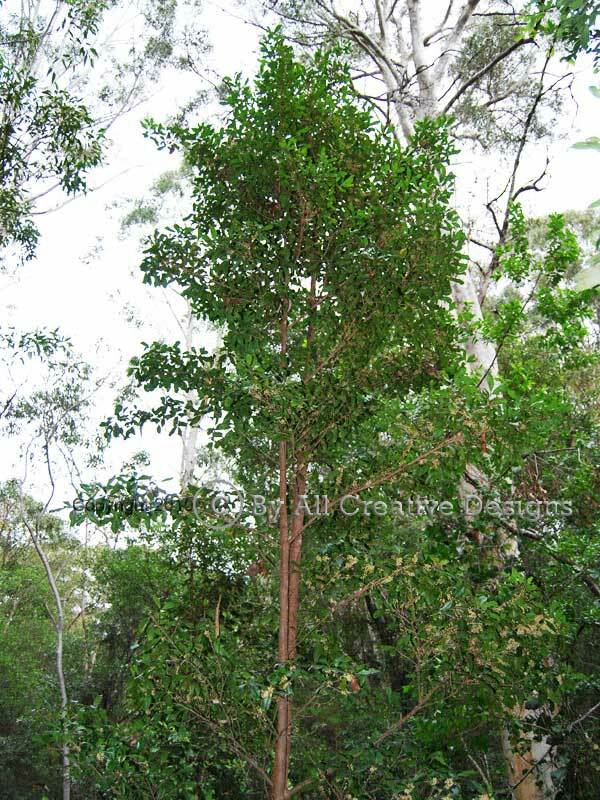 The specimen shown is growing at a height of 950m in New England National Park (Image 1). Bark is olive-brown in colour with a very firm, tough texture and shows small longitudinal ridges (2). White flower heads are surrounded by bracts (leaf-like structures of an inflorescence), which are covered in fine silky hair. 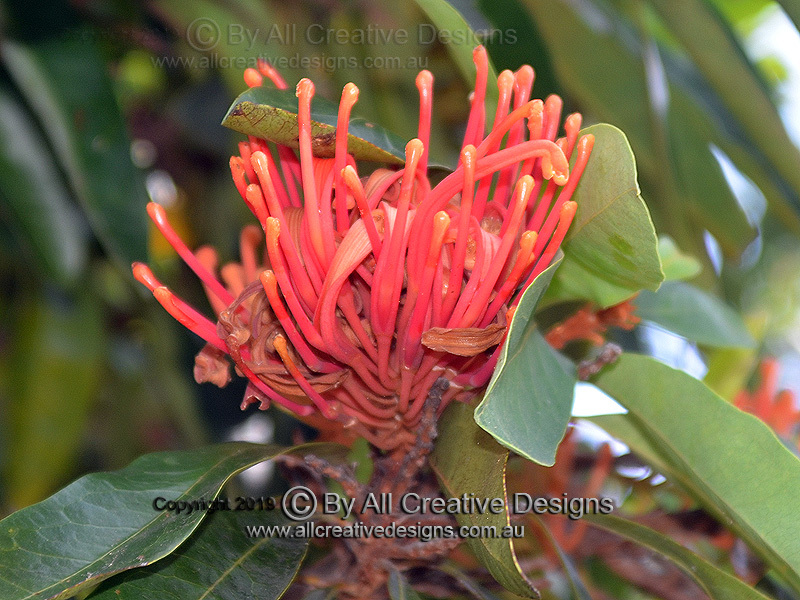 Flower heads are up to 2cm long, 1.5cm across and can consist of more than 100 individual flowers. The developing ovoid shaped fruit can be seen on the right hand side of the flower head (Images 3 & 4). 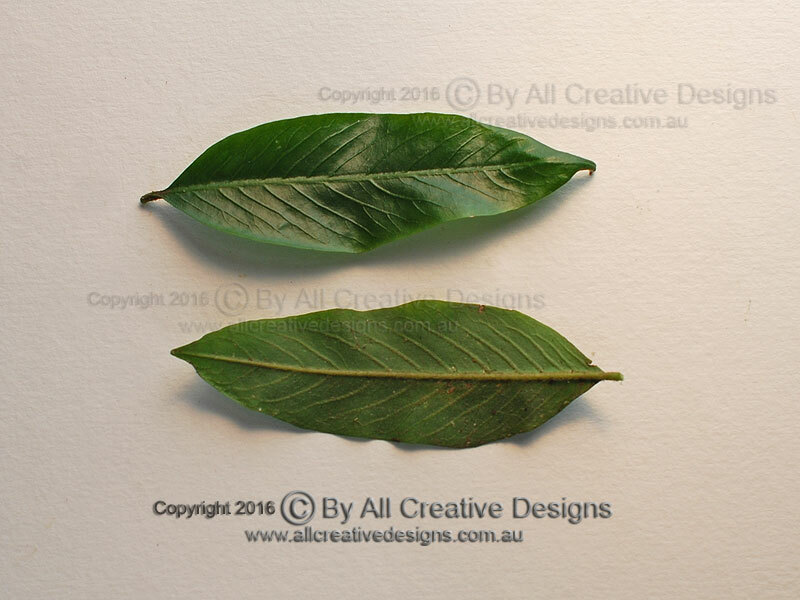 Simple leaves with an evenly spaced opposite arrangement are; up to 8cm long, mostly oblanceolate (reverse lance-shaped) with entire margins, hairless (mature), dark green above, whitish-green below, rather thick with a soft texture. Leaf apex is acute, base shape is cuneate. Petiole (leaf stalk) is very short but fleshy and swollen. Leaf venation is more conspicuous on lower surface. Distribution: NSW south to north coast, on the Great Divide at higher altitudes. 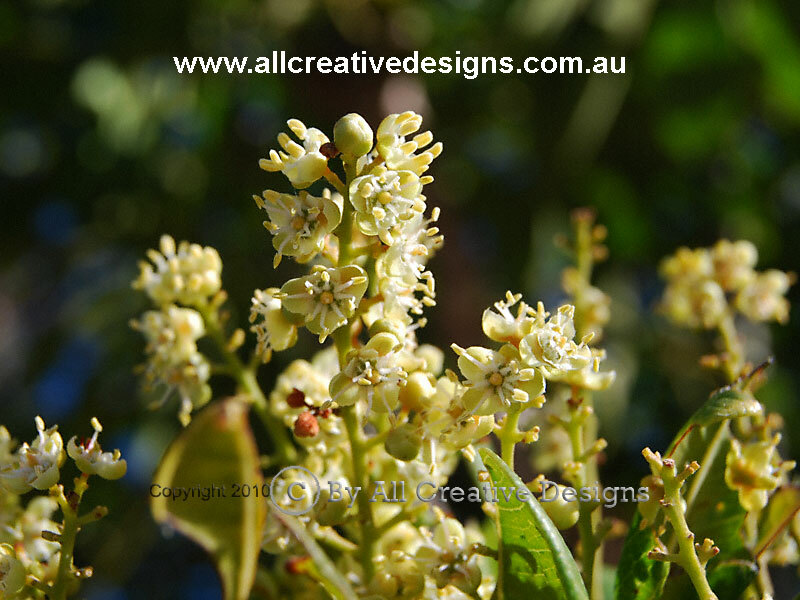 This native shrub can under suitable conditions grow into a small tree up to 8m tall and is easily identified by its pungent odour. 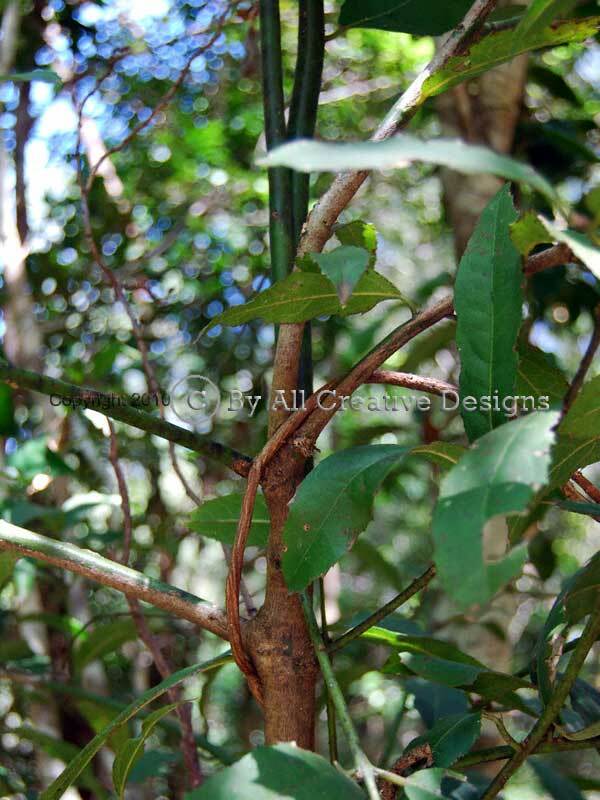 It is commonly found as an understorey species in moist Eucalyptus dominated forests (wet sclerophyll forests) and on margins of different rainforest types (Image 1). Bark is olive green to a light brown on mature specimens, firm and rough in texture, due to a covering of small blisters (lenticels) (2). Small white flowers are borne on panicles that appear over spring (into summer in cooler climates) and feature 4 pointed petals, which are about 5mm long (3). The fruit is a small capsule consisting of 4 (sometimes only 2 or 3) nearly separate lobes, which are only loosely connected at the base. 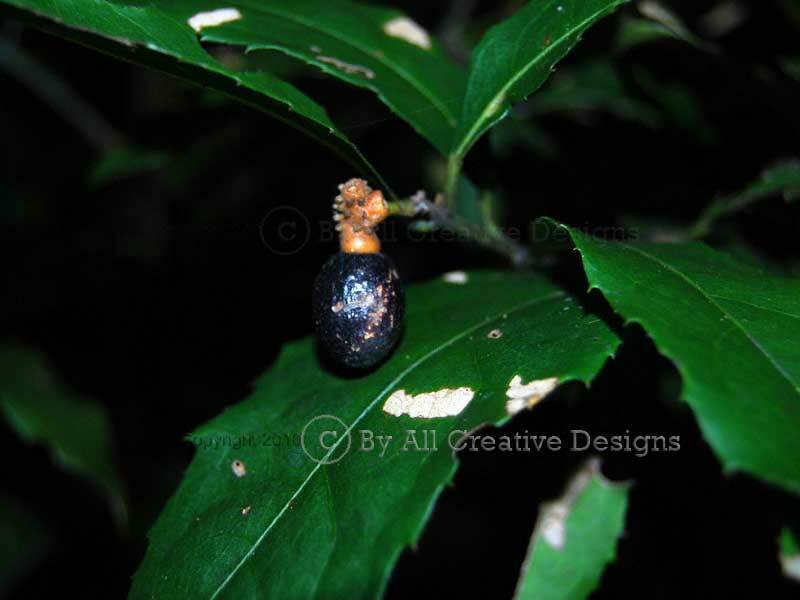 The capsule reaches up to 10mm in diameter and turns from green to brown before splitting at full maturity (4). Palmate compound leaves are made up of 3 leaflets (trifoliolate), which are: up to 10cm long, mostly elliptic in shape with entire margins, dull, dark green on top, paler, sometimes hairy beneath, soft in texture, sticky and strongly scented when crushed. Leaf apex is acute, base shape is cuneate. 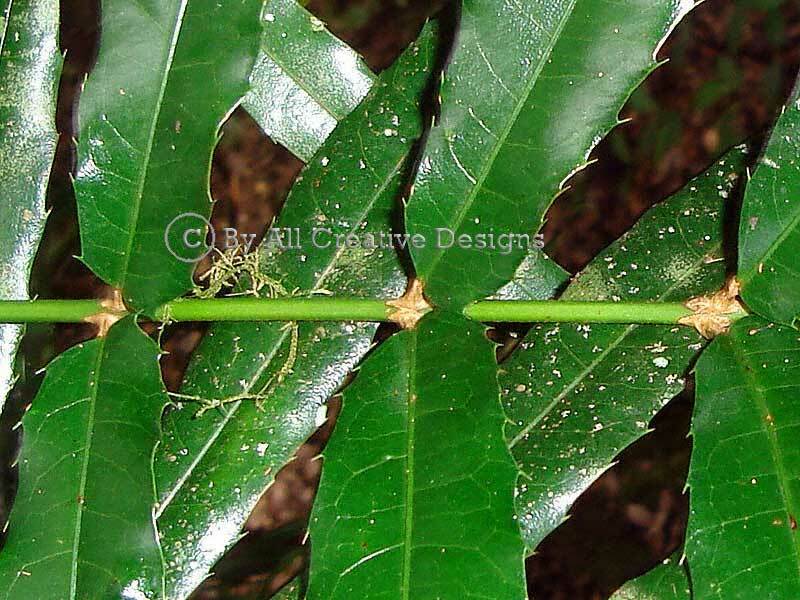 The strong petiole (primary leaf stalk) is up to 4cm long (5). Distribution: Vic., NSW and Qld. The sap contained in every part of this tree can be toxic to humans and is very likely to cause allergic reactions when touched. 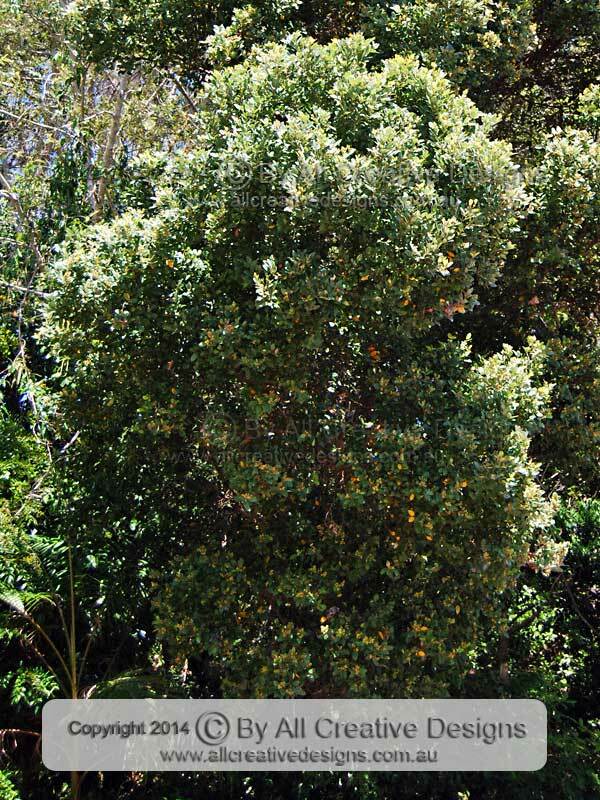 Sawdust inhaled when felling or pruning this species has caused severe respiratory problems. 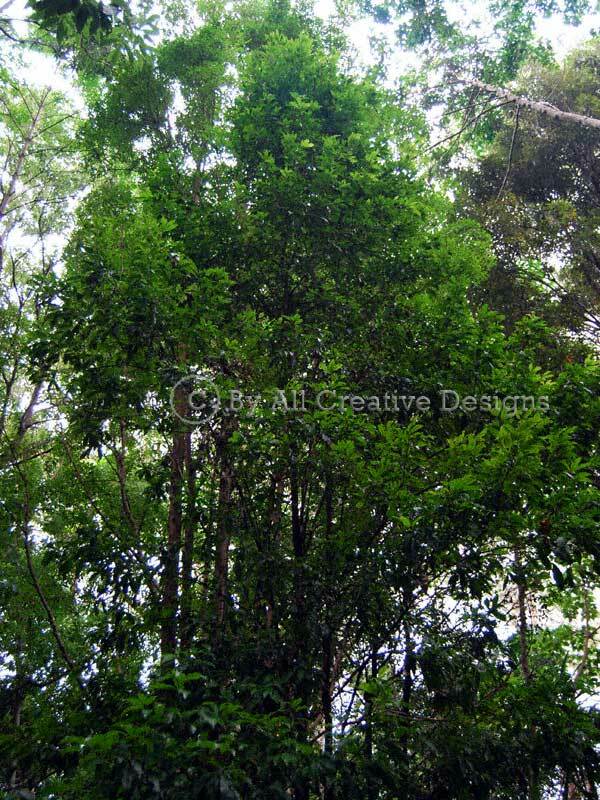 This medium to tall tree is found in lowland tropical and periodically drier monsoonal rainforests (Image 1). Bark is irregularly furrowed and brown, weathering to grey, if not stained by exuding sap which changes from brown to black on exposure (2). Small inconspicuous unisex flowers are borne side by side (monoecious) on panicles appearing at or near the end of young branches. Whitish and ovate (egg-shaped) petals are considerably larger on the female flower (shown) than the male. Main flowering period is over spring (3). The orange or more red coloured fleshy cap (receptacle) at the base of the fruit (a nut) is a unique identification feature. The fruit, including the receptacle, is up to 5cm long and up to 3cm wide. It contains a single nut (not shown) embedded in a shell of leathery consistency (4). 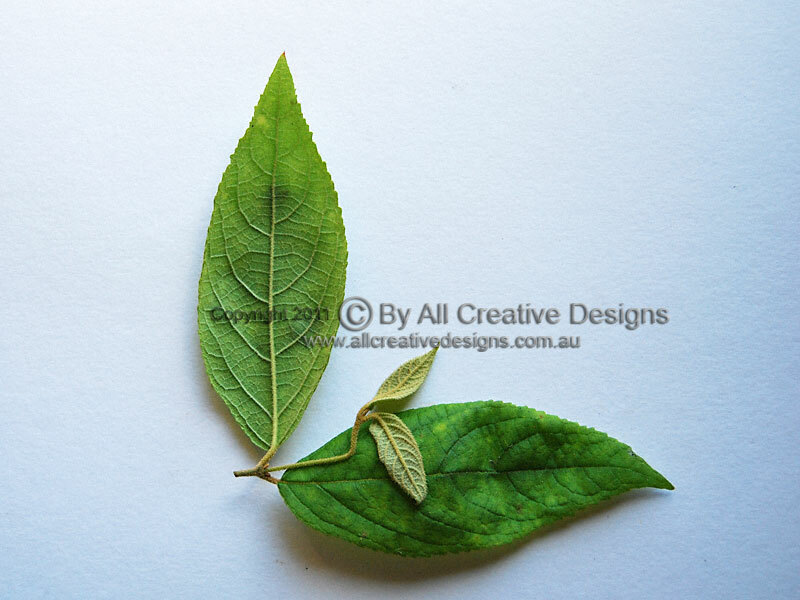 Mature simple leaves with an alternate arrangement are; varied in size from 15 to 30cm long, elliptic, ovate or obovate (reverse egg-shaped) with entire margins, hairless, dark green on top, pale greyish green beneath, firm and rather thick. Leaf apex is obtuse (rounded), base shape is cuneate. 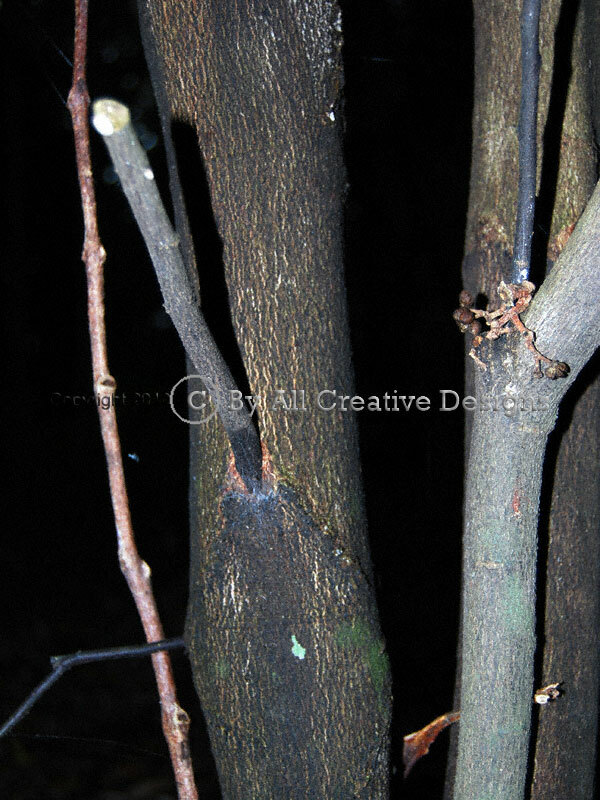 Small amounts of sap will ooze from broken petioles and young twigs. Centre vein is sunken on the upper and raised on the lower leaf surface. Distribution: North Qld and NT. Note: Some people are not adversely affected by the sap. 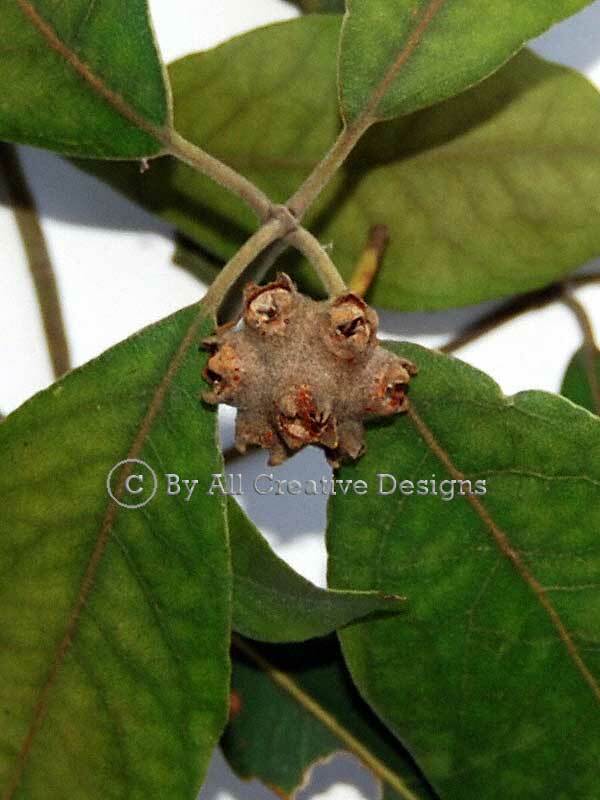 This native species is well known for the antibacterial oil derived from its leaves. 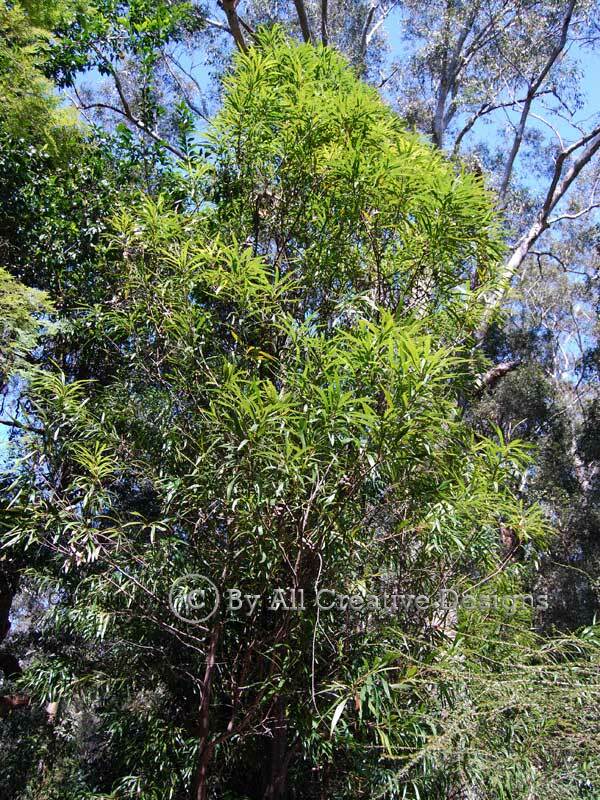 It can be a medium sized tree up to 15m tall in wet locations, such as swamps and stream banks. Under drier conditions it may only be a shrub less than 5m high. 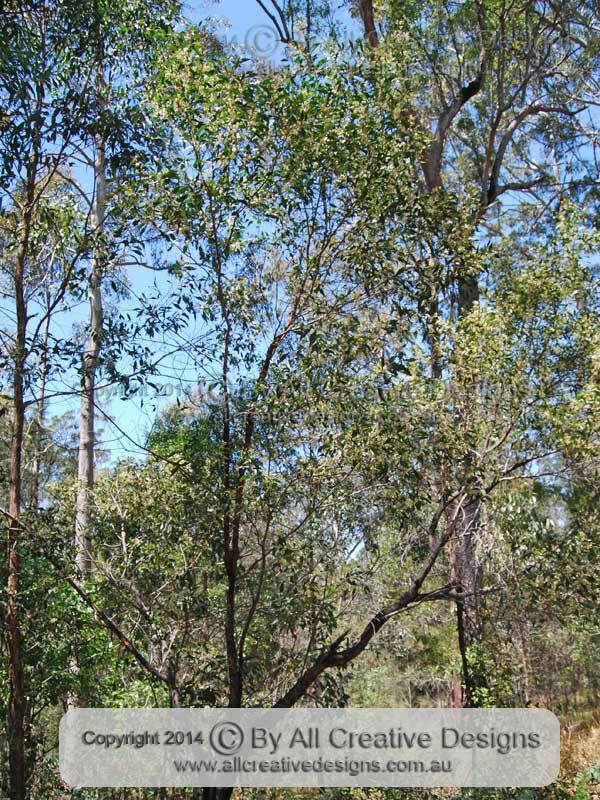 The Melaleuca alternifolia has a relative small natural distribution range in north eastern NSW, but is now widely grown on commercial plantations (1). 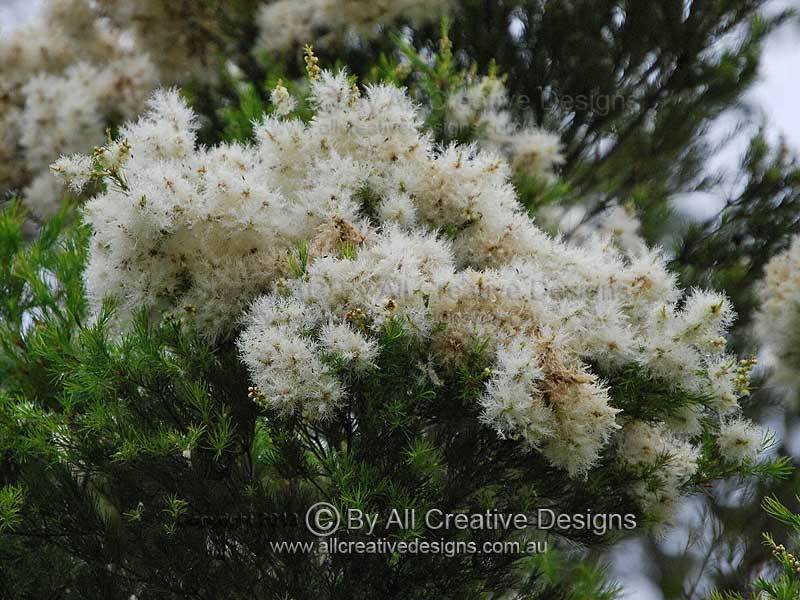 The flaky bark, characteristic for the Melaleuca genus, sheds in papery sheets and is white to light grey in colour (2). Short spikes appearing towards the end of young branches bear 20 to 30 individual white flowers, which bloom from late winter into spring (3). 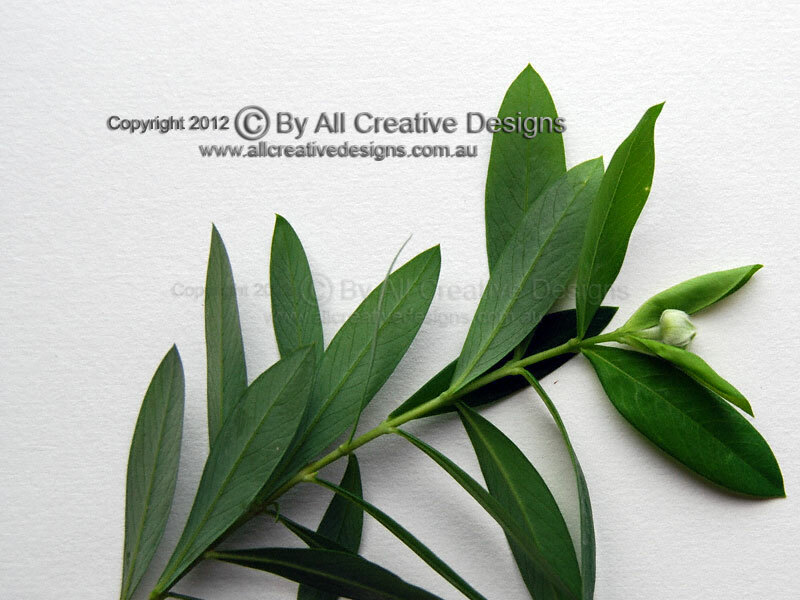 Simple leaves are arranged in irregular whorls and are; up to 3cm long, narrow linear in shape with entire margins, dark green, hairless when mature, scented when crushed, thin and soft in texture. Leaf apex is acute, base gradually tapers into the short yellowish brown coloured petiole (leaf stalk). Numerous whitish, translucent oil glands become visible when the leaf is held against a light source (4 & 5). Distribution: Coastal and mountainous areas in far northern and a separate natural occurrence on the mid-north coast of NSW. 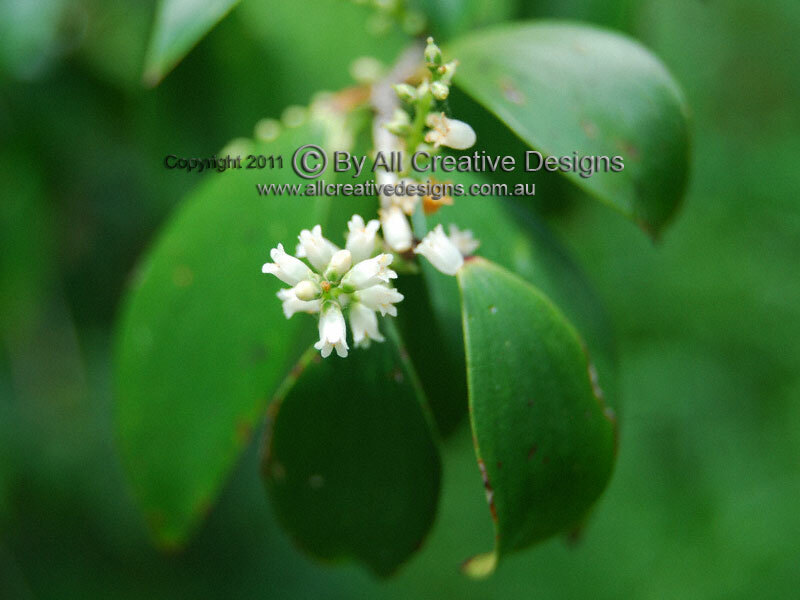 The Thick-leaved or Northern Rivers Laurel is a small understorey tree species preferring a moist environment (often along creek banks) within subtropical rainforests. 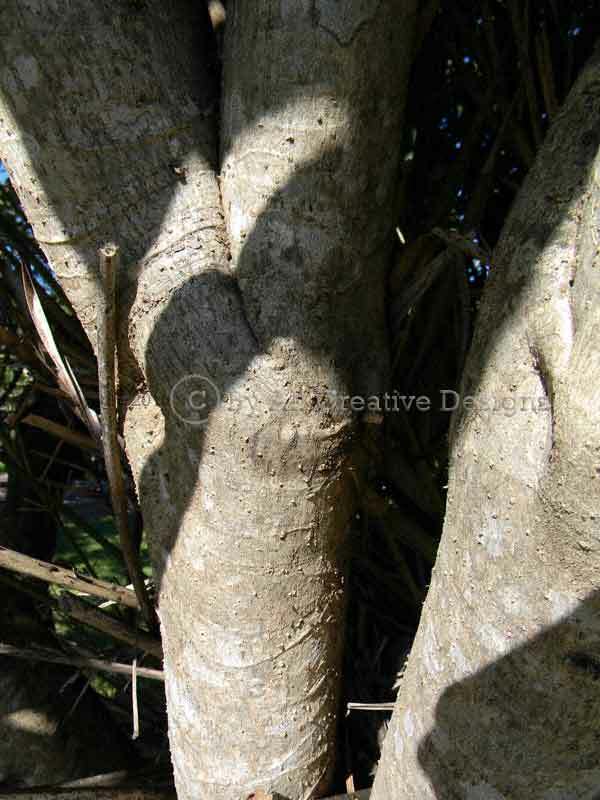 It is densely foliated and can reach a height of about 10m, often with a crooked or leaning trunk (Image 1). 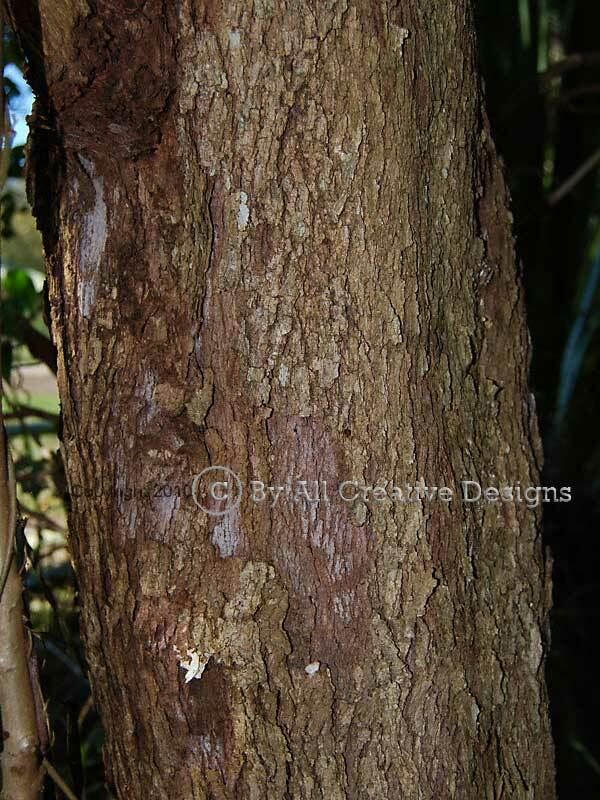 Bark is mid-brown in colour, with paler brown blisters covering the surface, and firm in texture (2). Flowers are borne on small panicles that emerge from axillary buds towards the end of young branches. They are cream coloured and only measure a couple of millimetres in length (3). The fruit (a drupe) is ovoid in shape and features distinctive longitudinal ridges. It turns dark purple to black and is up to 2cm long when fully ripe, fruit shown is still immature (4). 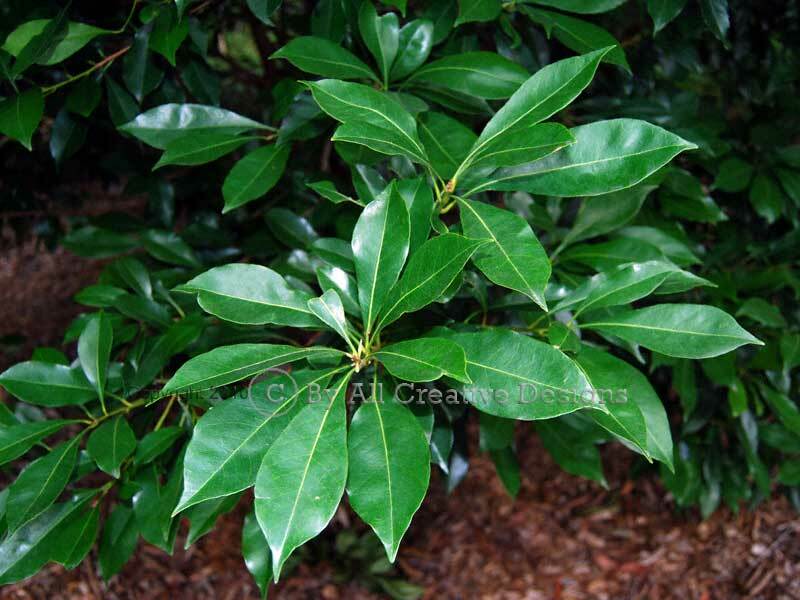 Simple leaves with an alternate arrangement are: up to 8cm long, mostly elliptic or sometimes lanceolate (lance-shaped) with undulating (wavy) margins, hairless, dark green and glossy on top, pale green and glossy beneath, fairly thick and smooth in texture. Leaf apex shape is acuminate ending in a blunt point; base shape is cuneate to attenuate. Venation is faint with the mid rib being slightly sunken on the upper and raised on the lower leaf surface (5). Distribution: NSW mid-north coast to southern Qld. 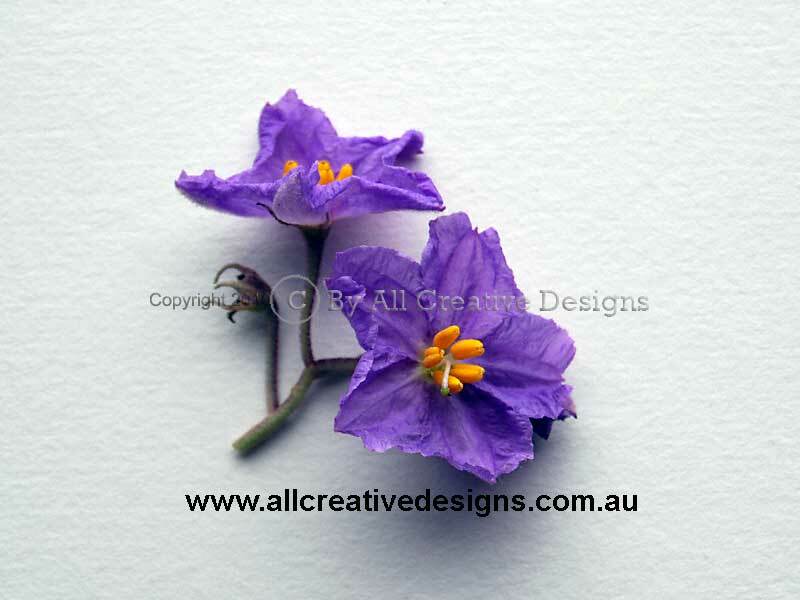 See Flower Characteristics Page and Leaf Characteristics Page for information on terms used. 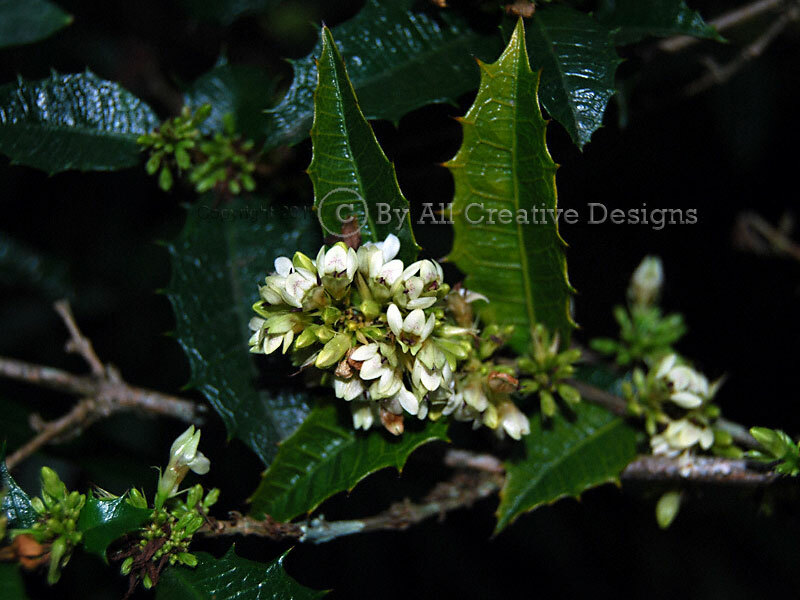 To find related species go to the botanical species list and locate the genus of Cryptocarya. 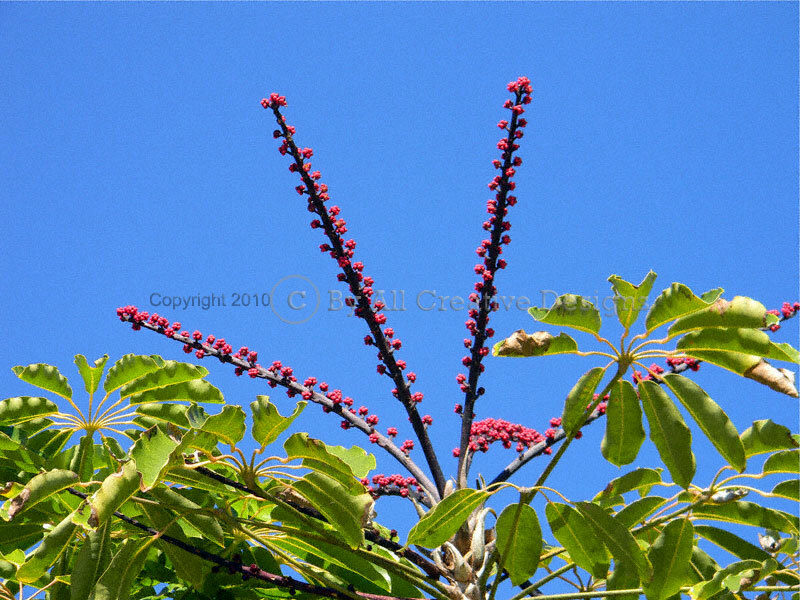 This native species occurs within subtropical and littoral (in proximity to the coast) rainforests and grows to 15m high (Image 1). 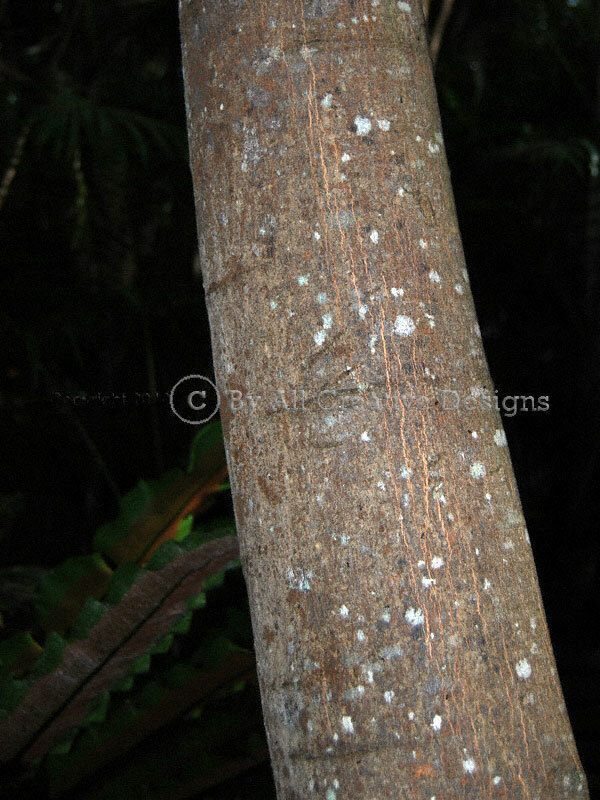 Bark is a brown in colour with a quite rough and fissured texture. This a good identification feature when distinguishing between this species and the very similar Black Apple Pouteria australis Page 1, when immature (2). 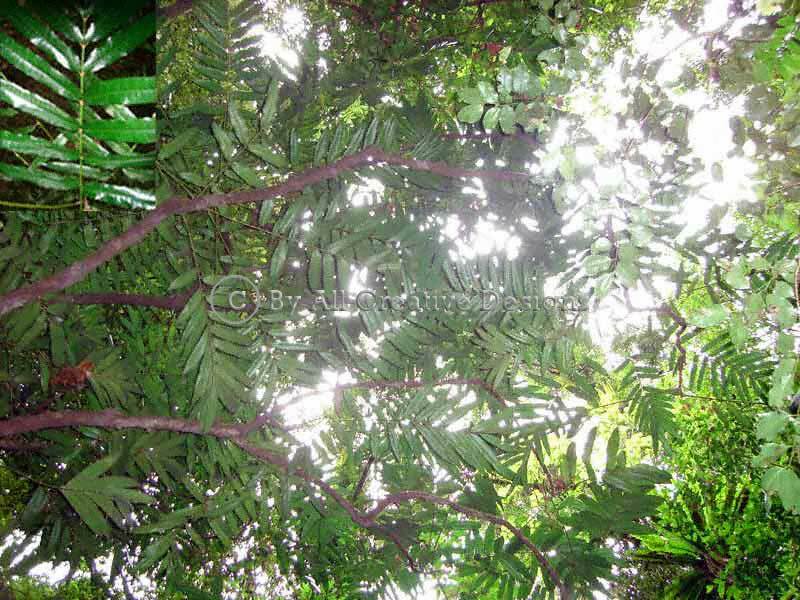 Under good light conditions, the tree develops very dense and glossy foliage (3 & 4). 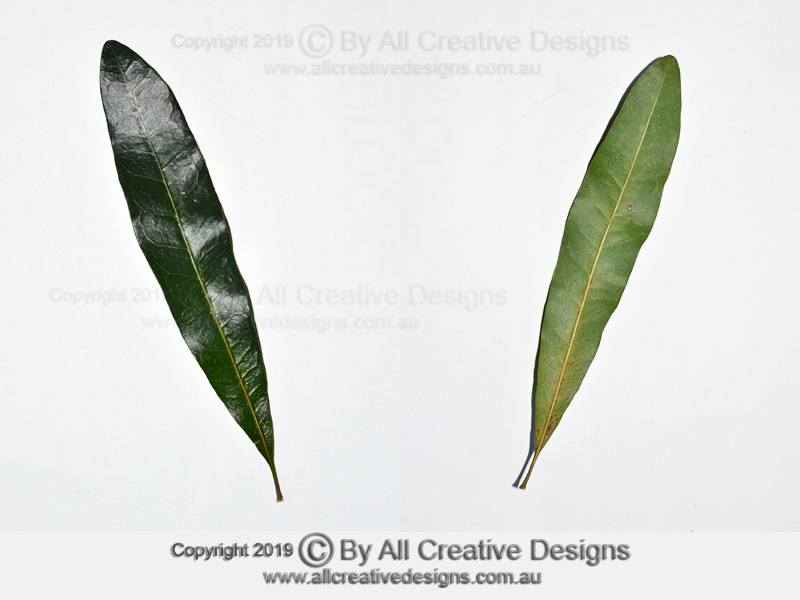 Simple leaves with an alternate arrangement are; up to 20cm long, broadly oblanceolate (reverse lance-shaped) with entire margins, hairless, fairly thin but firm and very smooth, polished in texture. Leaf apex is short acuminate or acute ending in a blunt tip; base shape gradually narrows into the petiole, which is up to 8mm long (5). Distribution: Northern NSW to central Qld. 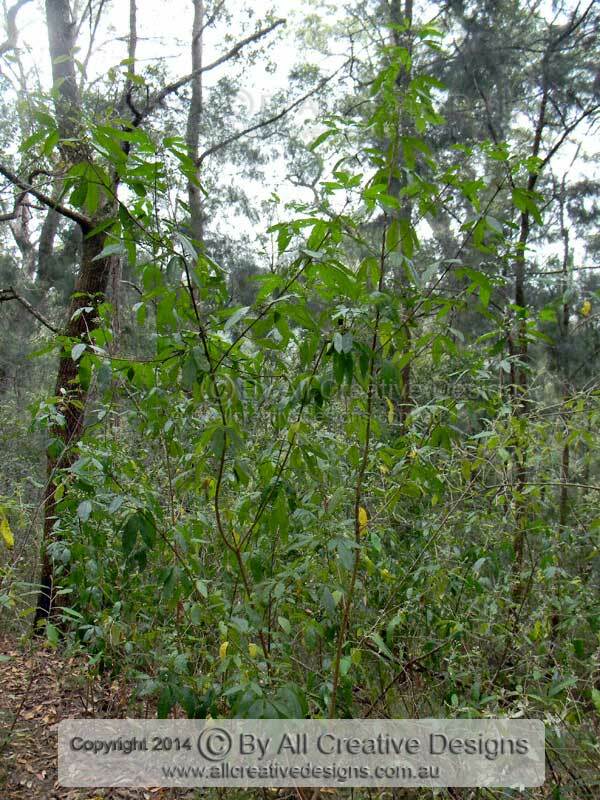 Under favourable conditions this handsome species can develop into small tree up to 6m tall, but is more likely to be a sturdy single-stemmed shrub less than 4m high. 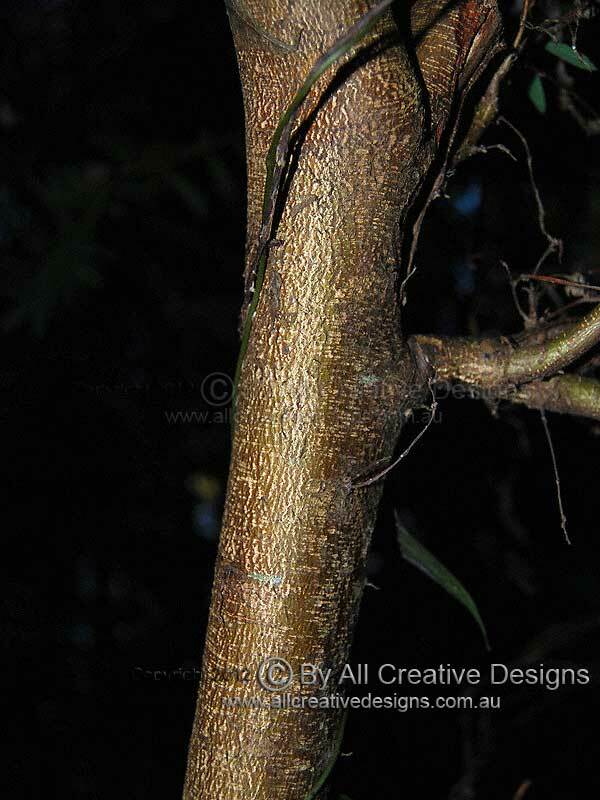 It occurs as an understorey species in tropical and subtropical rainforest (1). 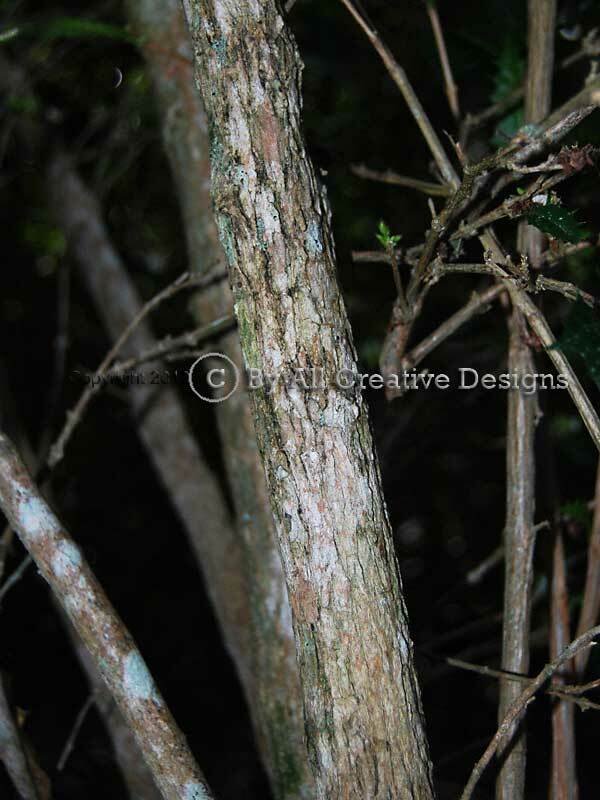 Bark is grey brown in colour; green hues are caused by developing lichen and mosses. It is firm and finely rough in texture, due to fine ridges and fissures (2). Scented flowers, typical for the genus, feature 5 white petals, which form a tube at the base and separate into overlapping lobes at the apex. The calyx is funnel-shaped, up to 8mm long and densely covered in fine whitish hair. Flowering period is over late winter and spring (3). 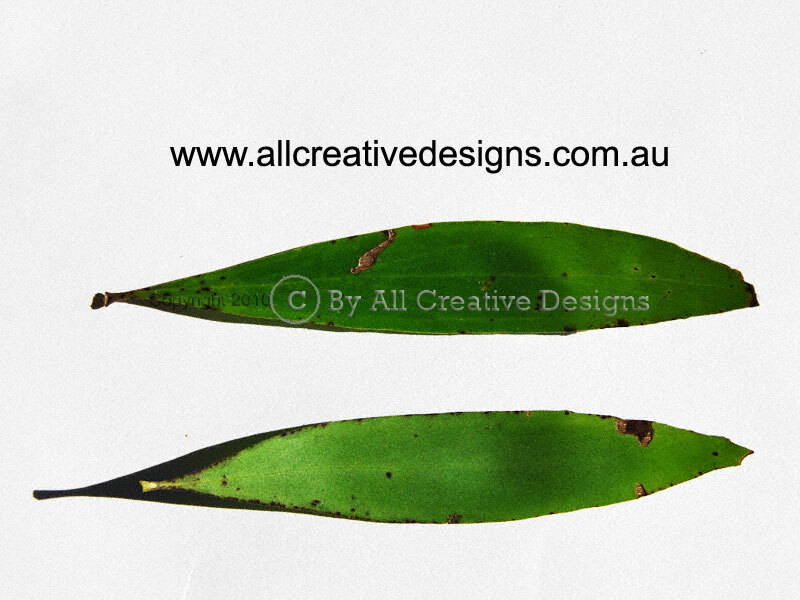 Petioles (leaf stalks) are less than 5mm long. Stipules enclosing the growth bud and young branches (towards the growing end) are all hairy (4). 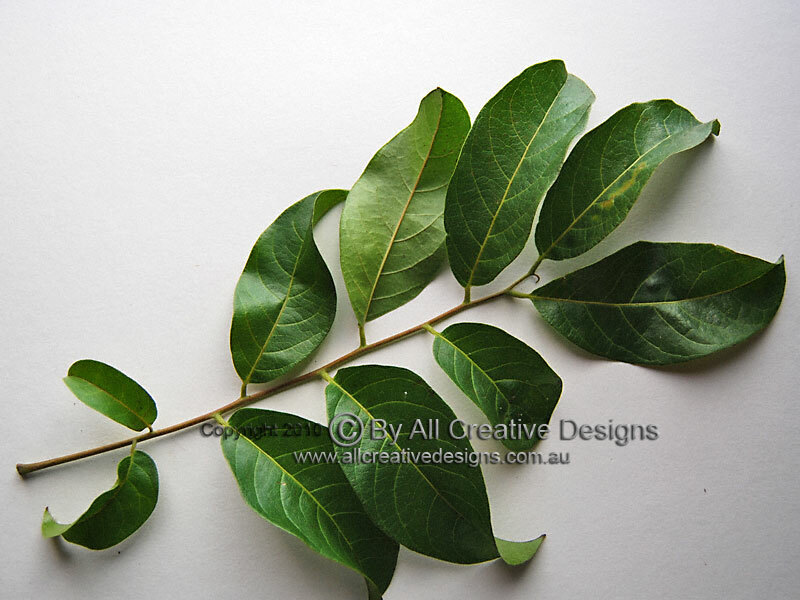 Simple leaves with opposite arrangement (sometimes emerging in a whorl of 3) are; up to 16cm long, varied in shape from narrow linear on saplings to lanceolate (lance-shaped) with entire margins on mature trees, hairless, dark green, glossy on top, paler and hairy beneath, thin and soft in texture. The broadly raised lateral veins on the upper surface are a distinguishing feature (5). Distribution: From northern NSW to north Qld. Use page links below to access; Leaf Characteristics, Flower Characteristics and Bark Identification pages for explanations of botanical definitions and concepts. 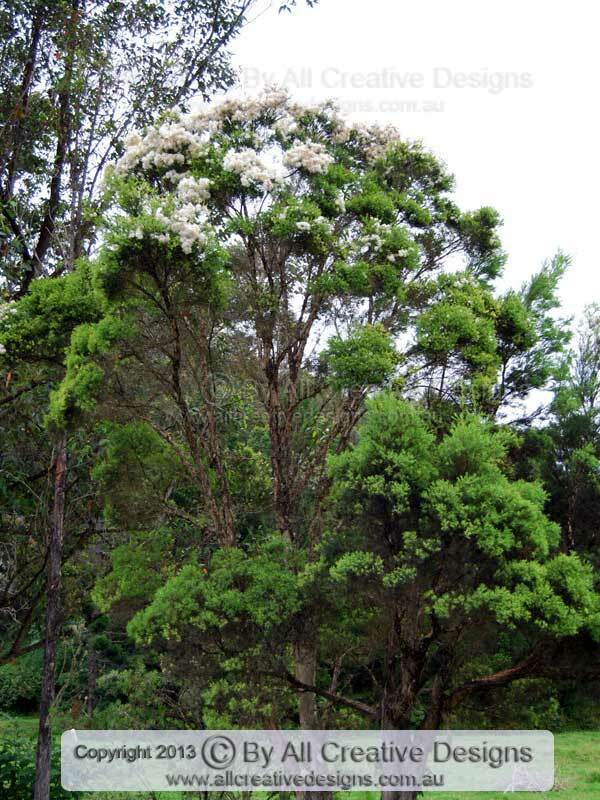 The Three-veined Hakea Hakea archaeoides or Big Nellie Hakea is a large and uncommon native shrub, which under favourable conditions can reach a height of up to 7m within wet tall Eucalypt (sclerophyll) forests (Image 1). 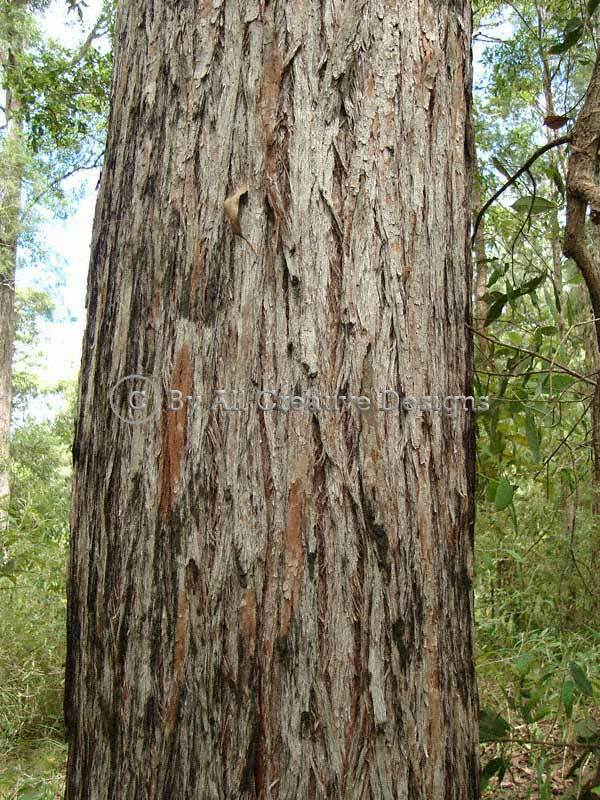 Bark is dark grey in colour with a rough and fissured texture on older trunks; smoother on younger specimens (2). 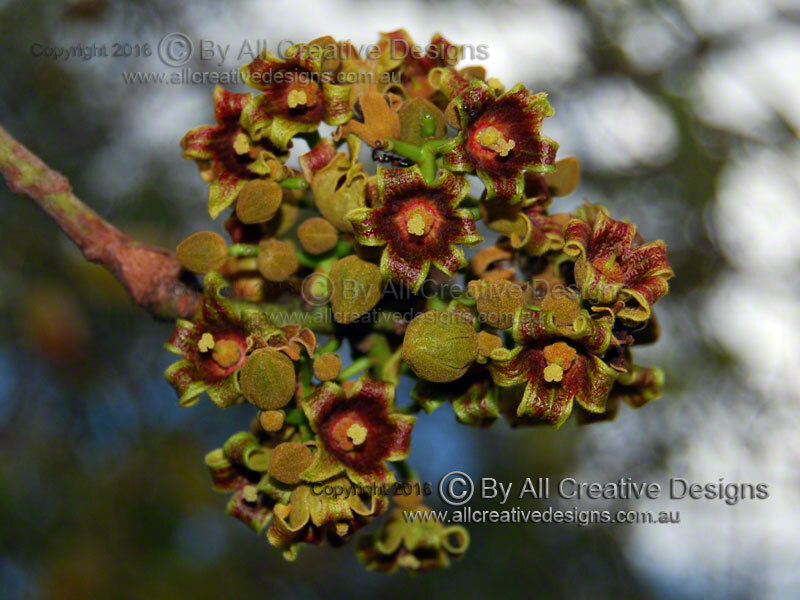 Up to 100 individual flowers are borne on a raceme, which is up to 8cm long. The prominent flower styles are a vivid dark pink or red and crowned by yellow to green coloured stigmas (3). 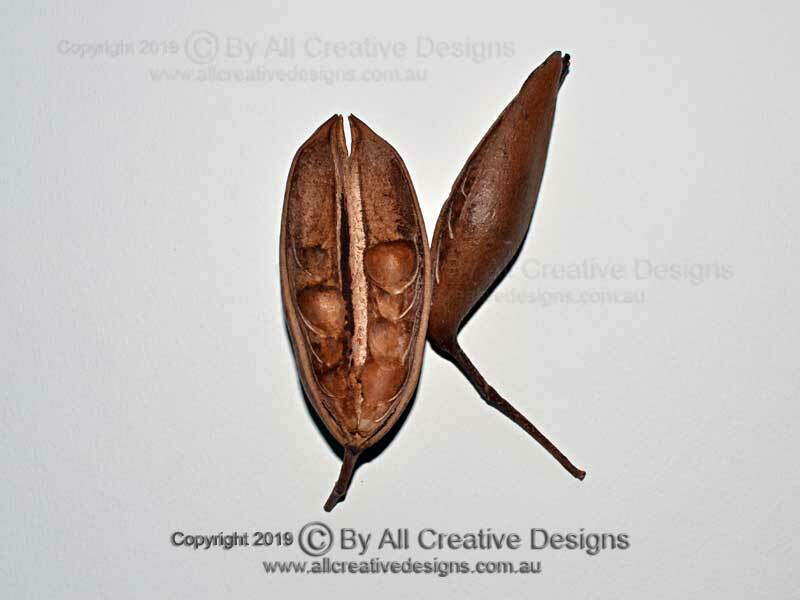 The extremely hard and woody fruit splits in half when mature to release only two black and papery winged seeds. The fruit, typical for the genus, is classified as a follicle and measures up to 18mm in length (4). 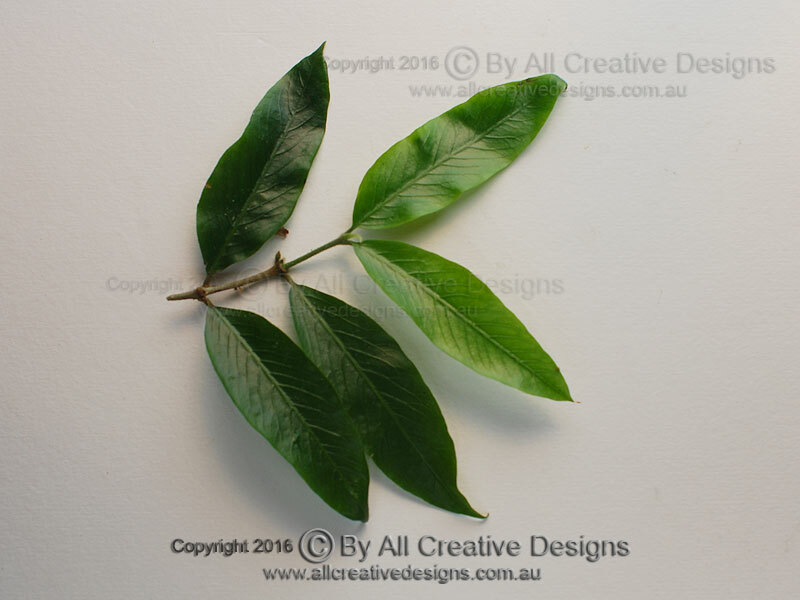 Simple leaves with an alternate arrangement are; more than 25cm long and only 25mm wide, mostly narrow elliptic in shape with entire margins, hairless, mid-green, semi glossy on top, paler green below, strong and rather stiff in texture. Leaf apex is acute; base shape is long attenuate. 3 to 7 elliptical veins (often 3 are more pronounced) are visible (5). Distribution: Coastal ranges in the lower part of the NSW mid-north coast (Threatened Species). 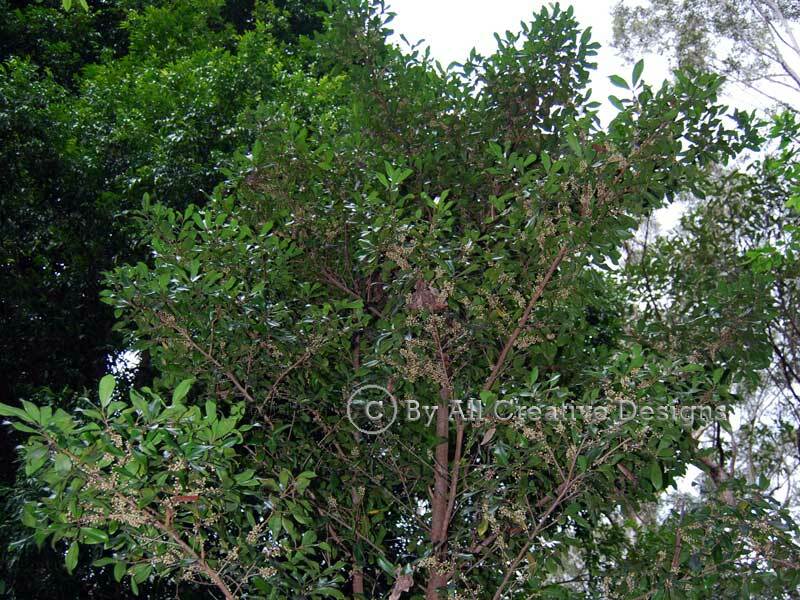 This native species can attain a height of 25m and in some aspects is rather similar in appearance to the introduced Camphor Laurel (Cinnamomum camphora). See Introduced, Noxious Species. 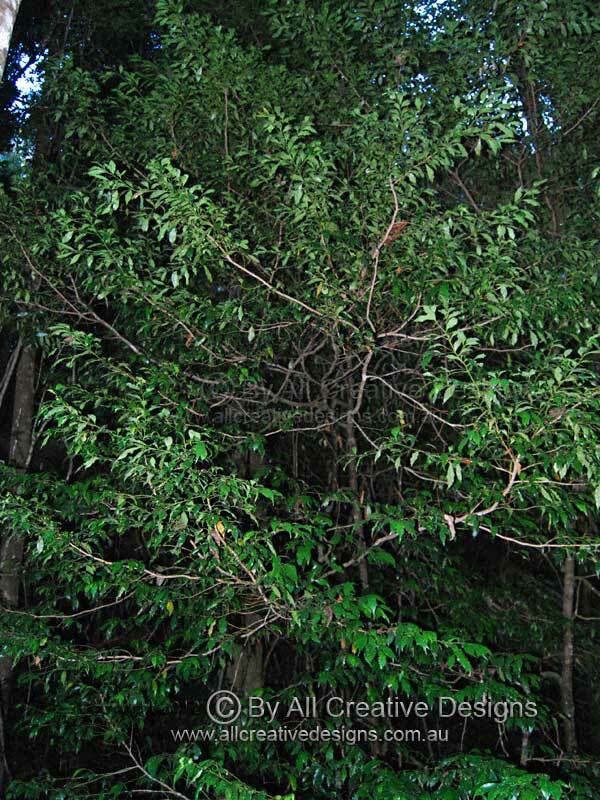 The natural habitats for the Three-veined Laurel include coastal and subtropical rainforests at lower altitudes (Image 1). 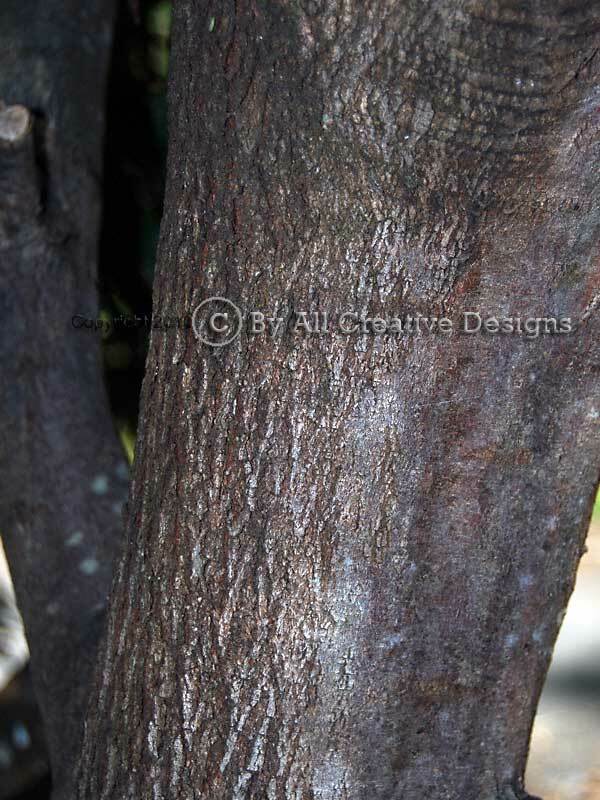 Bark on the lower trunk of older trees is firm in texture and grey-brown in colour. 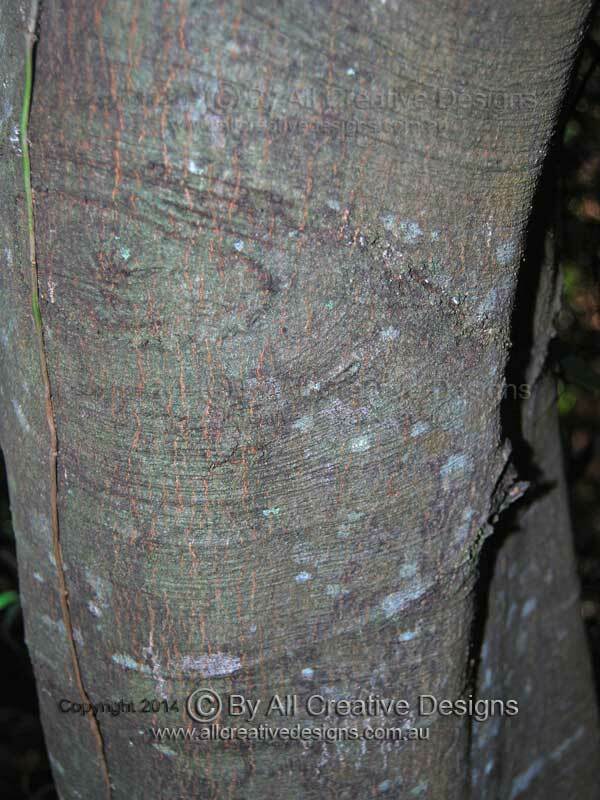 It shows fine horizontal ridges and small vertical fissures, whereas bark on mature Camphor Laurel trees becomes deeply fissured, rough and flaky. 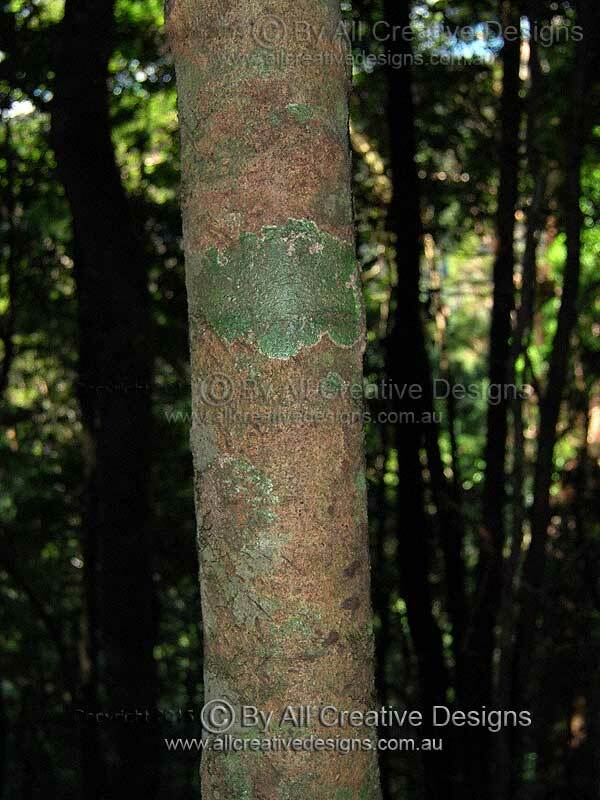 Bark on juvenile trees is green in colour, turning to brown and covered in small blisters (2 & 3). Small flowers are greenish yellow and held on panicles emerging towards the end of young branches. Flowering takes place from spring into early summer (4). 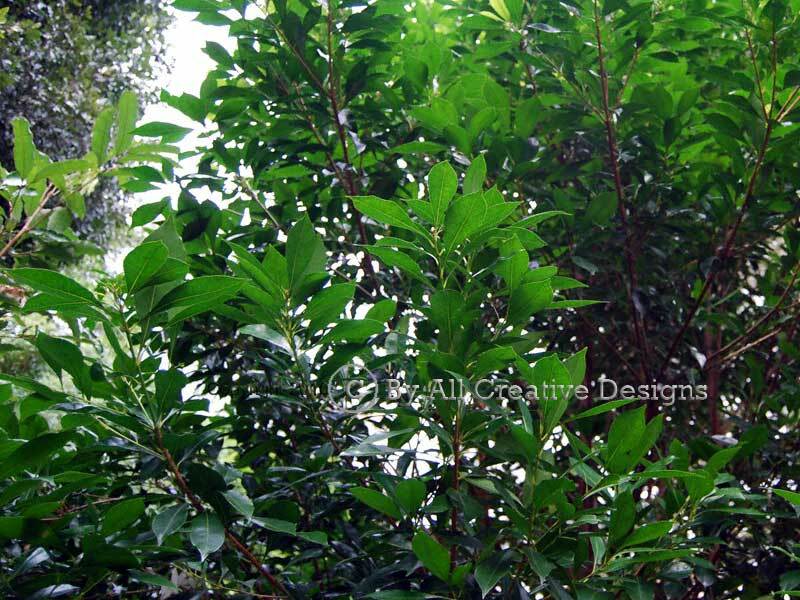 Mature simple leaves with an alternate arrangement are; up to 10cm long, varied in shape from ovate over broadly elliptic to obovate (reverse egg-shaped) with entire margins, dark green, semi-glossy on top, paler green, finely hairy beneath, (Camphor Laurel leaves are hairless), thick and rather leathery in texture. Leaf apex shape narrows into a broad tip; base shape is broadly cuneate to more rounded. Two prominent lateral veins (starting at the base) run up to near the apex of the leaf. Mid rib and other veins are finely hairy (5). Distribution: From the NSW mid-north coast to northern Qld. 2 variations; var. triplinervis (shown) and var. pubens, which leaves are more densely hairy on lower surface. This long-lived shrub or small tree reaches less than 10m in height and is often part of the first woody vegetation on sand dunes along the shoreline. 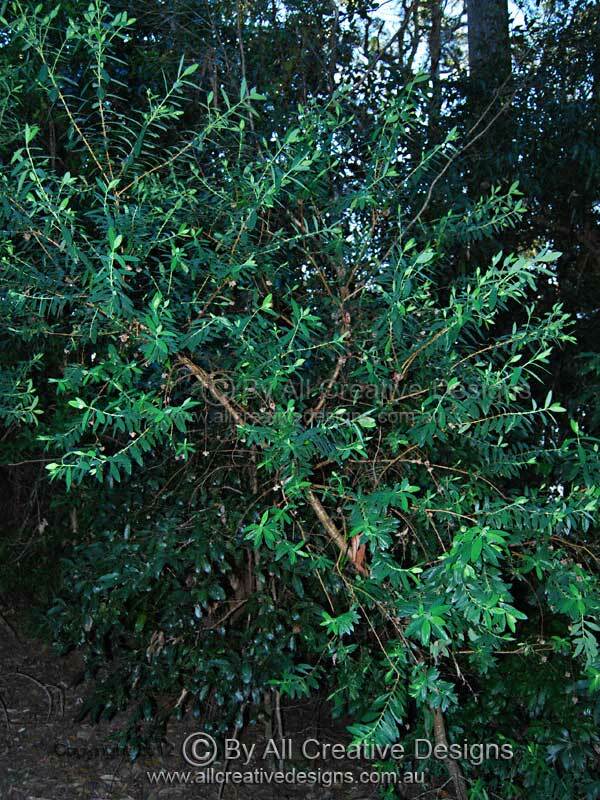 In this habitat, it is a multi-trunked shrub able to withstand strong salt laden winds, whereas in more protected locations, such as coastal open forests it can grow into a small tree (Image 1). 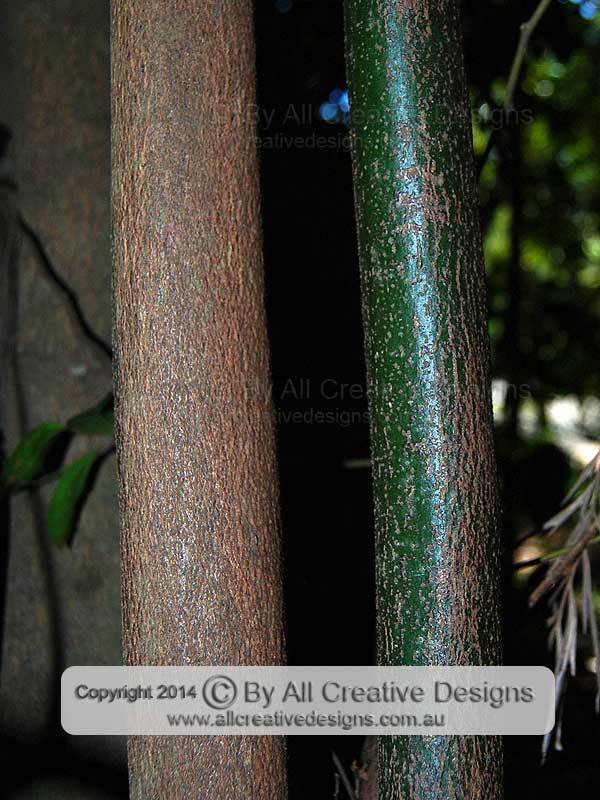 Bark is tough and stringy in texture; brown in colour weathering to a light grey (2). 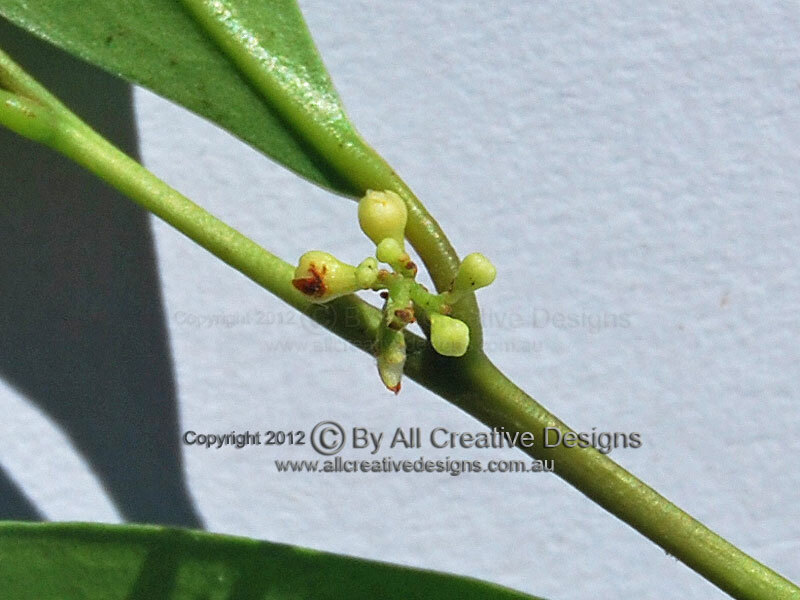 Small flowers measure only 2 to 3mm in diameter and are held along short spikes towards the end of young branches (3). New growth is often bright yellowish green and young branches are covered in very fine whitish hair (4). 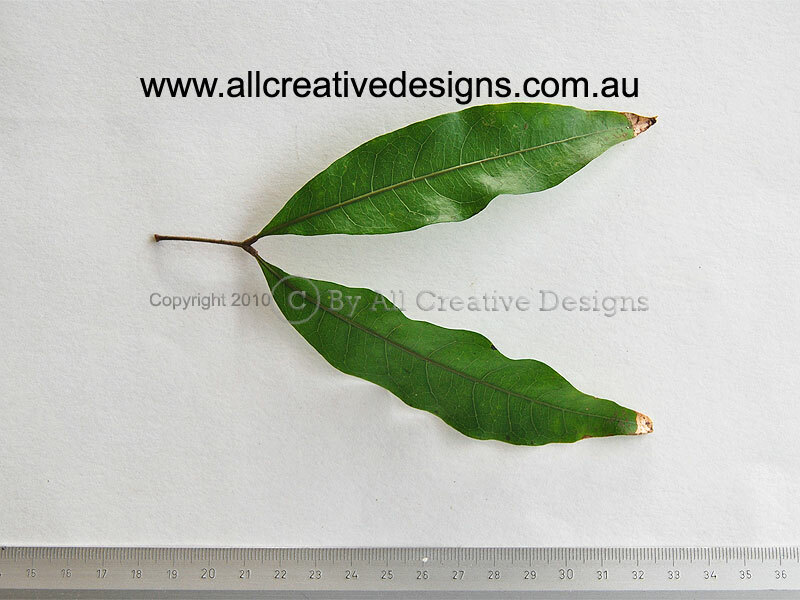 Simple mature leaves with an alternate arrangement are; up to 25mm long, elliptic to oblanceolate (reverse lance-shaped) with entire margins, dark green above, lighter grey/green beneath, hairless, strong and smooth in texture. Leaf apex is rounded with a small sharp tip; base shape is cuneate. Venation is more visible on lower leaf surface (5). Distribution: Tas., Vic., NSW and Qld. 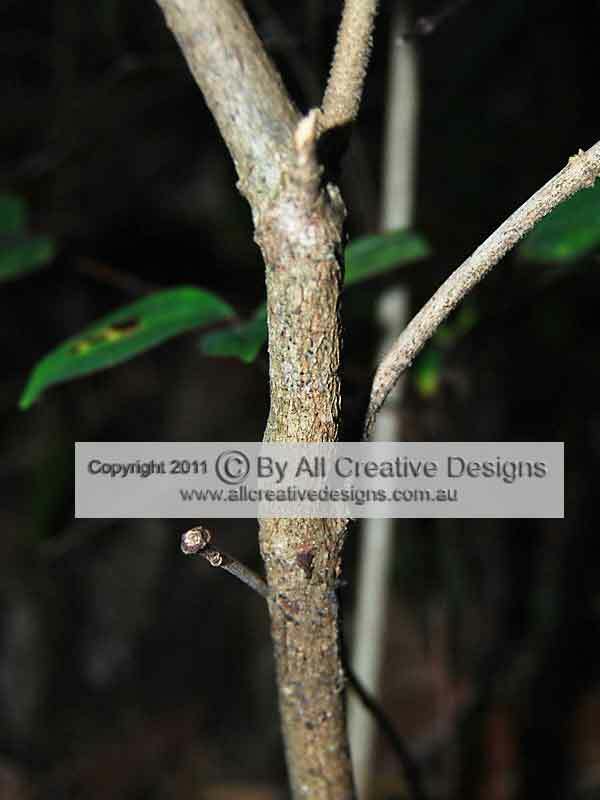 Most of the time, this species will occur as a shrub in different rainforest types and in adjacent tall forests, but under favourable conditions it can grow into a small tree up to 10m high with a spreading canopy (Image 1). Bark on older trees is deeply fissured with a soft corky texture (2). 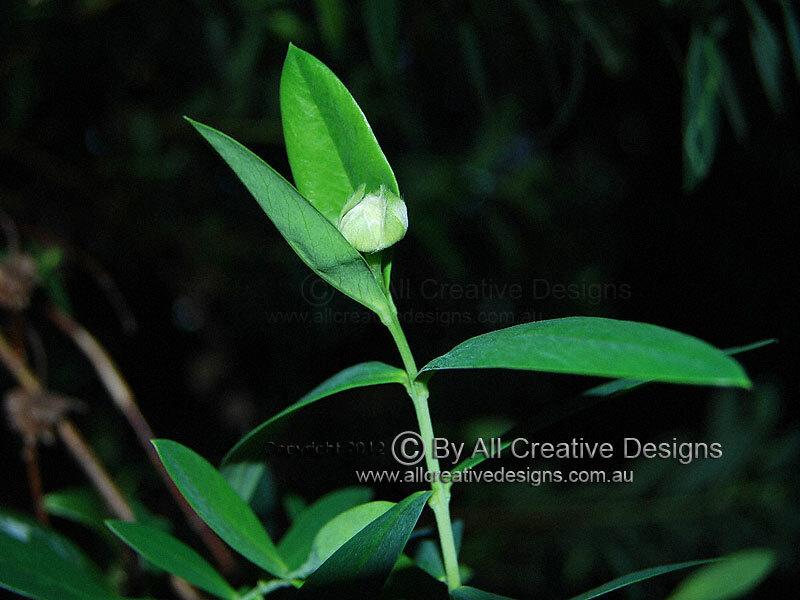 Cute small white flowers blossom mostly over summer and are arranged along spikes up to 8cm long (3).The fruit (a drupe) changes from green over red to dark purple or black when fully mature. 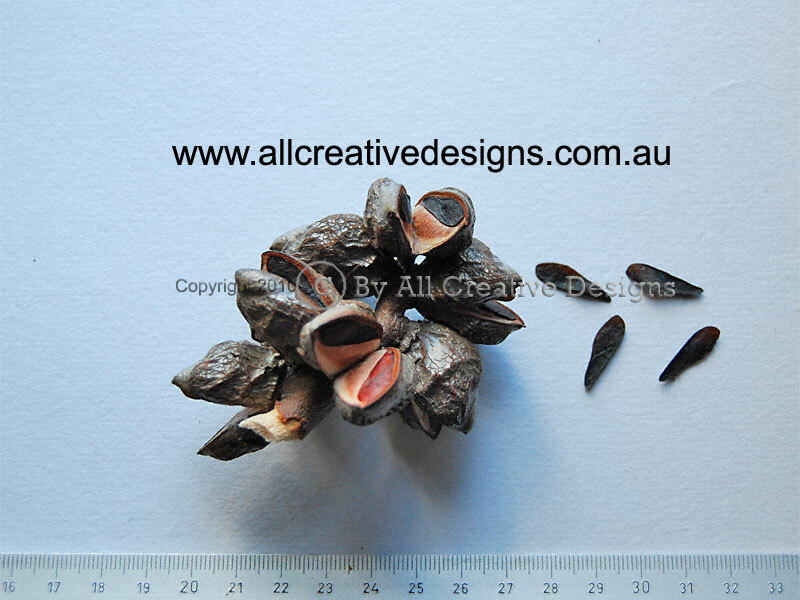 It measures up to 8mm in diameter and contains a single hard-shelled seed (4). 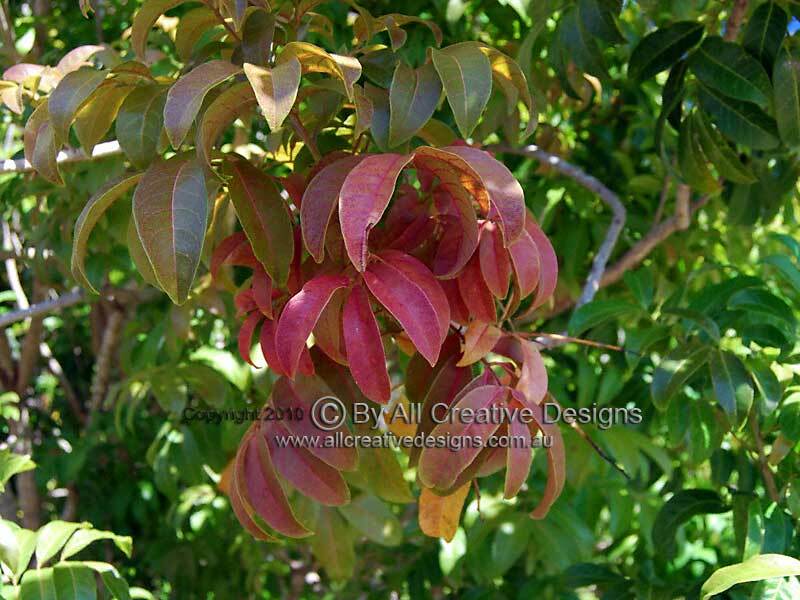 New growth can vary from pink to deep red and is arranged in a whorl of three or four leaves around the growing bud, turning alternate thereafter (inset 5). 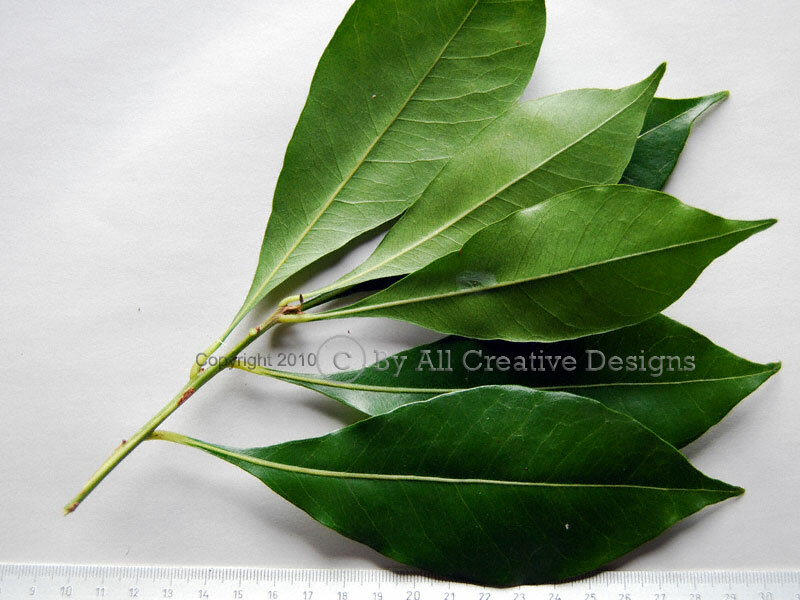 Simple leaves are; between 4 to 8cm long, elliptic in shape with entire margins, hairless, smooth, firm and rather stiff in texture. Apex is acute and base shape is cuneate. Mostly five longitudinal veins are faintly visible (5). Distribution: NSW south coast to Qld. When growing on nutrient rich soils and competing for available sunlight the Tree Waratah has the potential to reach 20m in height. 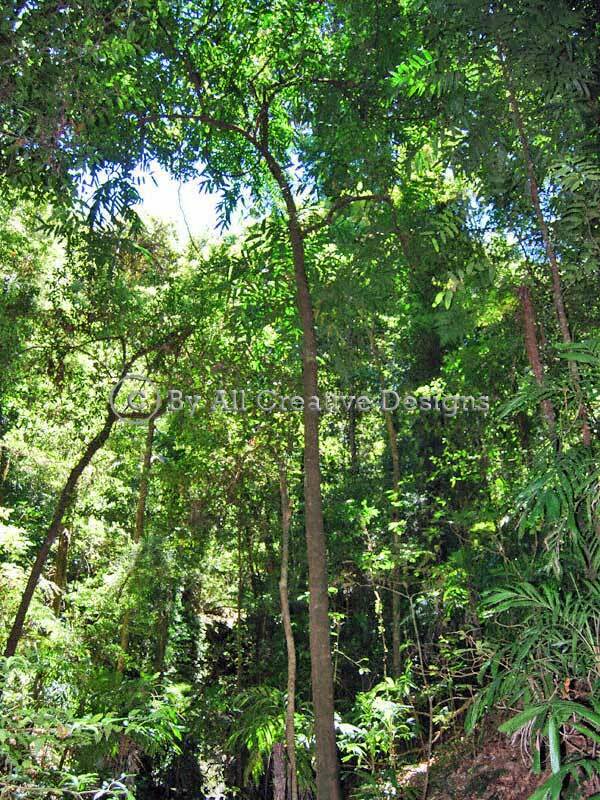 It prefers to grow under a canopy of taller trees within cooler types of rainforests at higher altitudes (Image 1). 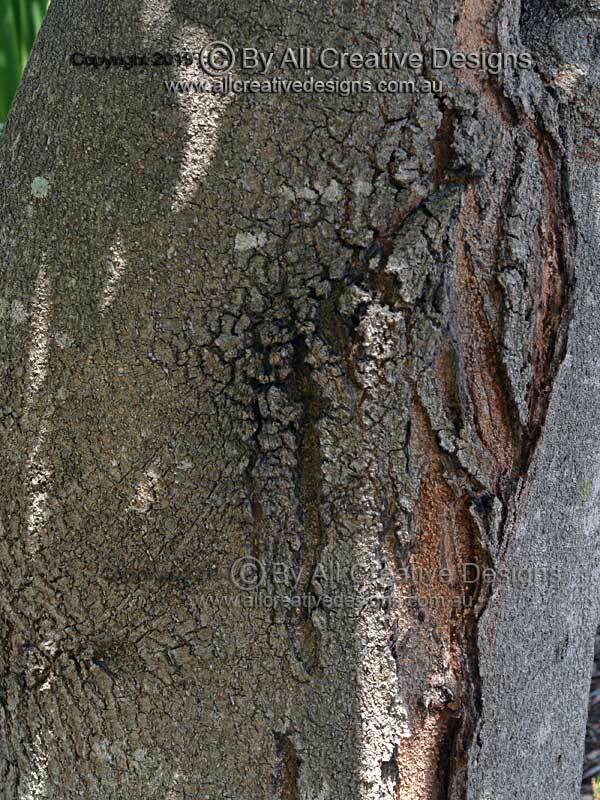 The bark on older trees is hard, finely rough in texture and greyish brown in colour (2). Stunning flowers are a vivid pink to deep red colour and form arrangements referred to as corymbs. Flowering period lasts from spring to late summer (3). On saplings the attractive foliage consists of pinnate compound leaves with mostly 7 leaflets, these can also be present on coppice shoots emerging from the base of older trees (Image 4 & 5). 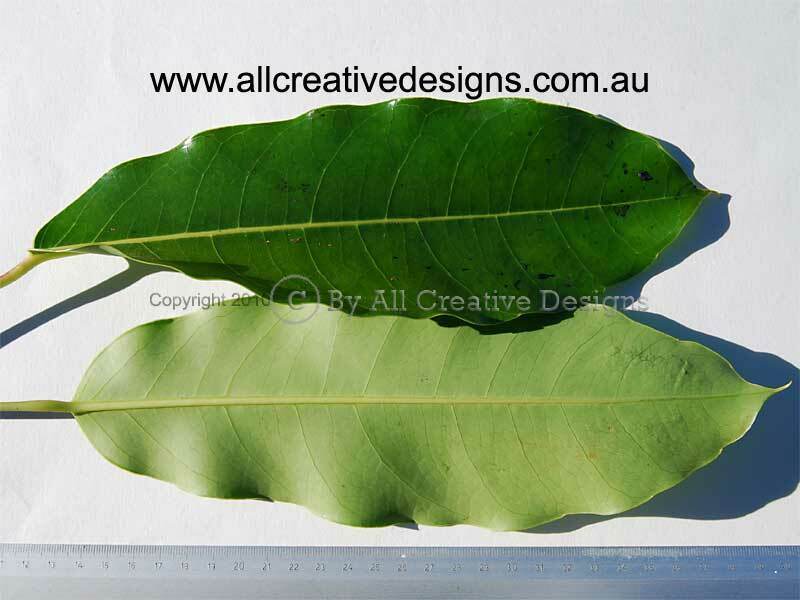 Mature trees have simple leaves (shown in image 3), which are; up to 15cm long, lanceolate (lance-shaped) with entire or deeply lobed margins, dark green, glossy and rather stiff in texture. Venation shows widely spaced and raised laterals on the upper leaf surface. Distribution: NSW mid-north coast to southern Qld. 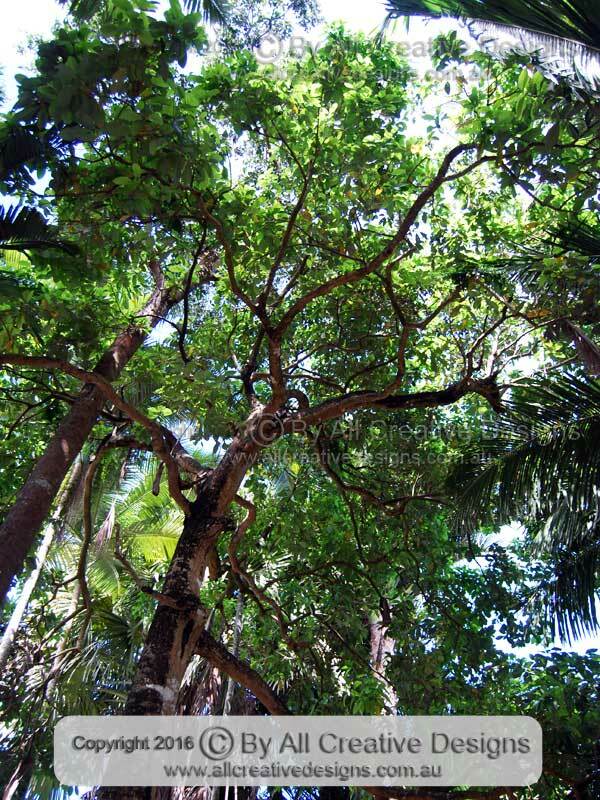 When growing on nutrient rich soils and competing for light in a rainforest environment, this striking tree can reach a height of more than 25m. 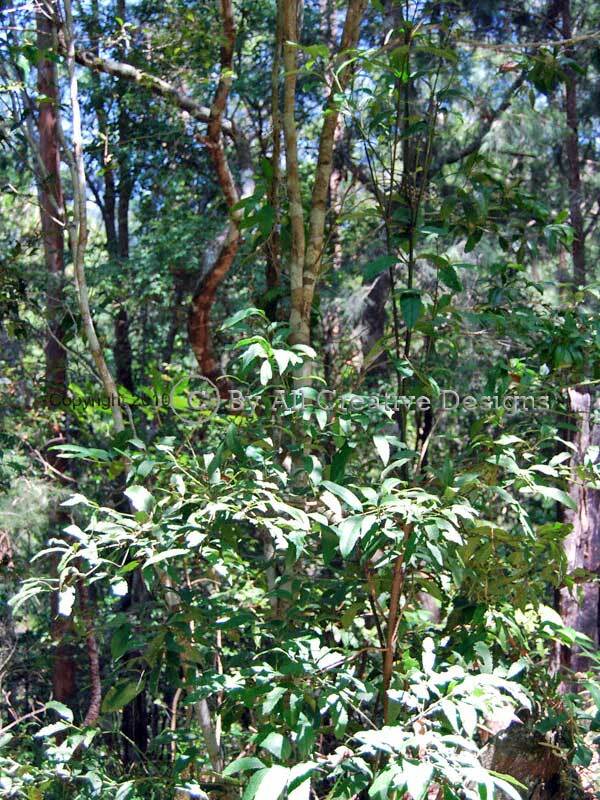 The destruction of upland tropical rainforests has made this tree an uncommon occurrence in its natural habitat and consequently it has been listed as a vulnerable species. 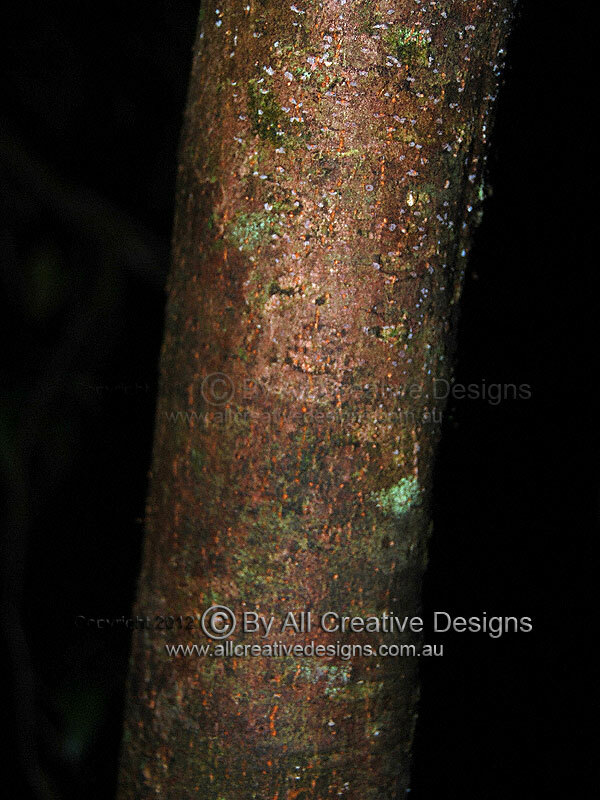 The common names Red or Satin Silky Oak refer to the oak-like grain of the timber (1). Bark at the base of the trunk of older trees becomes rough, scaly and fissured. 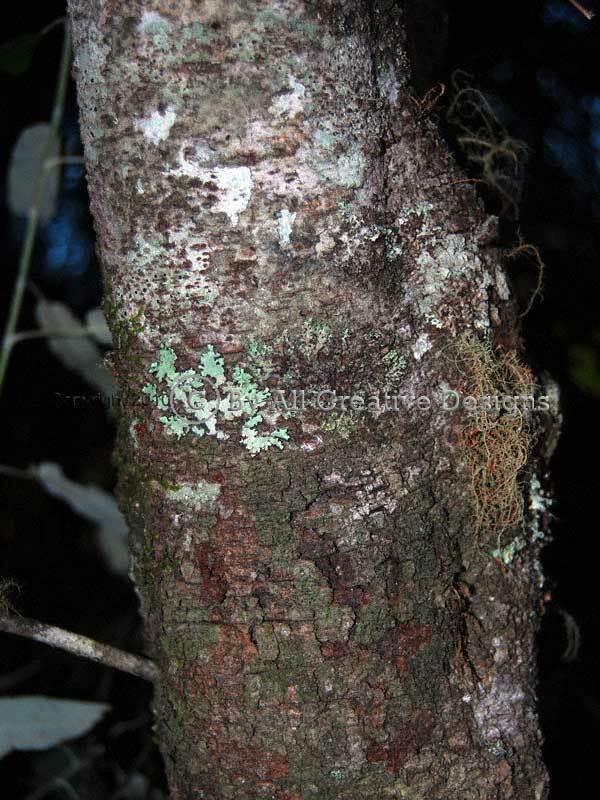 Fresh, underlying bark is reddish brown and weathers to grey (2). The very showy flowers are arranged in corymbs, where individual flower stalks branch off at different levels, but the apices of flowers are held at roughly even height. The floral tube (perianth) is bright red, up to 5cm long and separates from the prominent style when flowers mature. Stigmas are yellowish orange (3). The fruit, a follicle, is up to 10cm long and becomes woody at full maturity. It splits along one side to release winged seeds (4). 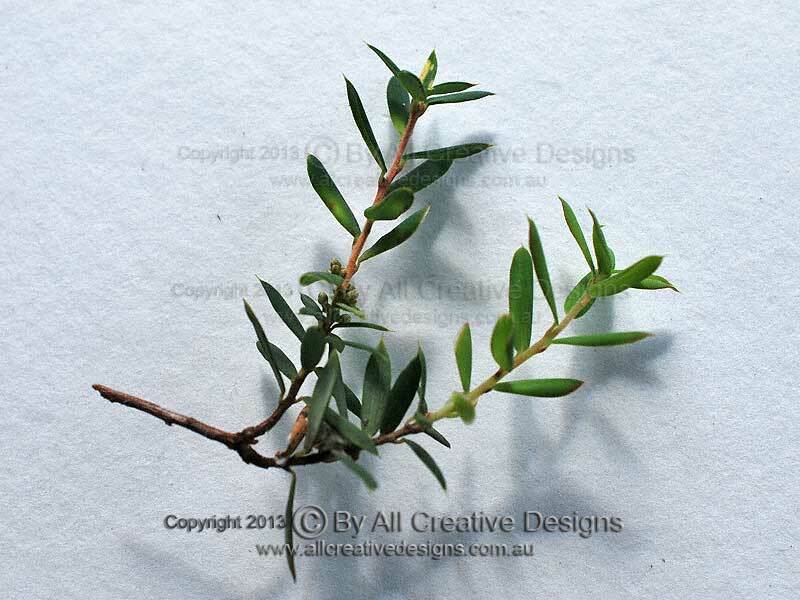 Leaves of mature specimens are simple and cluster towards the end of young branches. They are; up to 25cm long, oblanceolate (reverse lance-shaped) or narrow elliptic with entire margins, hairless, dark green on top, paler beneath, firm and strong in texture. Leaves of young specimens are often lobed (5). Distribution: Atherton tablelands, Qld. 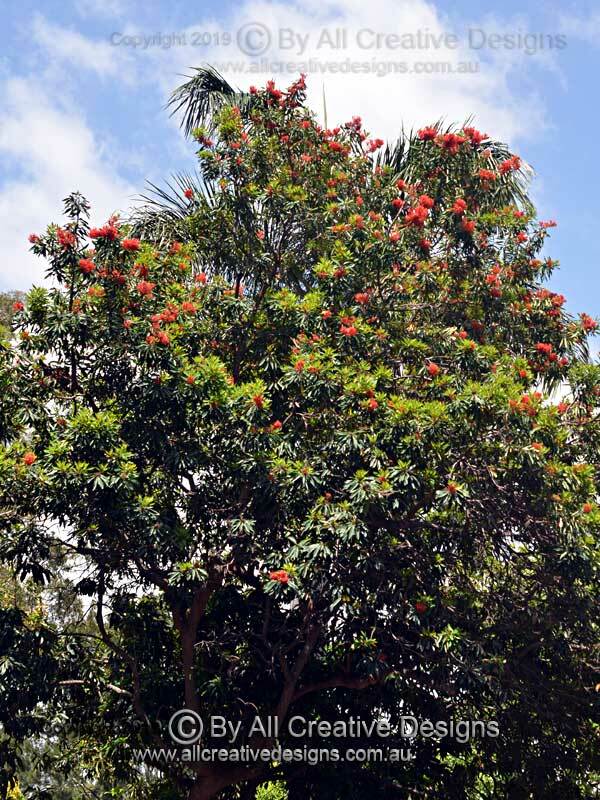 The genus Brachychiton is known for having beautiful and unusual flowers, the related Flame Tree (B. acerifolius) is a standout example. 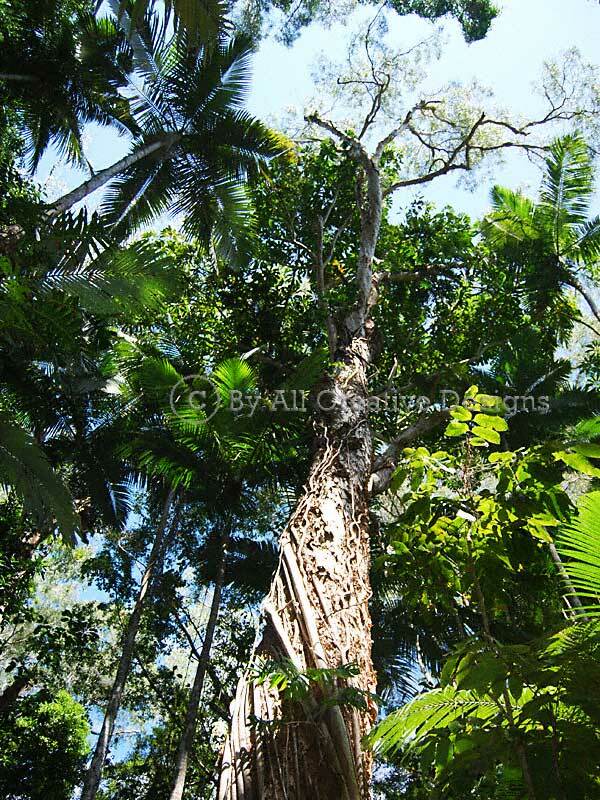 The natural distribution of the Tropical Kurrajong is restricted to the tropical top end of Australia. 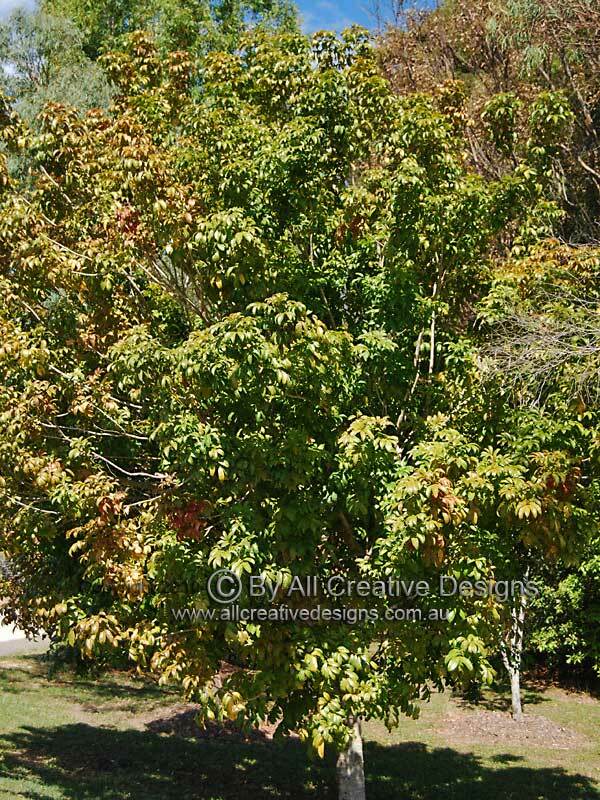 It is a deciduous or semi-deciduous tree, losing its leaves over winter into spring and reaches a height of about 15m (Image 1). Bark on the lower trunk of more mature trees is grey in colour and becomes deeply furrowed (2). Appearing in late winter and spring, clusters of male and female flowers are greenish and deep red on the inside and brownish hairy on the outside. The sepals of the calyx (base of flower) form the distinctive bell shape, whereas petals are absent (3). The fruit is a hard woody follicle up to 10cm long, which turns black when fully ripe. It splits at one side to release rows of seeds covered in a yellow aril. Old follicles found on the ground are a good identification feature (4). Simple leaves have an alternate arrangement (mostly), sometimes close to opposite. They are; up to 18cm long, varied in shape form narrow to broadly ovate (egg-shaped), hairless, strong and firm in texture. 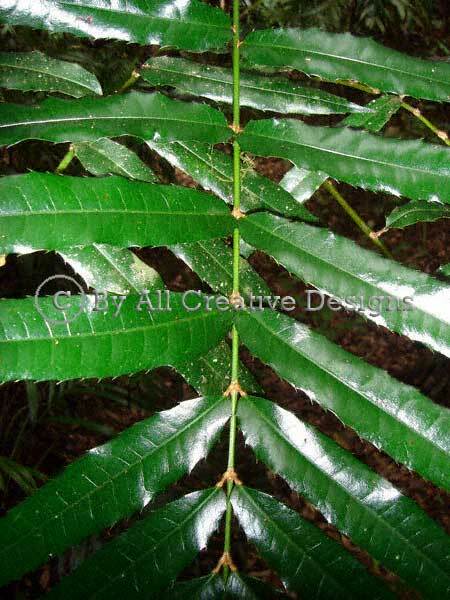 The straight and rigid leafstalk (petiole) is up to 10cm long (5). Distribution: Northern Qld, NT and WA. 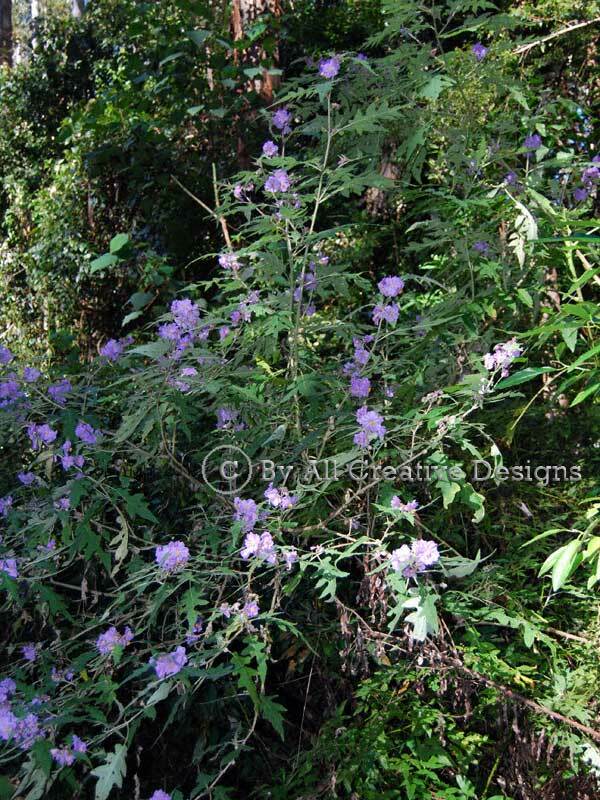 This hardy species is a very popular ornamental tree. It is able to reach a height of 20m or more in its diminished natural habitat of littoral (close to the coastline) rainforests (Image 1). 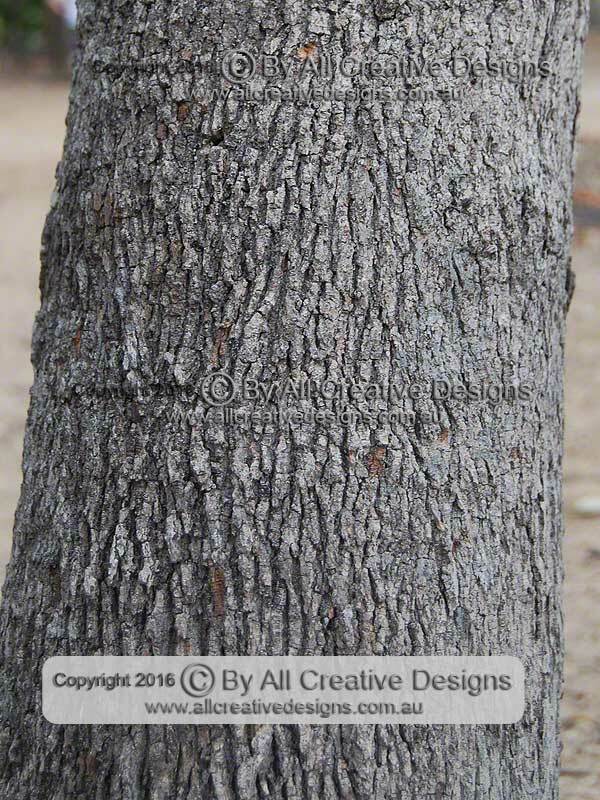 Bark is light grey in colour with a fairly smooth and firm texture; older specimens develop fine fissures at the base of the trunk (2). 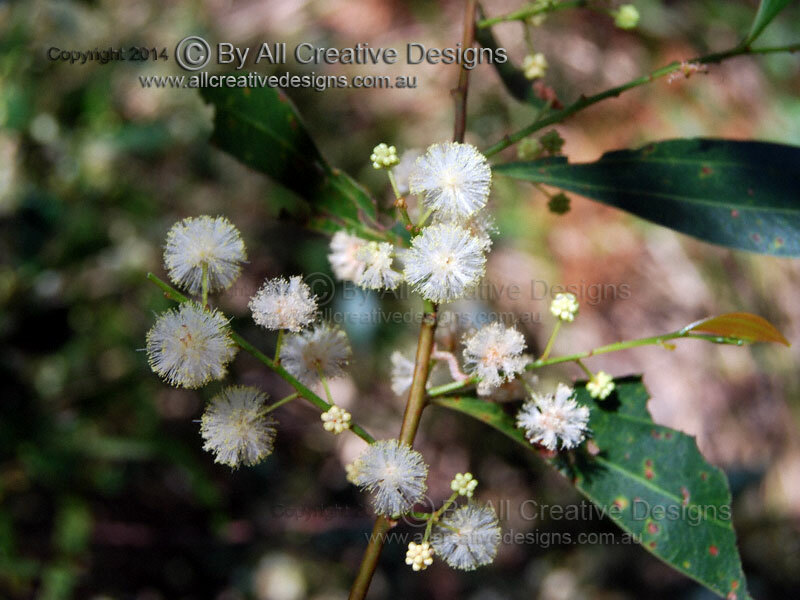 Small cream and yellow coloured flowers bloom over the winter months (3). 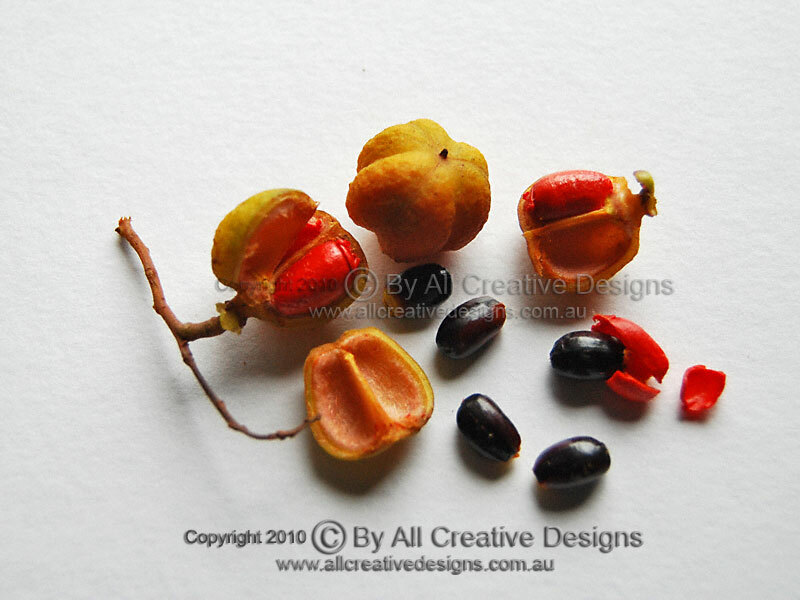 The fruit, a capsule, is orange-brown, mostly 3-lobed and contains 3 black and shiny seeds, which are covered in a thin but firm and bright red coloured aril (4). 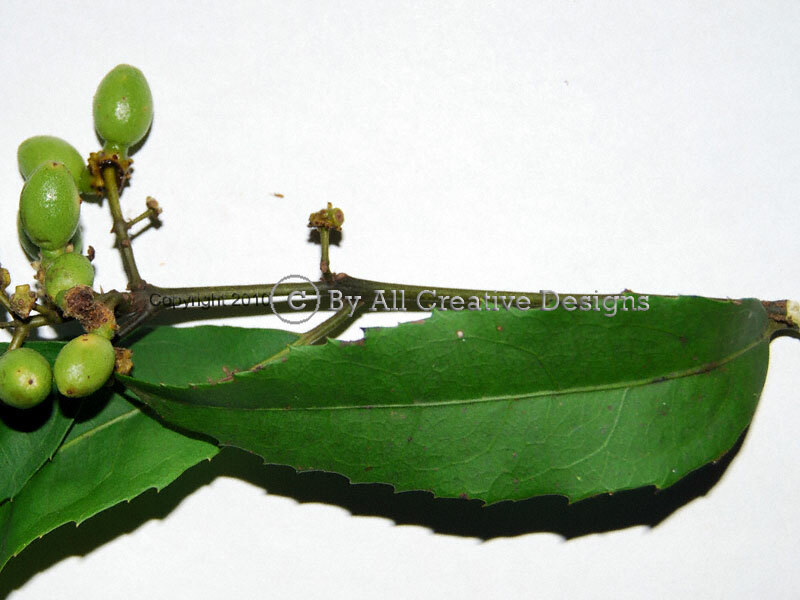 Pinnate (once divided) compound leaves with an alternate arrangement consist of 3 to 11 leaflets. Leaflets are; up to 14cm long, mostly oblong to narrow obovate (reverse egg-shaped) with entire margins, dark green, hairless on upper surface, paler on lower surface with scattered fine brown hair on mid-vein, petiolules and petiole. Leaflets have a fairly firm, leathery texture and feature very prominent pulvinules. Leaflet apex is rounded and base shape is cuneate (5). 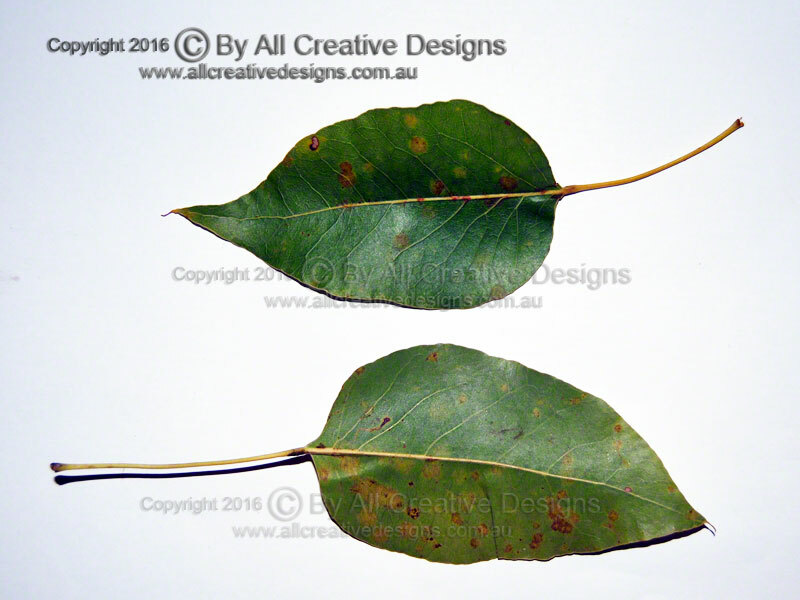 (See Leaf Characteristics Page) Distribution: NSW to southern Qld. Notes: See also Brown Tuckeroo Cupaniopsis flagelliformis (Page 2). 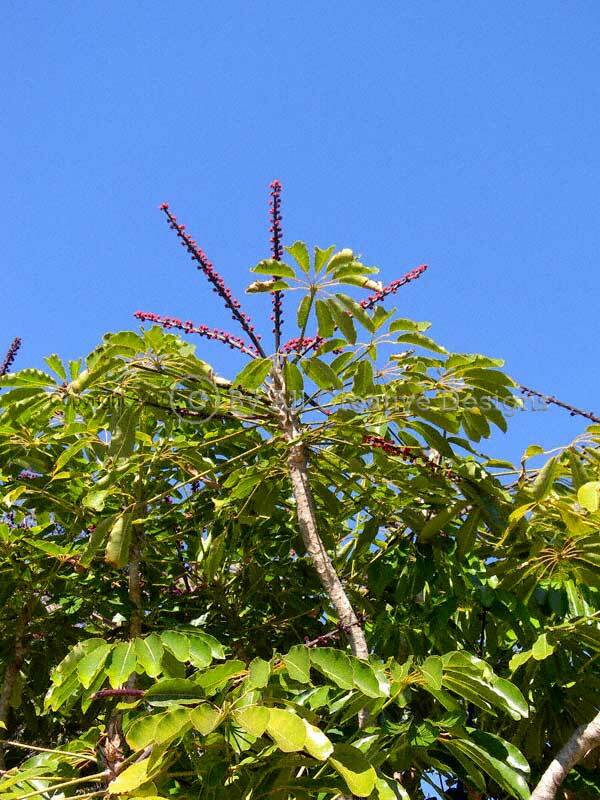 This medium sized native tree species grows up to 10m tall in open (full sunlight) locations, whereas in its natural habitat of subtropical and littoral rainforests it can be more than 20m high (Image 1). 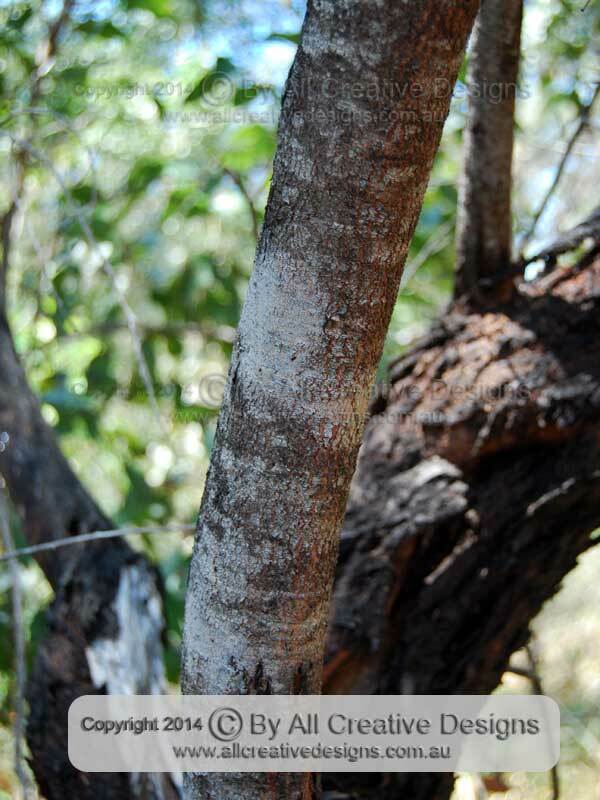 Bark is a whitish grey colour with a rather rough and fissured texture (2). 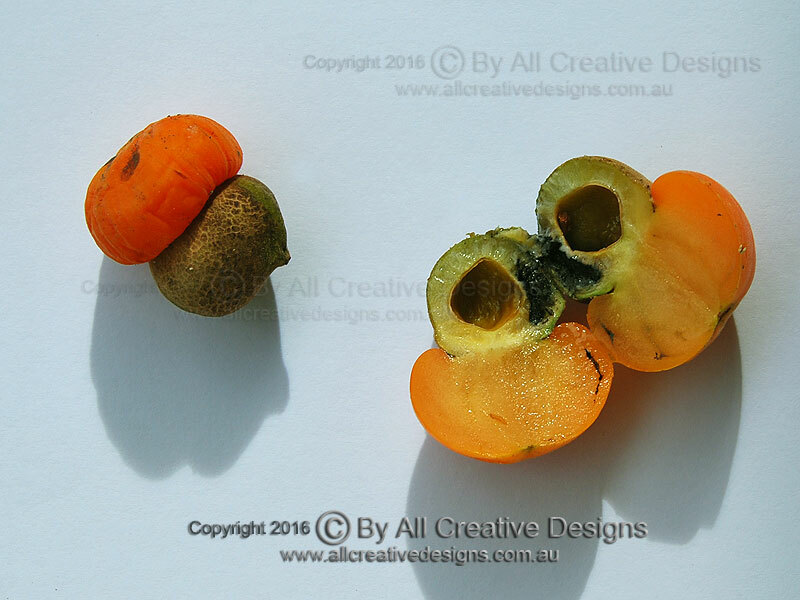 The bright orange fruit (a capsule) is up to 25mm long and 40mm wide and has a characteristic flat part in between its 2 lobes, each containing a shiny black seed (3). 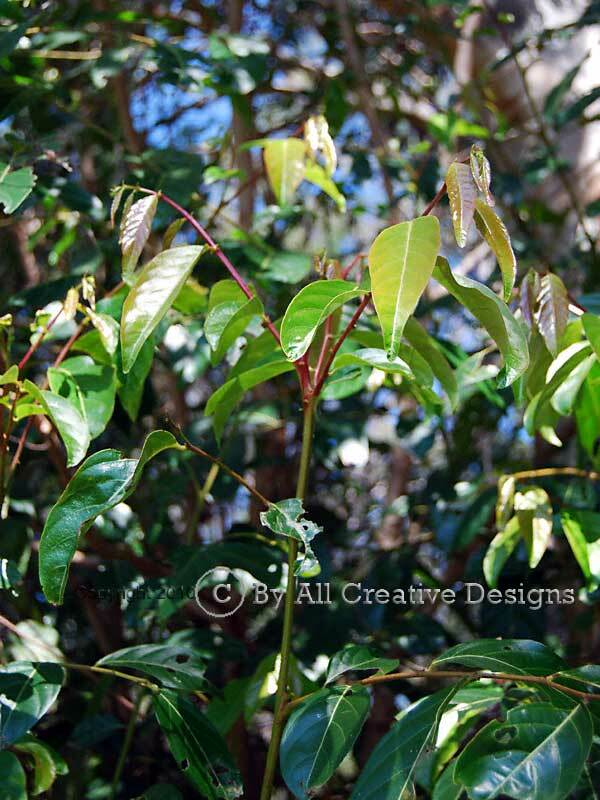 New growth in the dense canopy flushes in tones of pink to pale red. 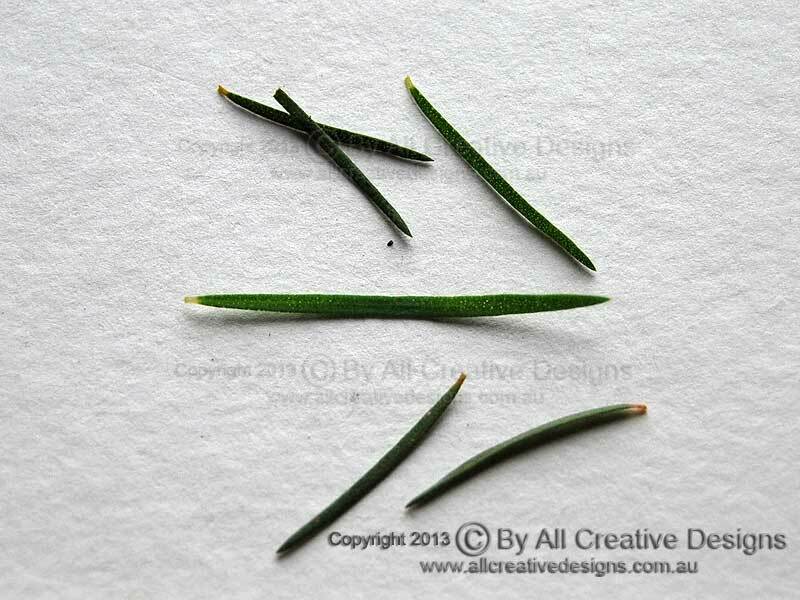 Pinnate (once divided) compound leaves feature up to 10 leaflets, which are; up to 14cm long, oblong to more elliptic in shape with entire margins, dark green, glossy on upper surface, paler green below, mostly hairless, rather thin and soft in texture. Leaflet apex is acute, base shape is rounded. Venation is very prominent with the mid vein being raised on both leaflet surfaces, whereas lateral and net veins are sunken on upper and raised on lower surface, giving the leaflet an undulating (curled) appearance (5). Distribution: NSW mid-north coast to Qld. 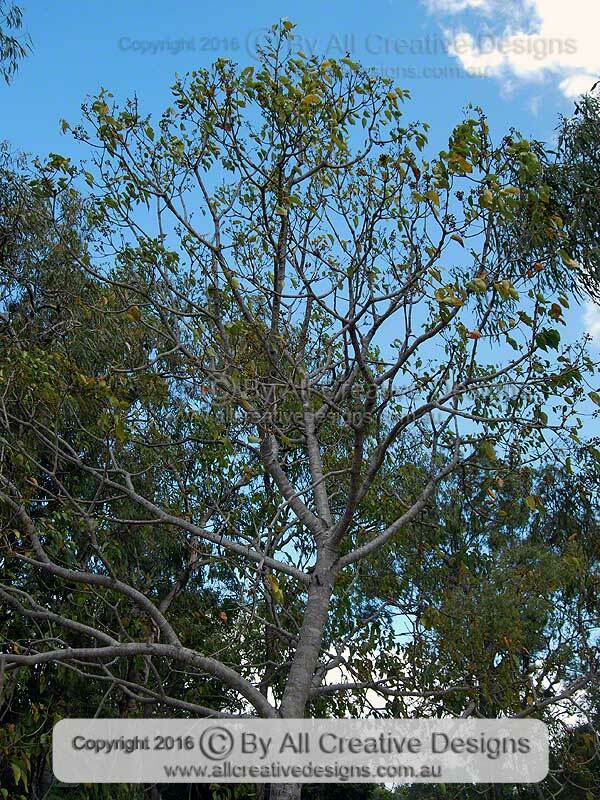 Due to its attractive appearance, hardiness and manageable size this species is often used as an ornamental street tree in northern NSW and southern Qld. 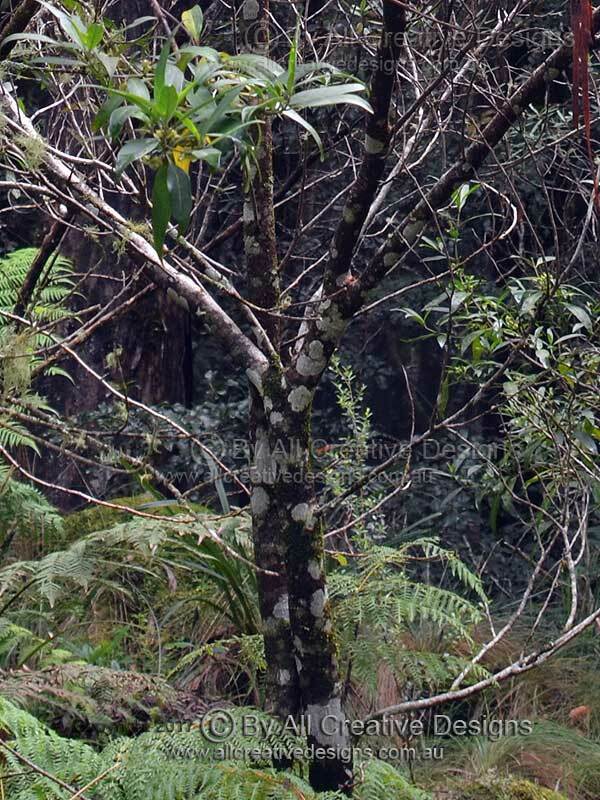 This interesting small tree species is rarely more than 10m tall and only grows within subtropical and warm temperate rainforests. As an understorey species it prefers to grow under low light conditions in wet locations (Image 1). 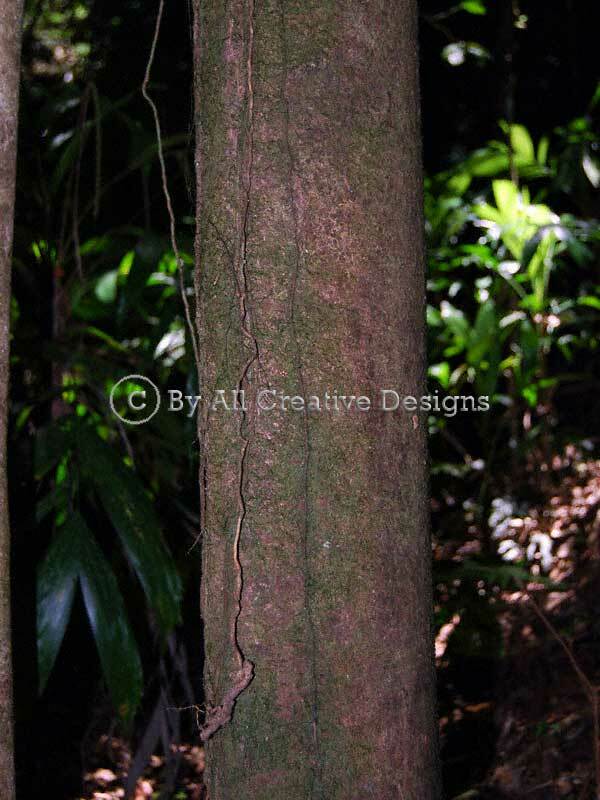 Bark on the slender and upright trunk is a reddish brown in colour with a fine scaly texture (2). The greyish colour of the foliage's underside is a distinctive feature in identification of this species (3). 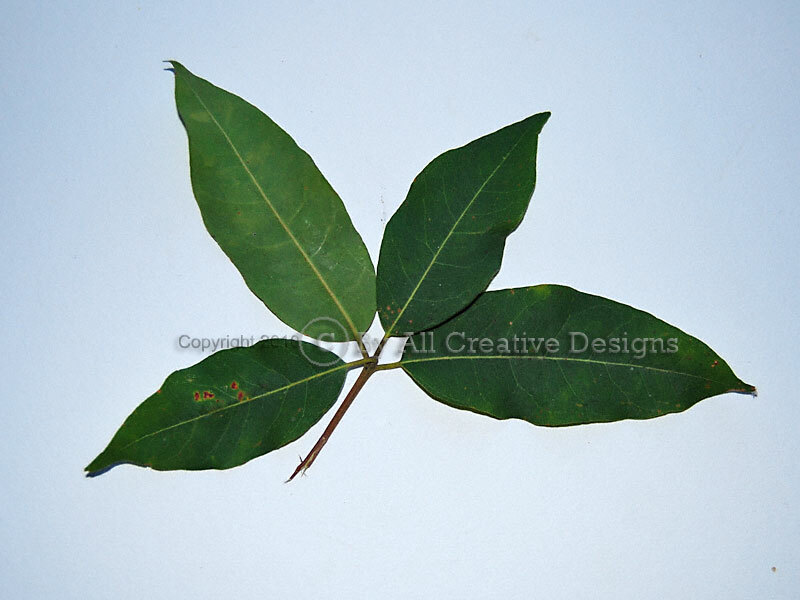 A pinnate compound leaf (adult tree) is made up of 30 or more separate leaflets. 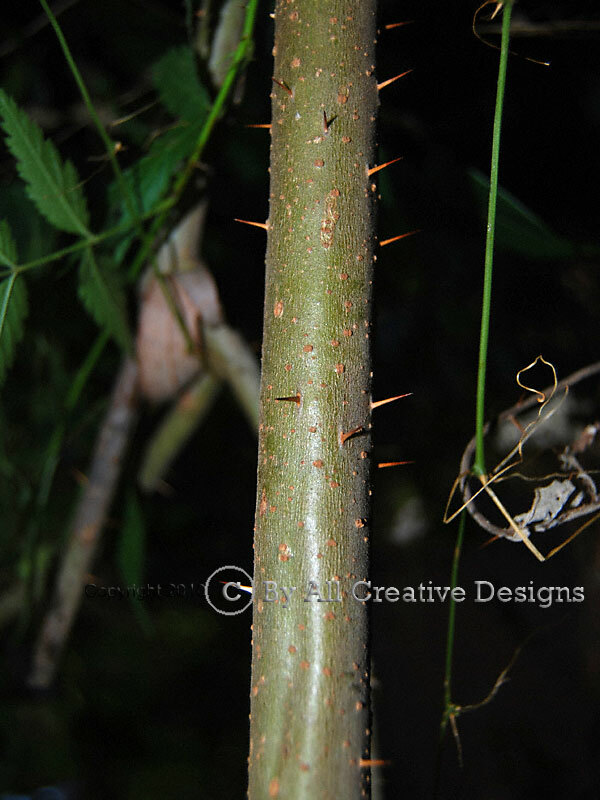 Leaflets are; more than 30 cm long, oblong to narrow oblanceolate (reverse lance-shaped) with sharp prickles extending from toothed margins, dark glossy green on the upper surface, greyish beneath and very firm to stiff in texture. Leaflet apex is acute, base shape is rounded. Venation is clearly visible on both leaflet surfaces with lateral veins being very straight (4 & 5). Distribution: From the mid-north coast of NSW to Qld. 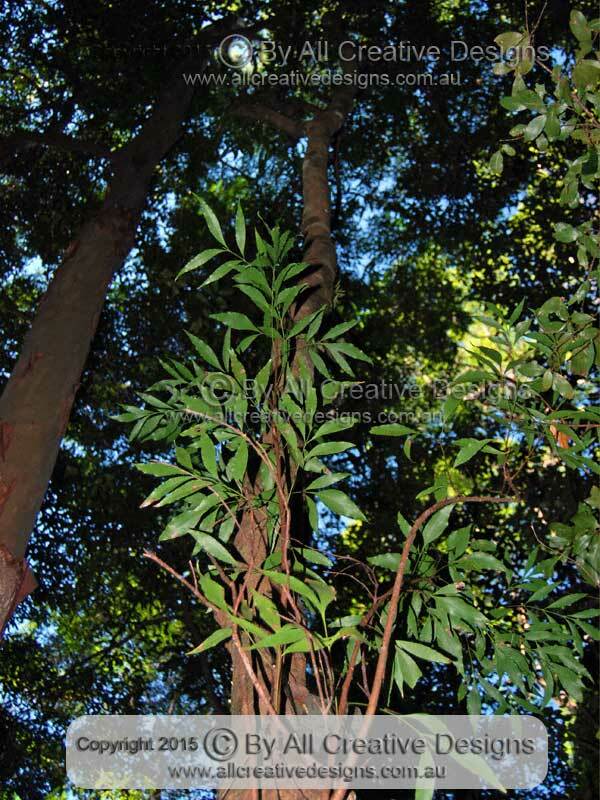 This very tall native species occurs in tall open forests and in transition zones along subtropical rainforests. 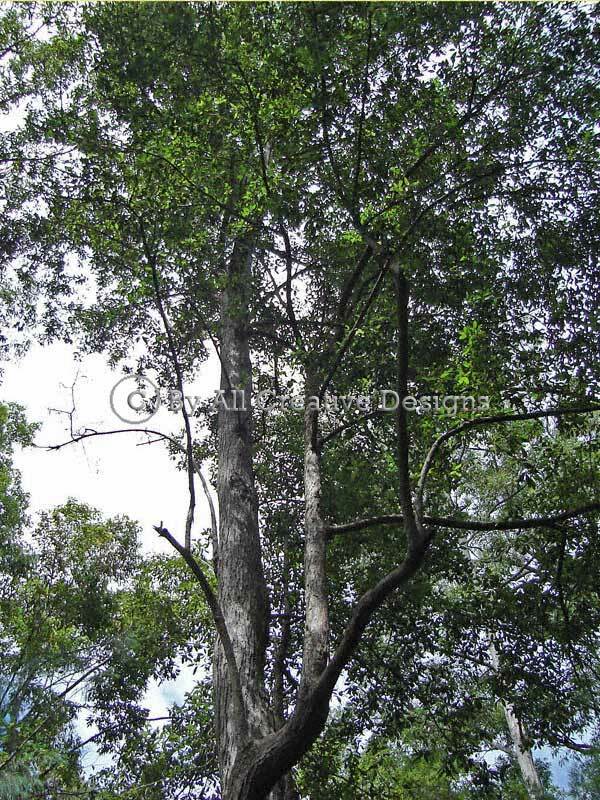 Under favourable conditions the Turpentine tree can reach up to 50m in height (Image 1). 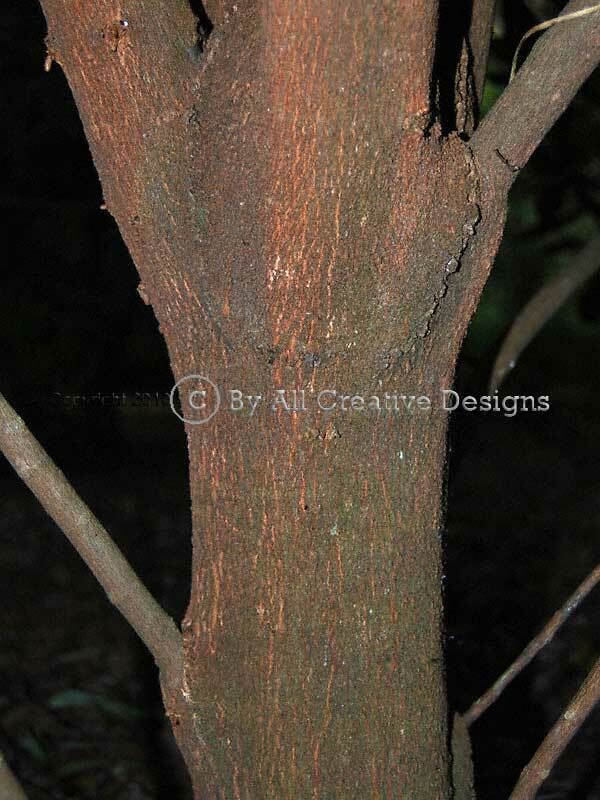 Bark is reddish light brown in colour with a very stringy and fibrous texture (2). Gorgeous white flowers are globose in shape and measure up to 25 mm across. 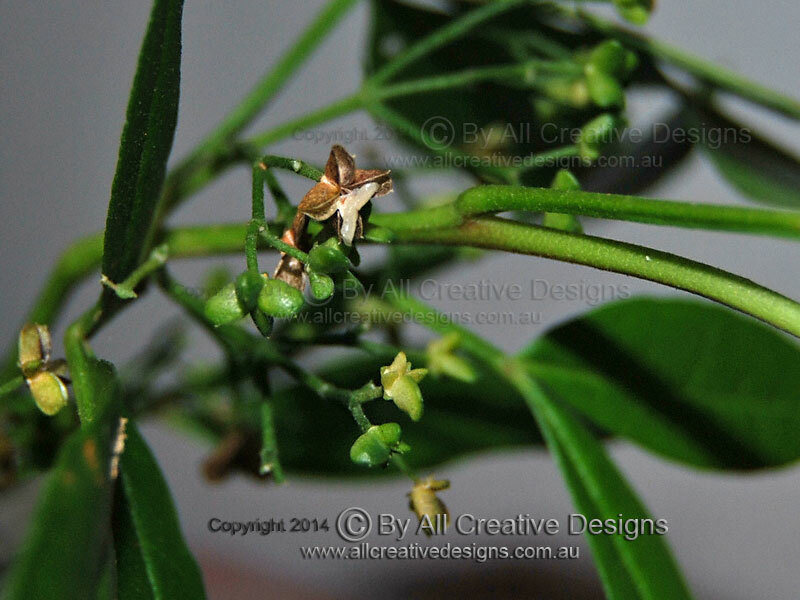 Mostly groups of 4 flowers with individual stalks up to 3cm long emerge at the end of branchlets (3). 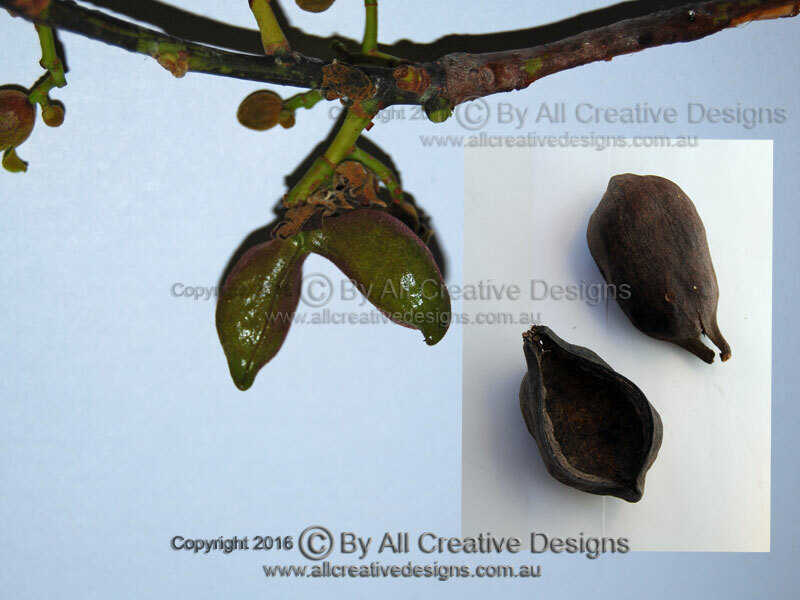 The very unusual shaped fruit is often found scattered around the base of Turpentine trees and can aid in identification of this tree species (4). 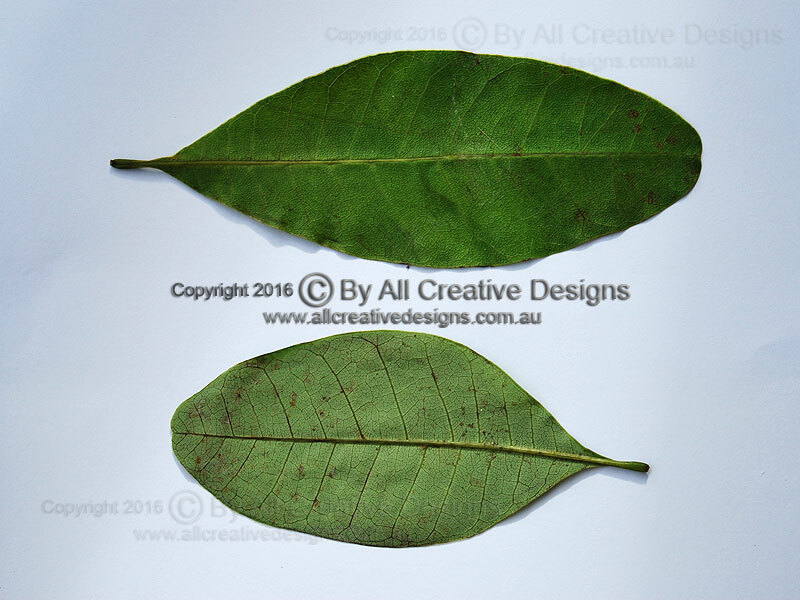 Simple leaves grow in a whorl arrangement beneath the growing tip (opposite thereafter) and are; up to 10 cm long, mainly ovate in shape with entire margins, dark green and hairless on top, dull whitish hairy on their underside, firm thick and leathery in texture. Leaf apex is acute, base shape is cuneate. Mid vein is raised and pronounced on lower leaf surface, laterals are rather faint ( 5). 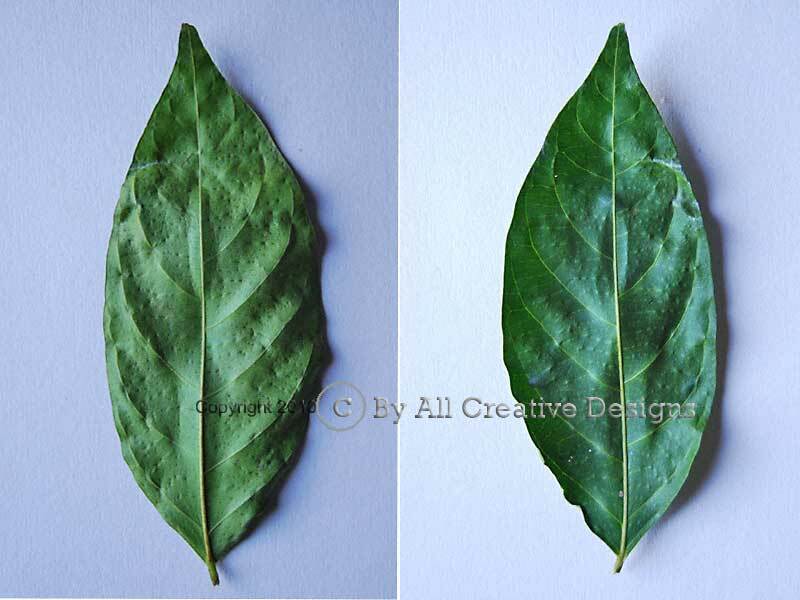 (See Leaf Characteristics Page for an explanation of definitions used.) Distribution: NSW south coast to Qld. 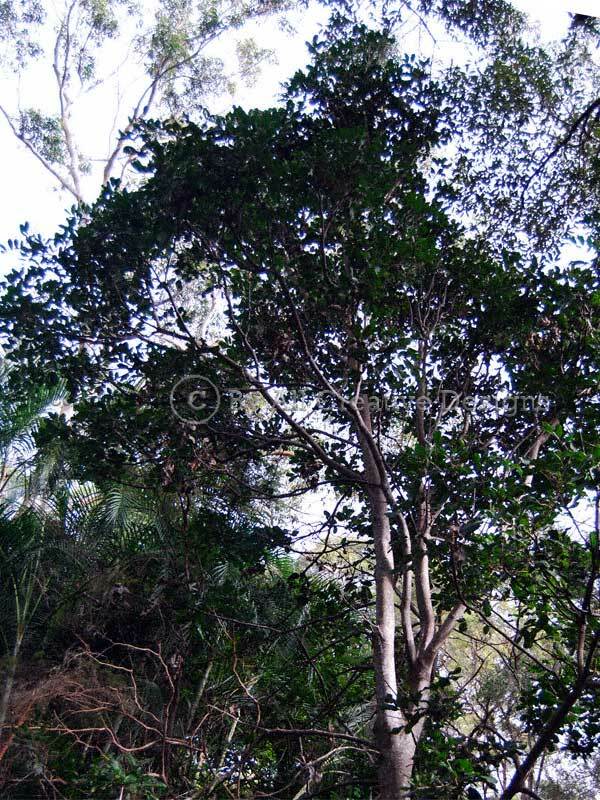 This subtropical rainforest species attains a height of up to 15m and occurs mainly as an understorey tree (Picture 1). Often multiple trunks support a glossy and dense canopy (2). 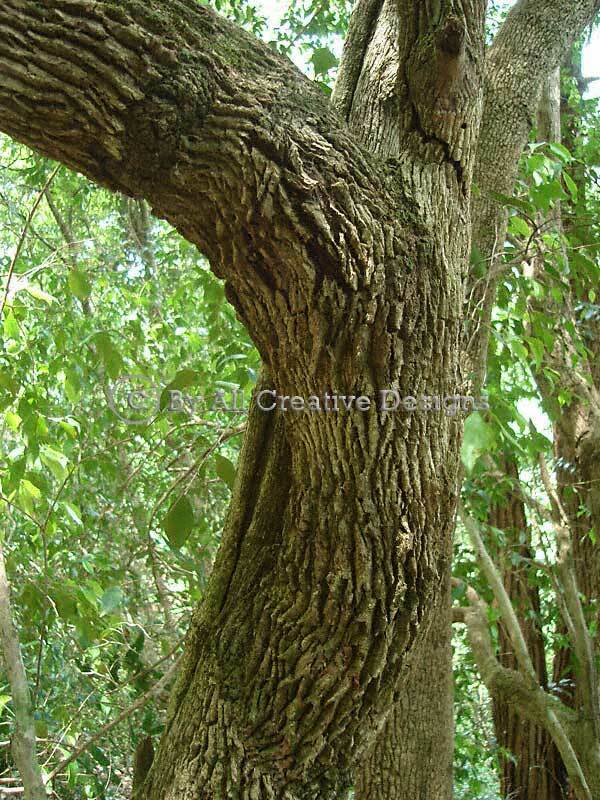 Bark is very dark, appearing black from a distance, and has a firm rough texture. Fine longitudinal fissures show a cream coloured under layer (3). 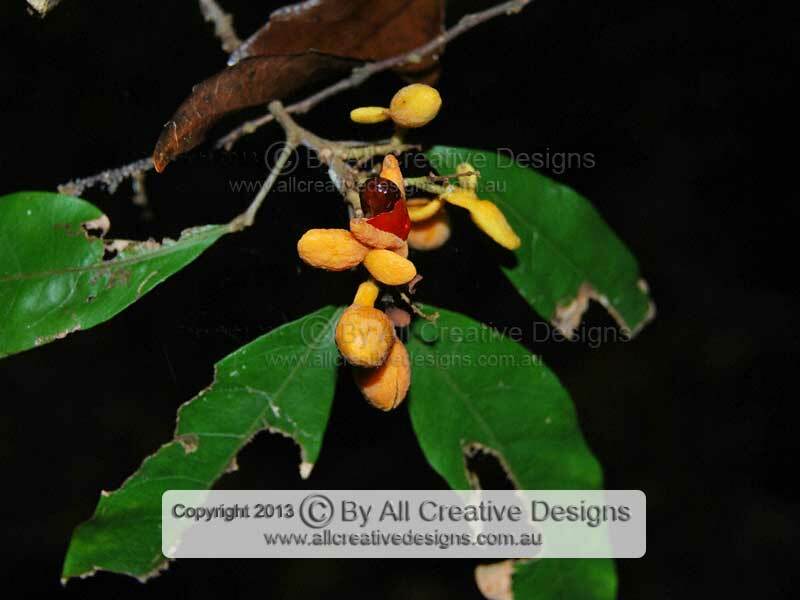 The fruit is a hard capsule up to 15mm long and bright yellow in colour. 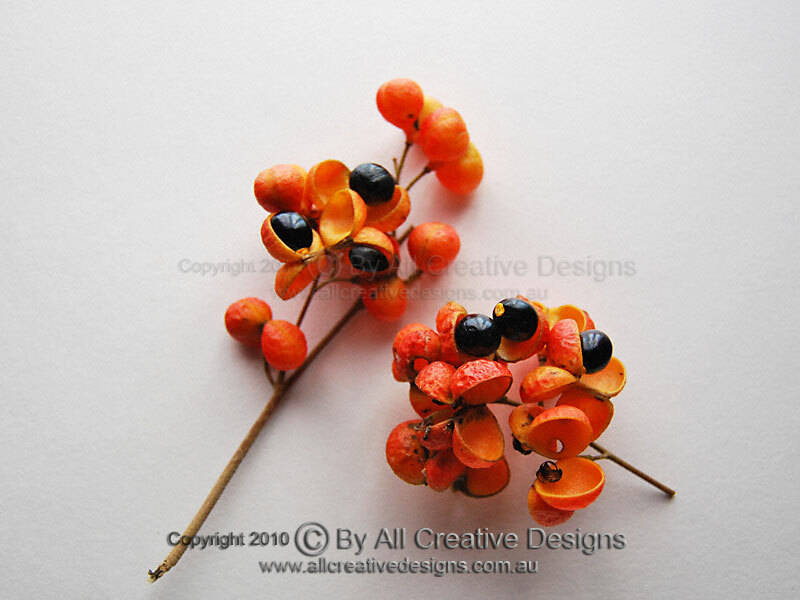 It contains one or two black seeds (one per lobe) enclosed in a red and fleshy aril (4). 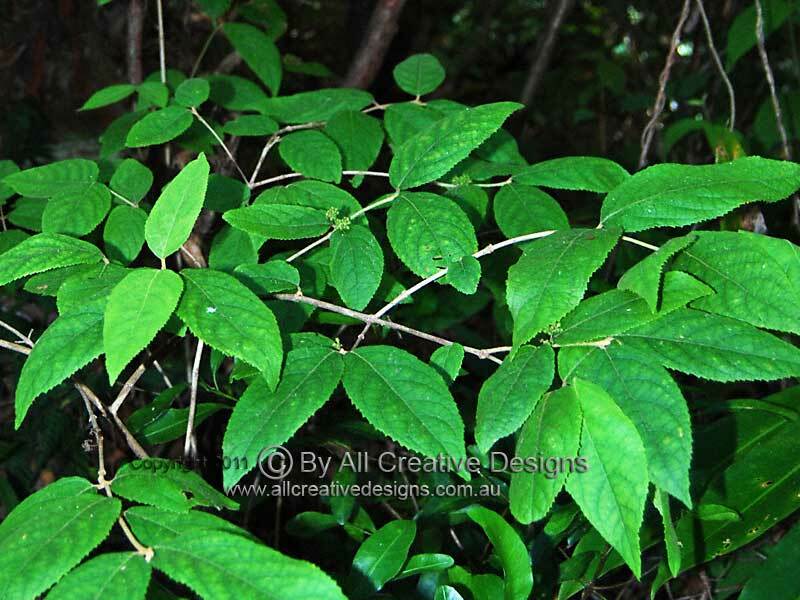 Distinctive compound leaves (bifoliolate) feature two leaflets, which are; up to 12 cm long, mostly lanceolate in shape with undulating (wavy) margins, glossy and hairless. Petiole (leaf stalk) is up to 4 cm long and small domatia are visible on lower leaf surface (5). Distribution: NSW north coast to central Qld. 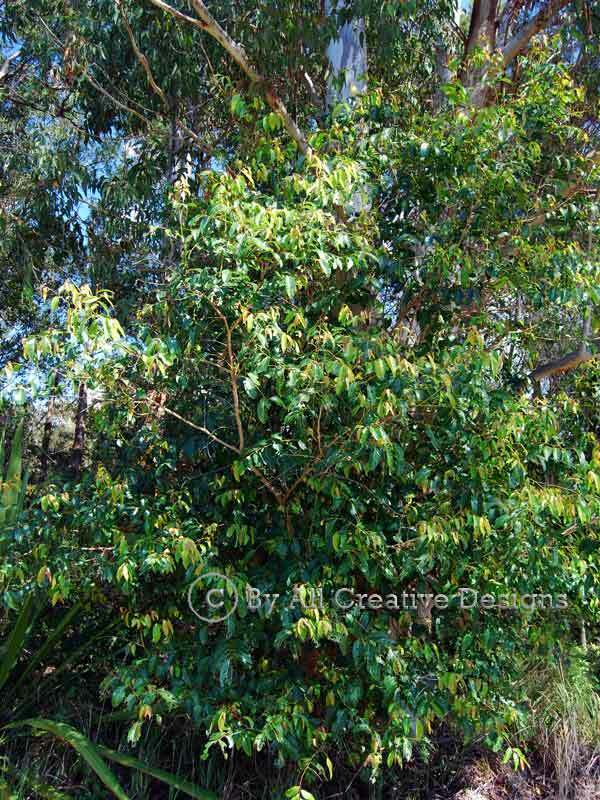 This shrub or small tree can reach a height of 12m and prefers sunny positions in tall open (Eucalypt dominated) forests (Image 1). Bark on older trees becomes fissured and rough especially at the base of the trunk. It is a reddish brown in colour, weathering to grey on the surface (2). 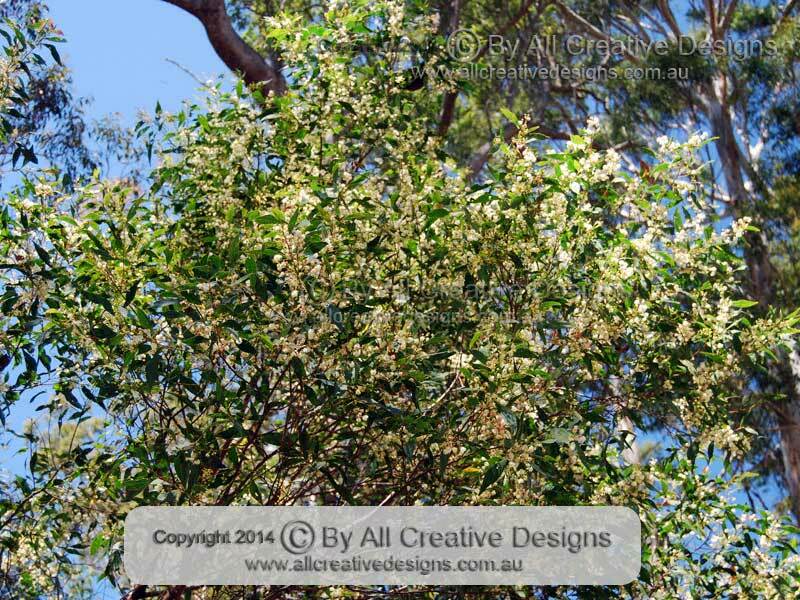 Over spring masses of cream white to pale yellow coloured flowers cover the tree. Flower heads, measuring less than 1 cm in diameter, are globose in shape and held on small racemes up to 6 cm long (3 & 4). 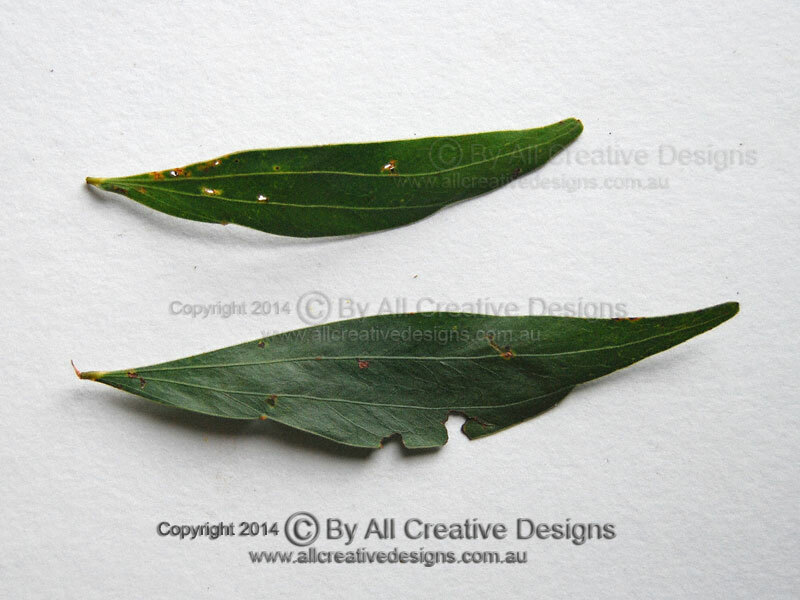 Phyllodes (leaves) have an alternate arrangement and are; up to 12 cm long, irregular elliptic or lanceolate (lance-shaped) with entire margins, dark green, dull on both surfaces, hairless, strong and slightly leathery in texture. Apex gradually narrows into a rounded tip; base shape is cuneate. A prominent gland is present on one side of the phyllode and 2 longitudinal veins are clearly visible on both surfaces, (sometimes an additional 1 or 2 longitudinal veins are less obvious) (5). Distribution: From NSW south-coast to southern Qld. 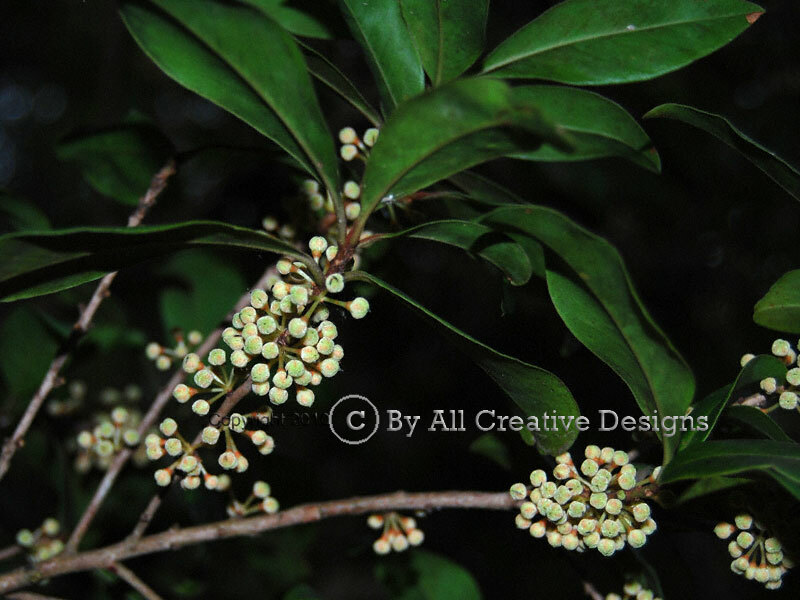 Found in coastal forests and swamps the Umbrella Cheese Tree attains a height of up to 15m. It is as species with a very wide distribution range in Australia and South-East Asia (Image 1). Bark is brown in colour with a rough and flaky texture (2). Attractive new growth is salmon coloured and young branches are a vivid red (3). The ripe fruit is; flattened globular in shape with mostly 5 lobes, up to 12mm in diameter, yellowish green in colour and covered in fine hair (4). 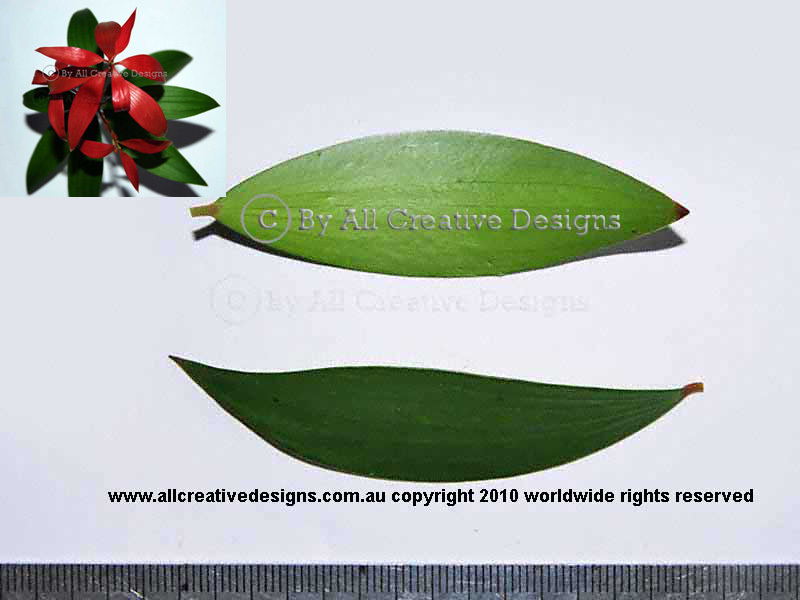 Neatly alternately arranged simple leaves are; up to 20 cm long, mostly elliptic in shape with entire margins, fairly glossy on top (right), paler and shiny beneath (left), hairless, rather thin and soft in texture. Apex is acute with a blunt point, base shape is rounded. 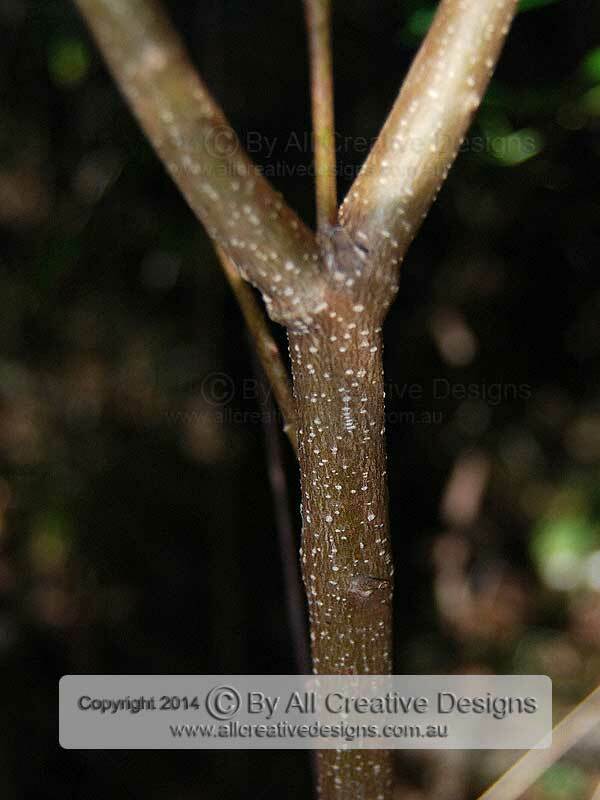 Petiole is up to 5 mm long. Venation is clearly visible, mid vein raised on both surfaces, laterals prominent and curved (5). Distribution: NSW upper mid-north coast to North Qld, NT & WA. 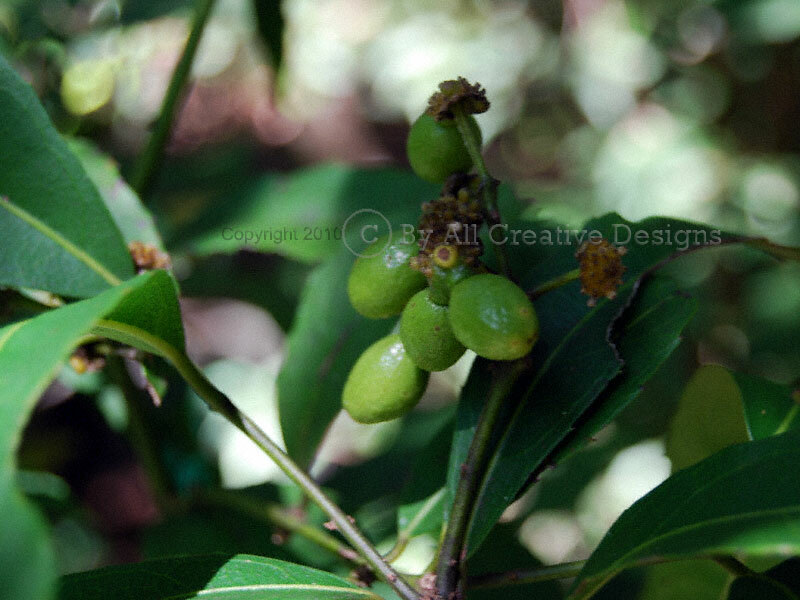 Note: Similar to the Cheese Tree Glochidion fernandi (See Page 3), differences in identification characteristics are; fruit (for G.fernandi) is smooth not hairy, mature leaves are smaller and bark is more stringy. In its natural habitat which are different types of tropical rainforests, the Umbrella tree often starts life as an epiphyte. 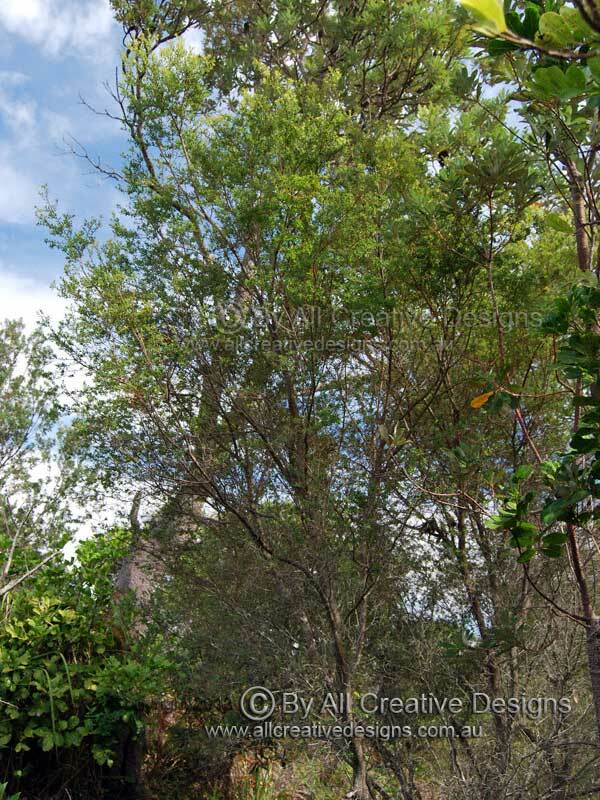 The specimen shown is strangling a Long-leaved Paperbark Melaleuca leucadendron and thereby reaching a height of 35m, whereas free standing trees rarely reach 10m, and are mostly multi trunked (Image 1). Bark is firm with horizontal ridges and blisters; colour is light grey (2). The red fruit is fleshy and held on long stems up to 60 cm long (3). 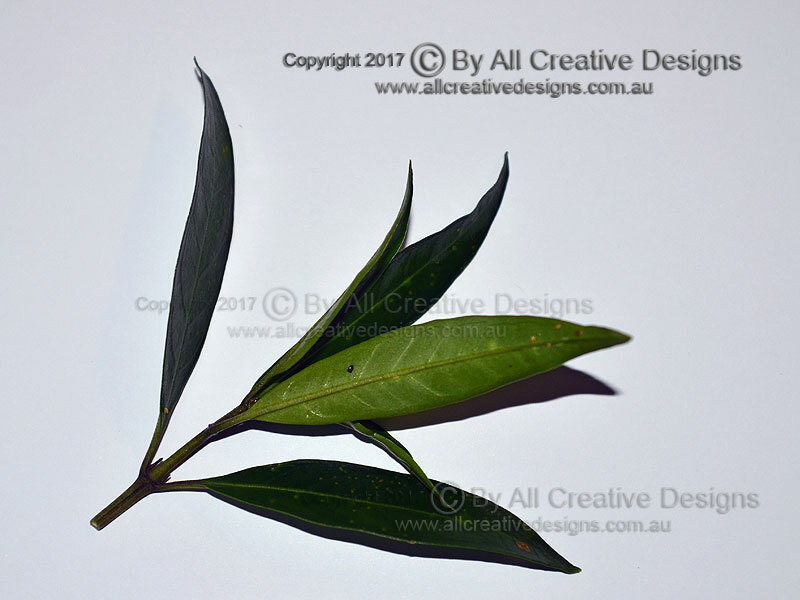 Large palmate compound leaves feature up to 15 leaflets, which are; up to 25 cm long, obovate to oblong in shape with entire margins, glossy on top, hairless, smooth and firm in texture. The rounded leaf apex has a short sharp point, (mucronate). 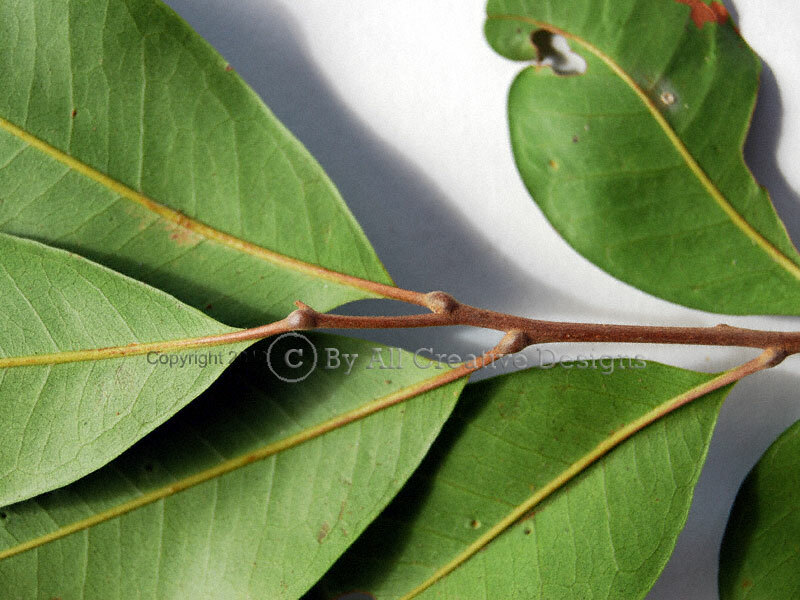 The very solid petiole (leaf stalk) is up to 50 cm long (4 & 5). Distribution: Well known as a street / suburban tree species and now found invading subtropical rainforests from the NSW mid north coast to southern Qld. Original habitat is northern Qld. 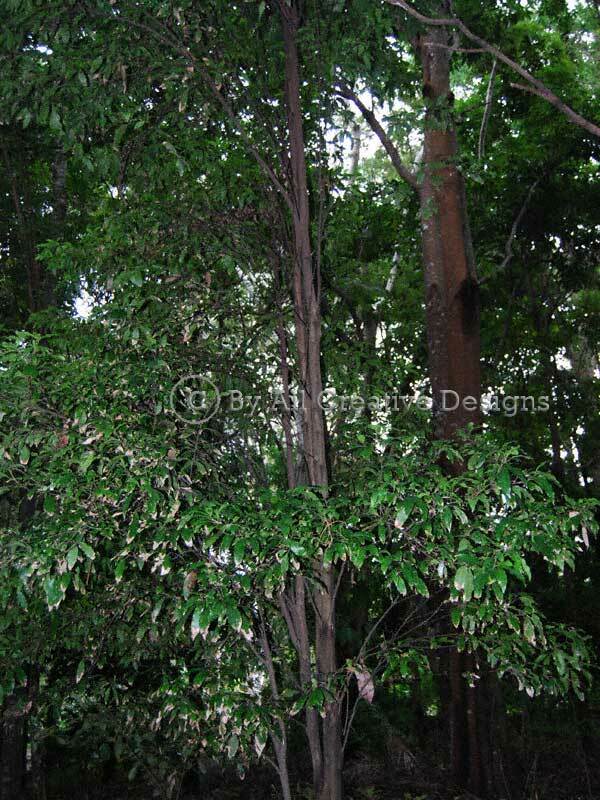 Variable Muttonwood or plain Muttonwood is a small tree reaching a height of up to 10m and occurs in different types of rainforests and adjacent tall open forests (Image 1). 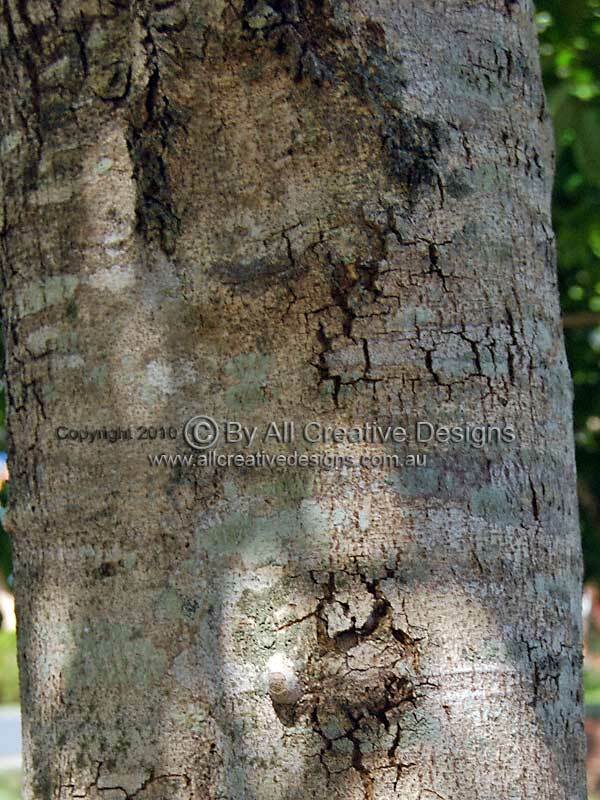 Bark is a grey in colour with soft, corky and reddish brown coloured blisters covering the surface on older trunks. Younger branches have a smoother bark texture (2). 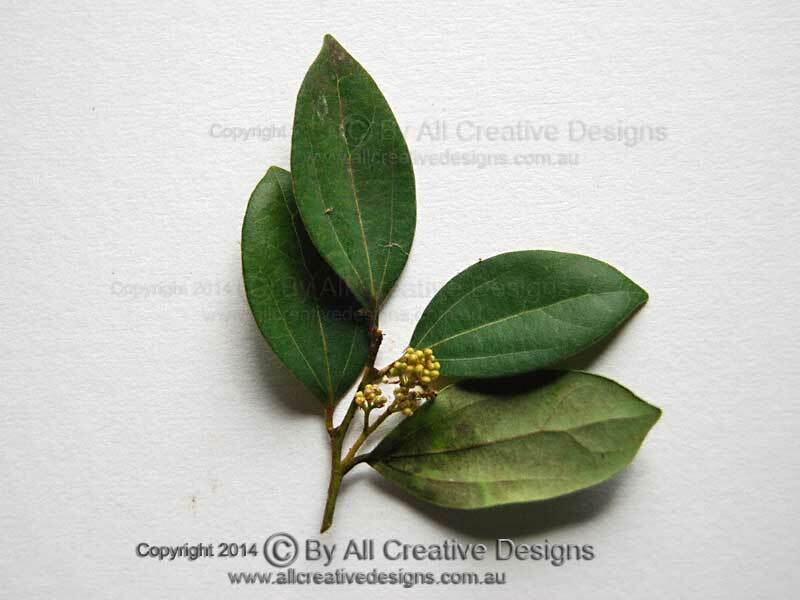 Small pale green coloured flowers are globular in shape, measuring 2 to 3 mm in diameter and are borne all over branches. They held in groups of nearly always 5 on a common stalk up to 5 mm long. Flowering in often abundant over the winter months (4). 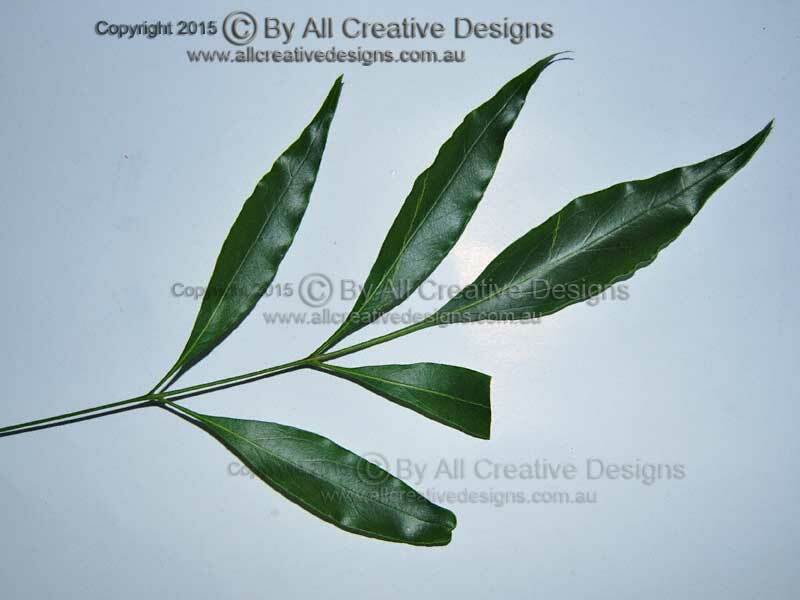 Simple leaves with an alternate arrangement are; up to 9 cm long with mostly entire margins (toothed on saplings), broadly oblanceolate (reverse lance-shaped) to obovate in shape, very glossy on their upper surface, thick and firm in texture. 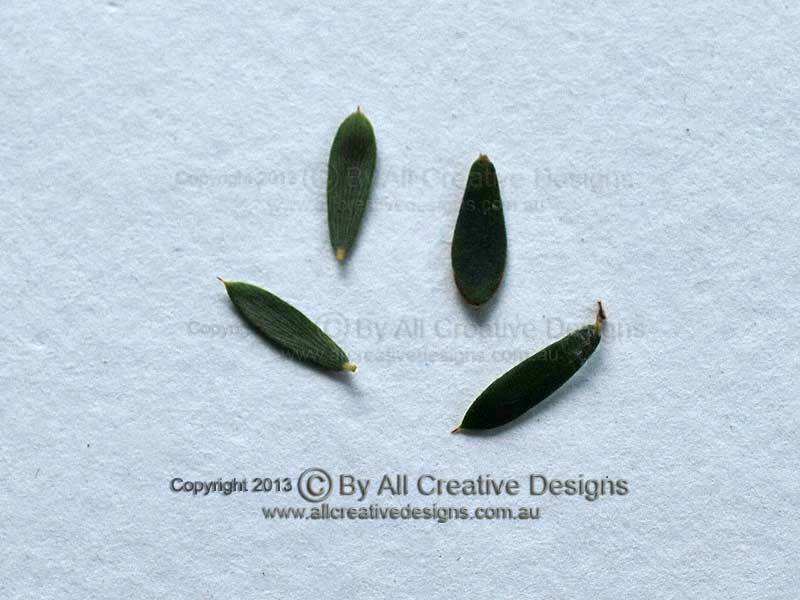 Leaf apex is rounded and base is wedge-shaped (5). Distribution: NSW south coast to central Qld. 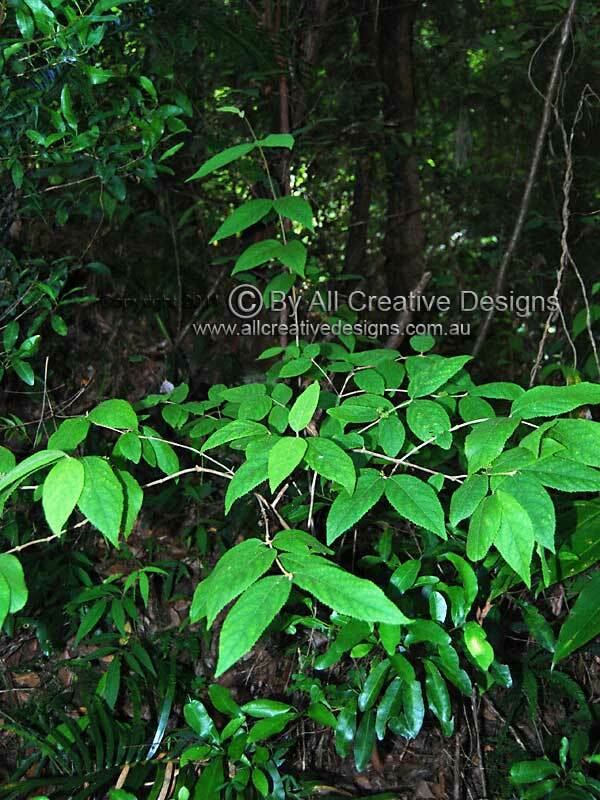 The Veiny Graptophyllum is a rare native shrub less than 5m high, which occurs as an understorey species within subtropical rainforests (Image 1). Older surface bark is grey in colour with a rough flaky texture and exposes a new light brown layer after shedding (2). 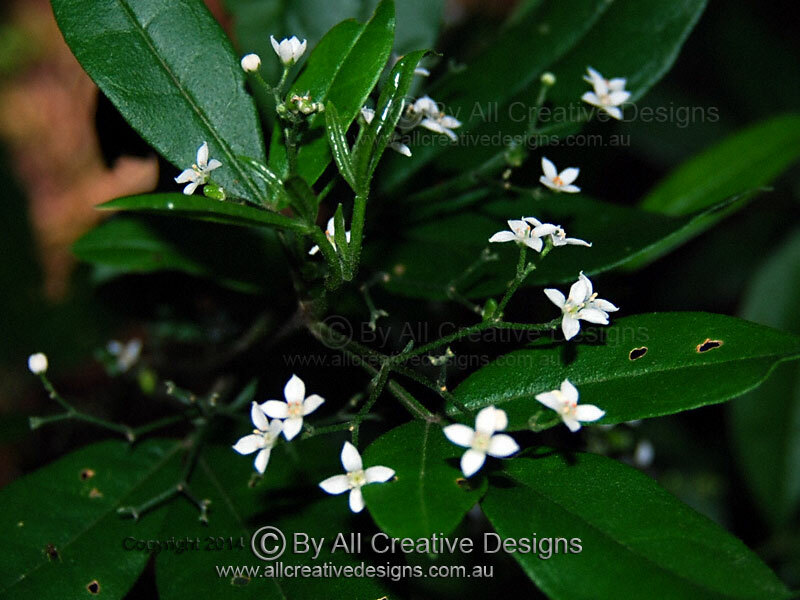 Masses of tubular shaped white flowers are up to 12 mm long and 8 mm in diameter. They bloom over winter and in early spring (3 & 4). 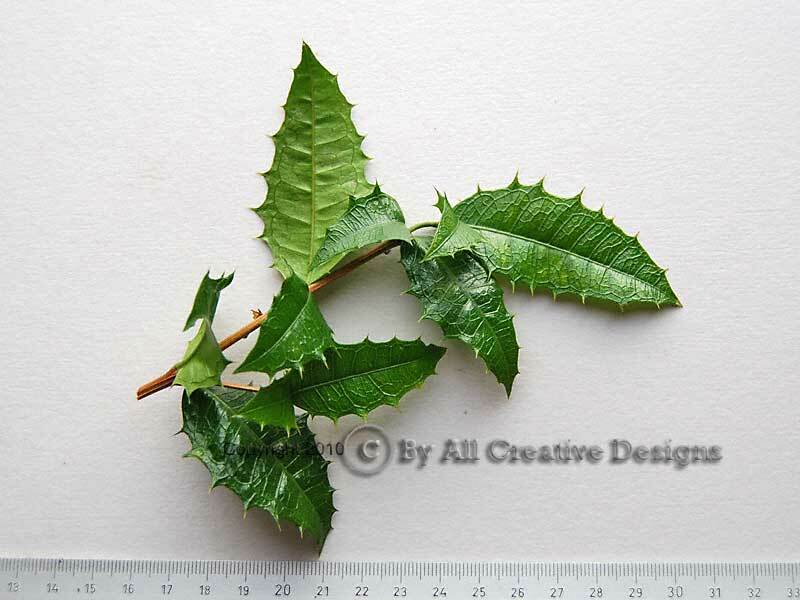 Simple oppositely arranged leaves are; up to 10 cm long, elliptic to ovate in shape with toothed margins topped by very sharp spines, hairless, dark green and glossy on top, paler and shiny below, firm and stiff in texture. Apex is acute with a terminal spine, base shape is rounded. Reticulate venation is clearly visible on both leaf surfaces (5). Distribution: Sunshine coast Qld. 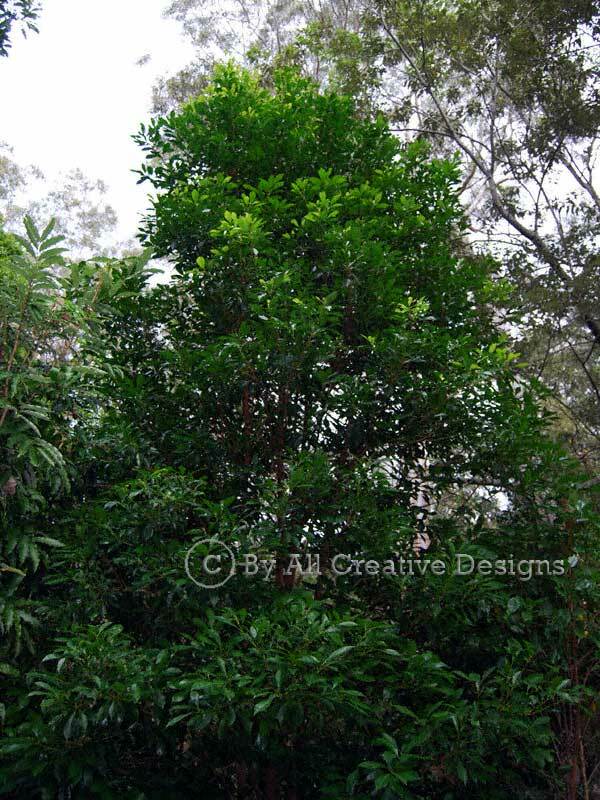 This large native shrub or small tree (up to 8m) is found in a range of different forest types, ranging from rainforests to drier tall open forests (Image 1). Bark is rather rough and brown at the base changing to a smoother texture and a dark green colour on younger branches and stems (2). Fruit is ovoid in shape, up to 18mm long and changes from light green to a dark blue colour when ripening. The swollen fruit receptacle turns to orange and is often left behind after the fruit has fallen (3 & 4). 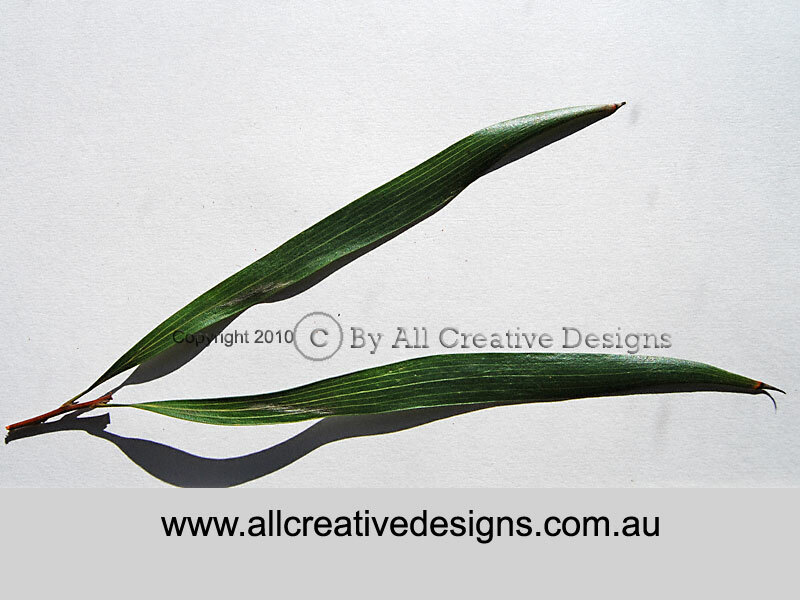 Simple leaves with an opposite arrangement are; up to 14 cm long, narrow to broad elliptic in shape with toothed margins featuring a hard tip, hairless with a smooth and stiff texture. 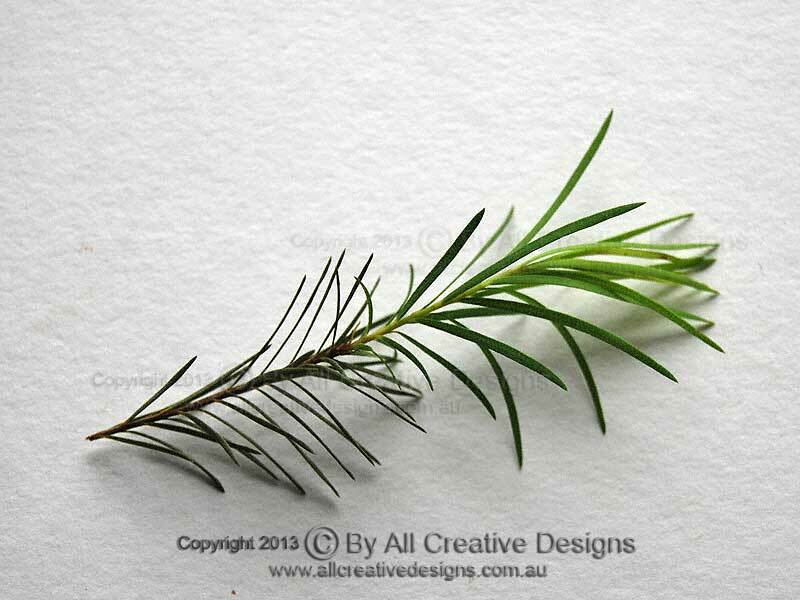 Leaf apex shape is variable; long acuminate or acute, fine or bluntly pointed. Venation is prominently raised and visible on lower surface (5). Distribution: NSW south coast to northern Qld. 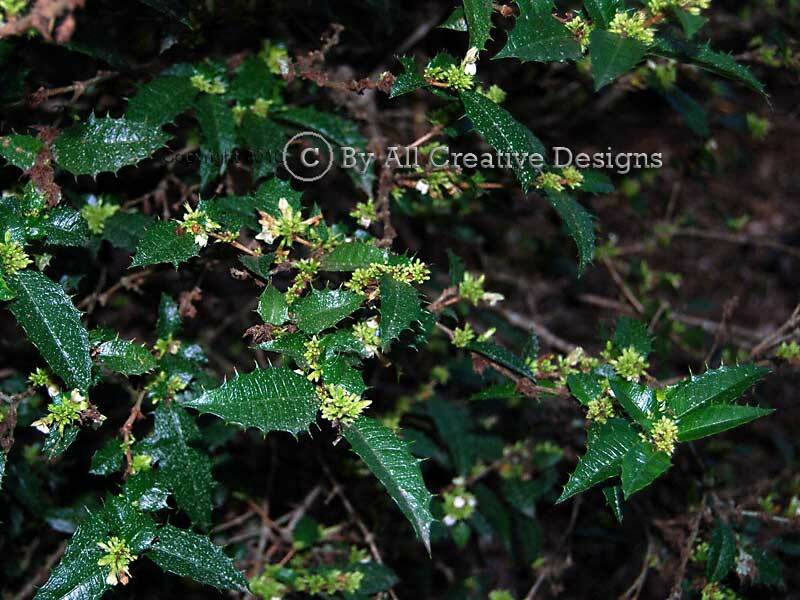 This native shrub has become relative uncommon as much of its natural habitat has been overtaken by invasive Lantana species. It reaches up to 2m high with multiple straggling stems arising from its' base. 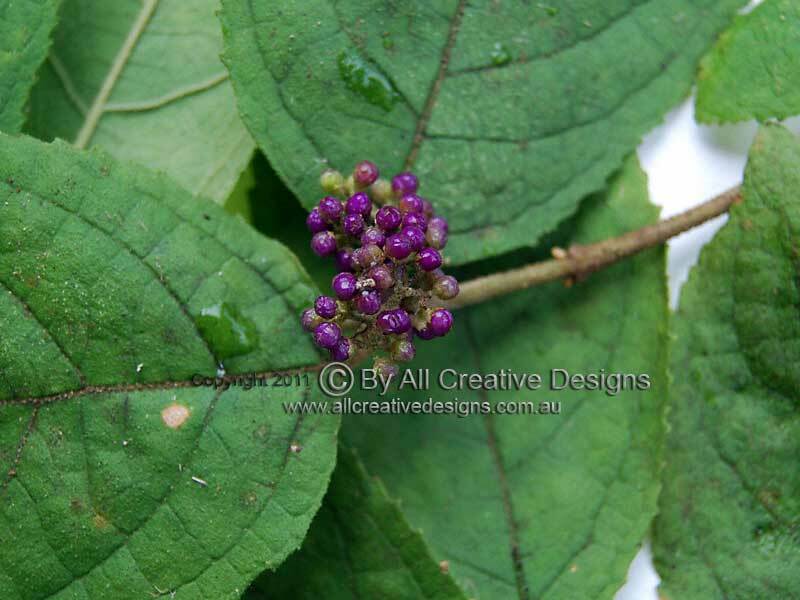 It is mostly found on margins of rainforests and in adjacent wet tall forests (Picture 1). 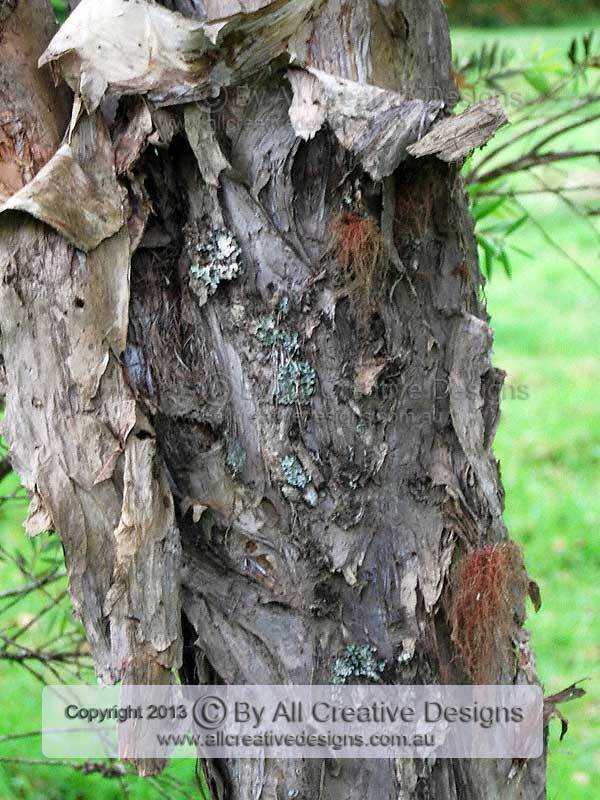 Bark on older stems is a greyish cream in colour with a finely rough texture (2). In autumn the fruit turns from green to a vivid purple making this otherwise inconspicuous shrub a stand out feature in the undergrowth. 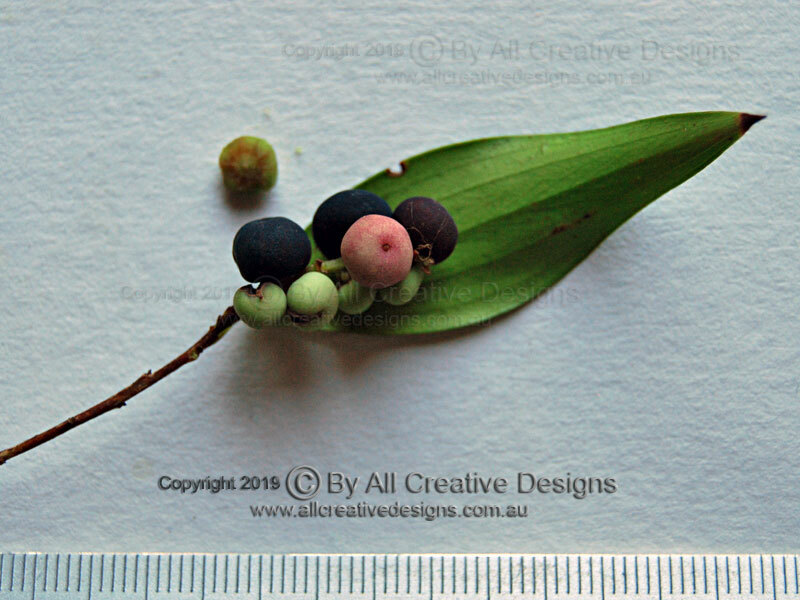 The tiny berry measures only 2 to 3 mm in diameter and contains up to 5 very small and hard seeds (3). 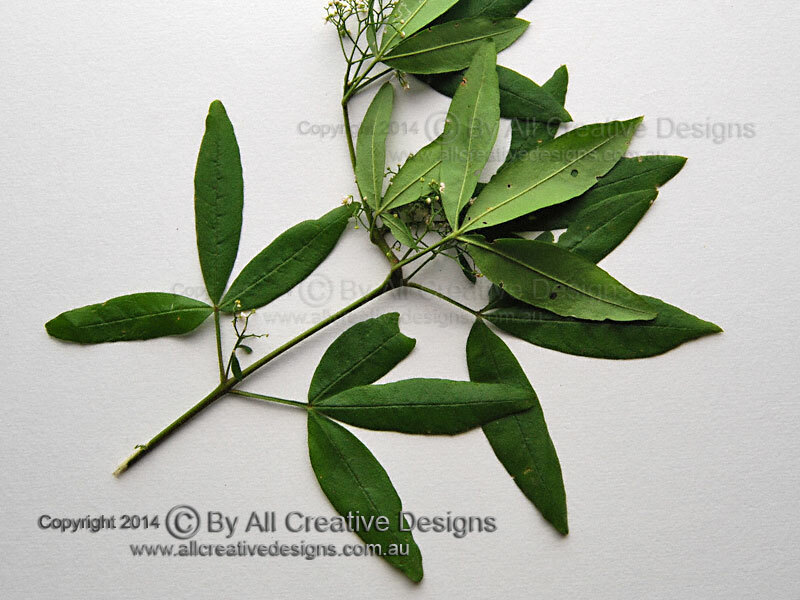 Simple leaves with an opposite arrangement are; up to 15 cm long, ovate to broad lanceolate in shape with finely toothed margins, hairy on both leaf surfaces (more so on lower surface) thin with a very fine sandpapery texture (despite its name). Leaf apex shape is acute (gradually tapering) to attenuate (abruptly tapering) into a fine point, base shape is rounded. Venation is a good identification characteristic of this species when no fruit is present. Mid rib and lateral veins are brown in colour and finely hairy (short, brittle) on top. All veins including net veins are densely hairy (short, pale cream in colour) on lower leaf surface. 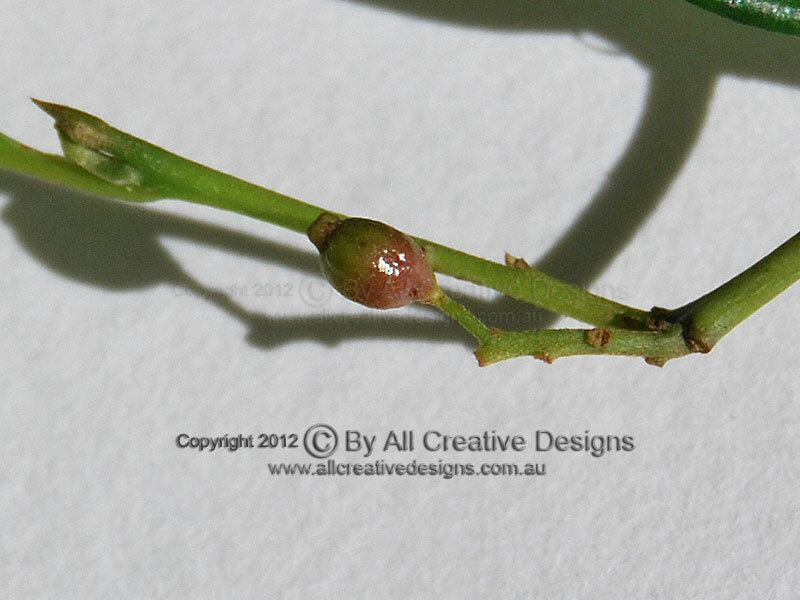 Petiole up to 15 mm long, young stems and growth buds are also short furry hairy (Pictures 4 & 5). Distribution: NSW mid-north coast to northern Qld. 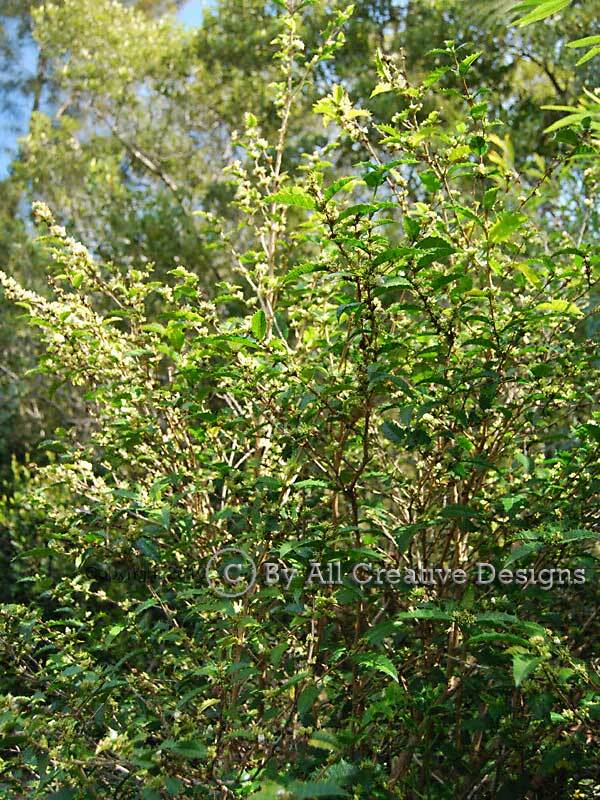 This species belongs to the genus Prostanthera, commonly and collectively known as Mint Bushes due to the scent emitted when a leaf is crushed. 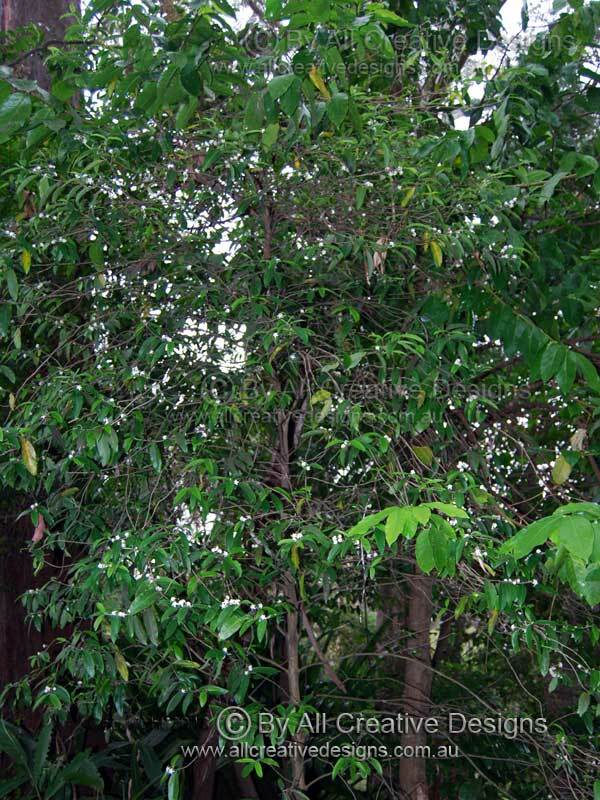 It is a small sized understorey tree found in different types of rainforests, transition zones and in drier open forests (1). 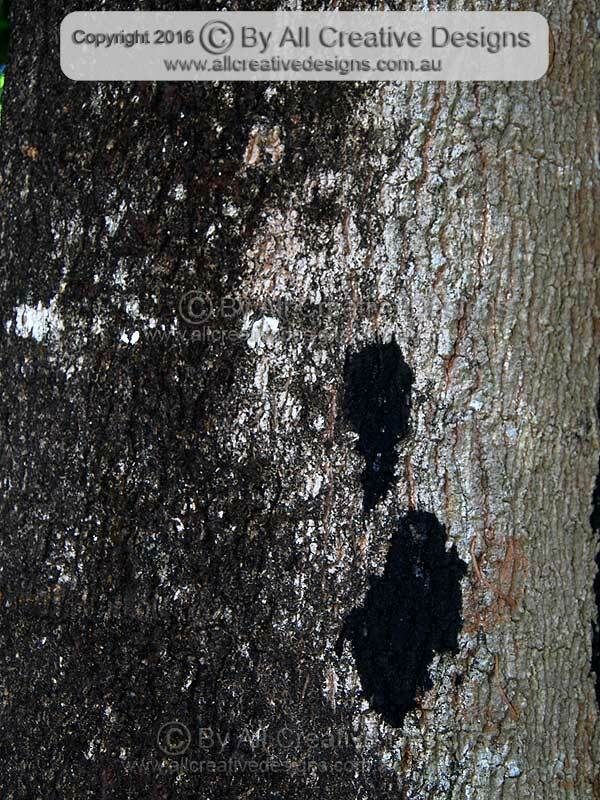 Bark is dark brown to nearly black in colour and has finely rough texture (2). Gorgeous flowers consist of hairy white petals including two pairs that are fused for more than half their length and form rounded lobes at the apex. The prominent anthers, seated in the mauve centre, are orange coloured and supported by filaments of unequal length. Flowers are borne on small racemes or panicles and bloom over the summer months. The remaining flower calyx formed by 2 overlapping sepals (lips) surrounds the developing fruit (3 & 4). 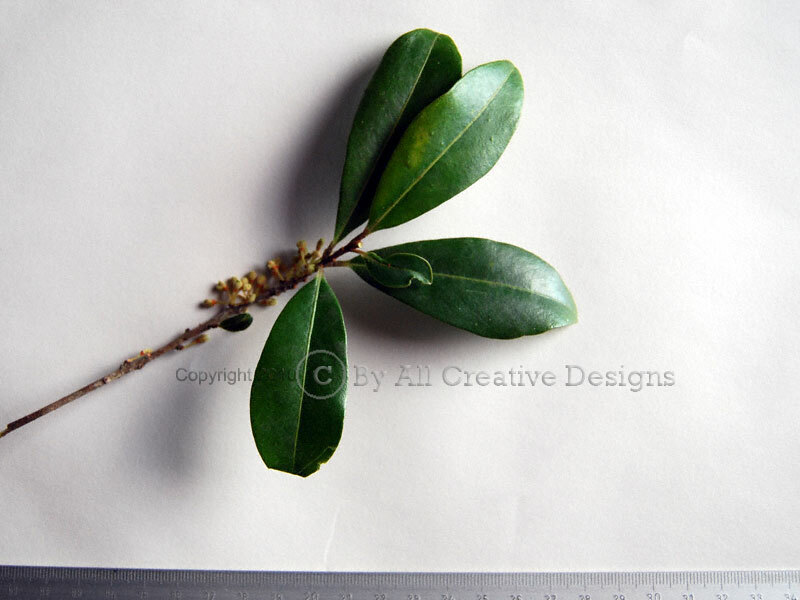 Simple leaves with an opposite arrangement are; up to 12 cm long, lanceolate in shape with toothed to nearly entire margins, hairless, dark green on top, considerably paler beneath, mint scented when crushed, firm and smooth in texture. Venation is conspicuous on lower leaf surface and shows an intramarginal vein (5). Distribution: Tas., Vic., NSW to southern Qld. 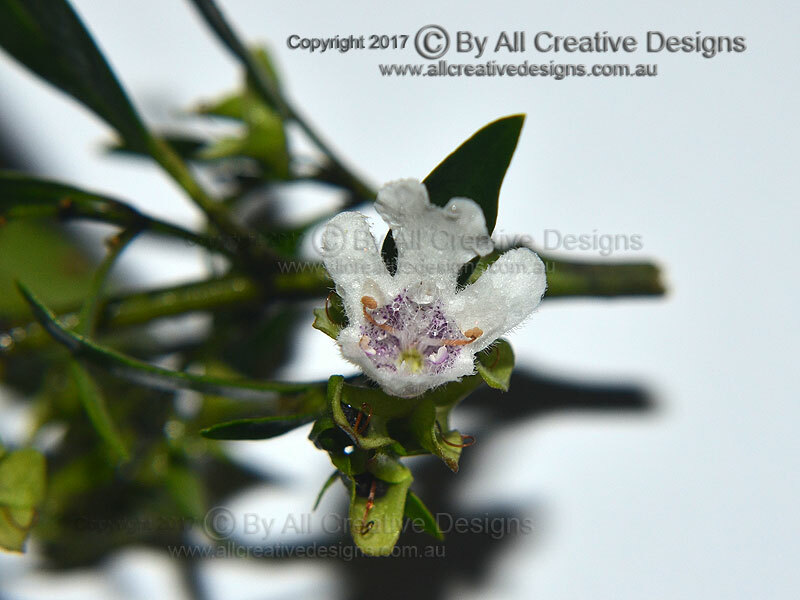 See also: Cut-leaved Mint Bush (Prostanthera incisa) Page 3 and Blue Mint Bush (P. caerula) Page 2. We have cross referenced our tree images and samples using these Resources to ensure that botanical identification is correct. 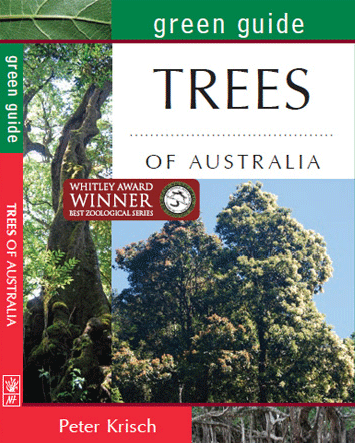 It is recommended to cross reference your plant material or photographs with the source list provided when identifying any Australian tree or shrub. Leaves are an important factor as the are present all year and together with matching bark, size and shape characteristics can lead to a positive identification. 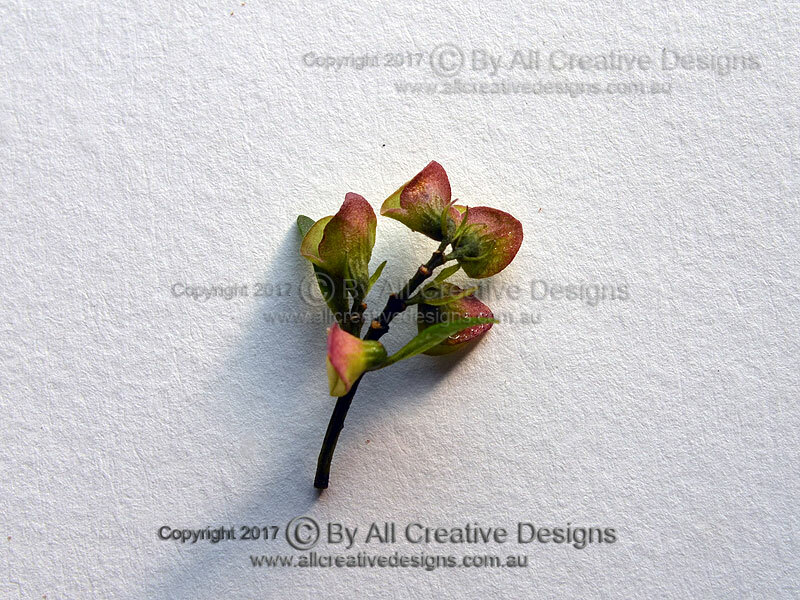 There are only a limited number of semi or fully deciduous trees or shrubs growing along Australia’s east coast, making it a useful identification feature in itself. A long term interest into our native forest species provided the photos, descriptions and measurements for any tree species shown. Information on distribution ranges of tree and shrubs has been collected using a selection of sources (see link above) and from botanical gardens.